Today is the LAST day to get your entries in! Make every post a winner. Only 2 days to go, enter now! 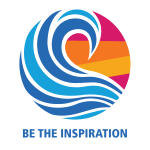 Developing the next generation of leaders is the core of Rotary's support for youth and young people in the greater Caloundra area. 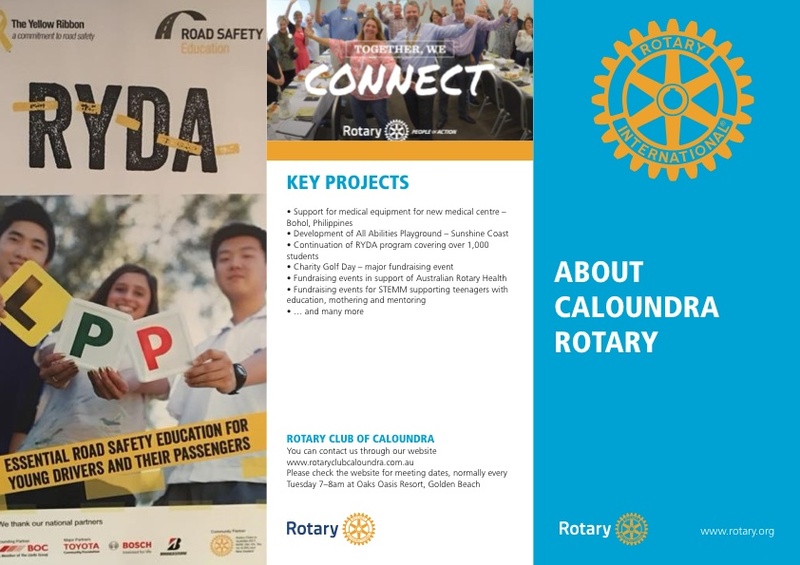 Caloundra Rotary - like Rotary Clubs across Australia - sponsors young people in the development of skills in the areas of communication, leadership, road safety education and driver awareness, resilience and self esteem and in furthering their career aspirations in the areas of mathematics and science. Many good fundraising ideas come from you, Rotarians in the field. Over the years, I can think of a couple that have caught on. 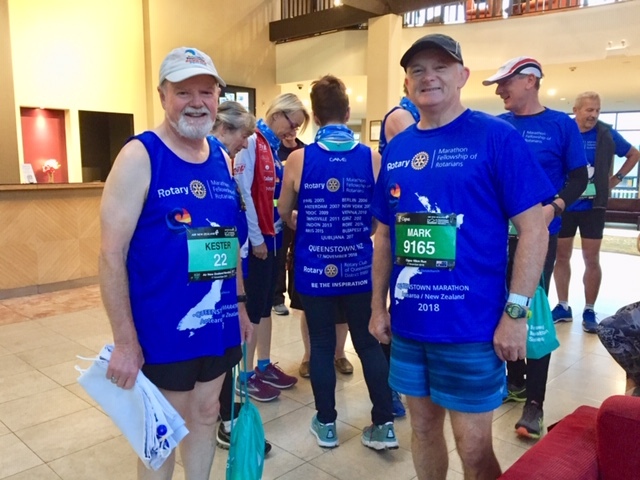 They both began in the creative minds of committed, dedicated Rotarians who saw a need to raise awareness of The Rotary Foundation and took action. The people who know me best — my family — know that my passion for Rotary is boundless. They also know that I don't expect them to get involved in Rotary the way I have. It's a choice that's up to them. But I must admit, I can't help smiling when I see them making the right choice. This month, let's Be the Inspiration to the young leaders in our communities by mentoring them, engaging them, and working side by side with them on meaningful projects. It's an investment in their future and in the world they will live in after we're gone. And it's work that will forever enrich their lives, and our own. 10 days to go - get busy! I am exited to report 137mm from last Monday arvo until Friday. Tremendous rain and because it was such a massive system pretty well everyone on our patch got something. Most got more than us in Longreach but some didn’t fare as well as us. Not drought breaking rain but another morale boost and people. 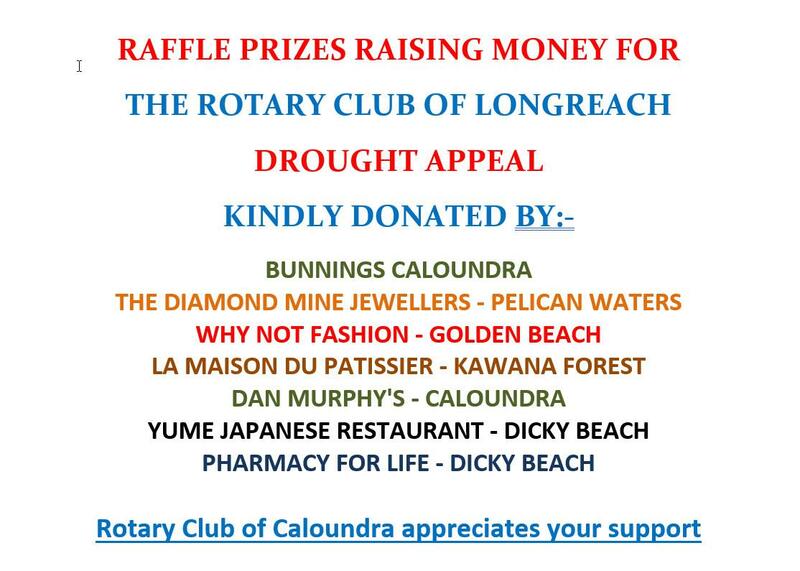 The Rotary Club of Longreach would like to thank all those clubs in the district that have donated monies to the Longreach Drought Appeal was launched in May 2015. Mark and Irish represented the club for the Anzac Day Service at Caloundra State High School. Pics are the school captains who MC the event and Ms Julie Pozzoli giving the principal's address. A big thank you to Darryl for organising this event including the excellent breakfast. The 2019 Council has completed its work. Among its most important actions, the Council elevated the status of Rotaract clubs, allowing them to join Rotary International the way that Rotary clubs do. The change is intended to increase the support that Rotaract clubs receive from RI and to enhance their ability to serve. 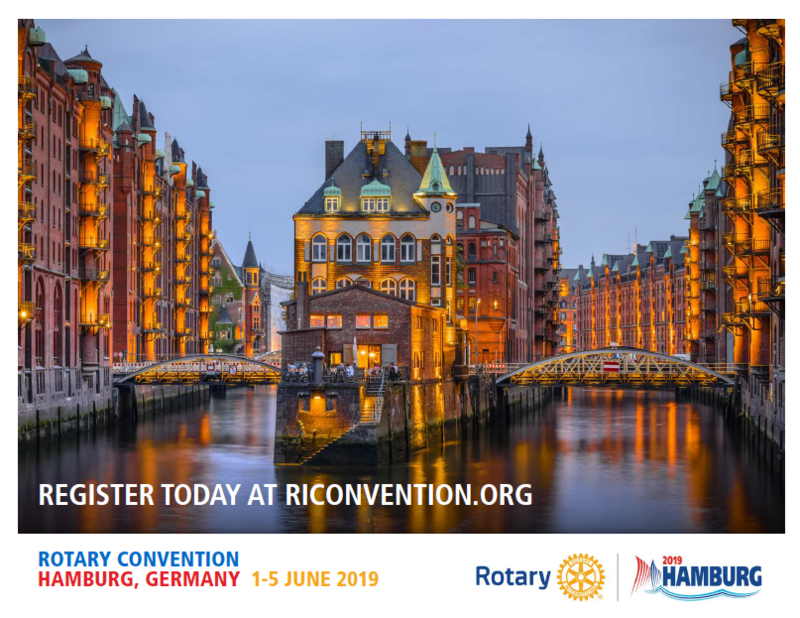 The Council is made up of representatives from each Rotary district, and meets every three years in Chicago, Illinois, USA, to review the rules that govern the organization. Population 1,365,638,335 Has 3,735 Rotary Clubs. Today we acknowledge Rotary Club of Udaipur in Rajasthan. Udaipur’s Population 451,000 and has 9 clubs. Rotary Club of Udaipur meets at its own Building Thursday 7.30pm. It has 174 members and appears extremely wealthy. And many more including providing a vehicle to transport bodies to local morgue. 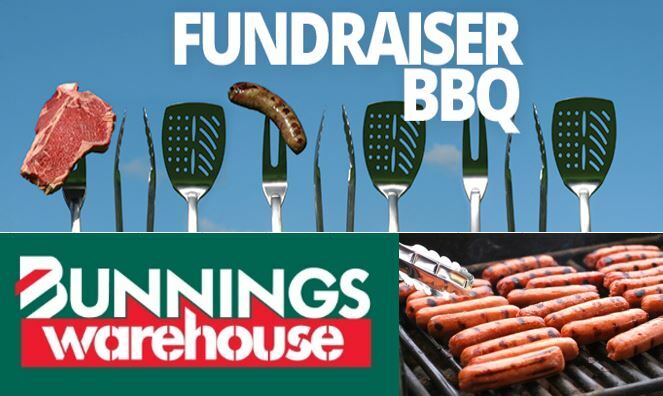 Our next BBQ is being held at Bunnings on Wednesday 24 April. 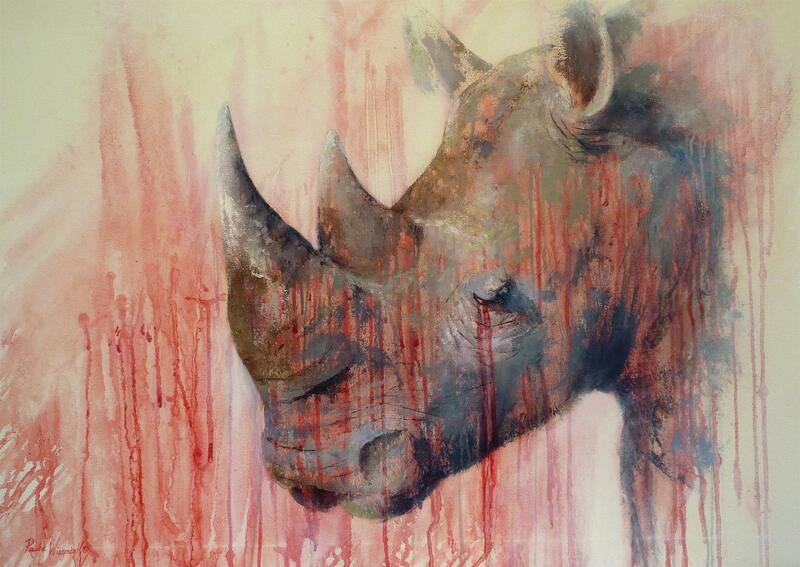 If you can assist please register at this link - obviously the more that can help the better! 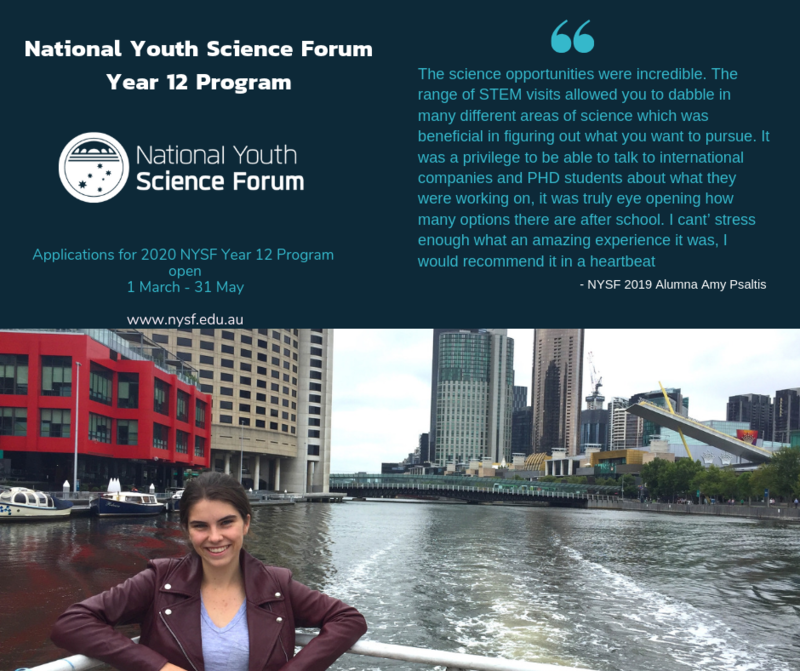 National Youth Science Forum (NYSF) students Emily Morcom (Caloundra High) & Stephanie Keenan (Pacific Lutheran College) report back. Thank you for supporting me in this amazing experience. Paris has 21 Rotary Clubs and the Rotary Club of Paris was the first club formed in France. Projects include Foodbank drive - on two days in January collected 11,000kgs food equivalent to 20,000 meals distributed by the Food Bank. Blood Donation Drive resulting in 168 new donors over 2 days at University of Paris. 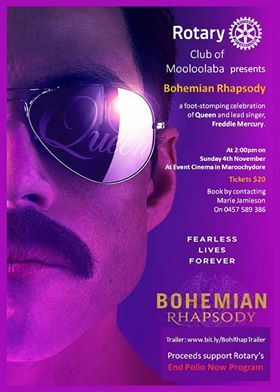 The club is having a Film Night on 26 March - DUMBO. Timor Leste - Adventure Challenge, 2019. Timor Leste - Study Tour, 2019. Areas of Focus - Water and Sanitation. District Designated Funds - Best Practice. Roger is speaking on Caloundra's History & Heritage. Gough Whitlan defined heritage as "the things we want to keep"
A little boy is born in Bangladesh. He is only 36 hours old – and not yet named – when he is taken to Dr Tanveer Ahmed, a plastic surgeon at Dhaka Community Hospital. The baby was born with amniotic band syndrome in all four of his little limbs. This condition caused auto amputation of some of his fingers and toes, and a clubbed left foot. Doing good in the world doesn't just happen. In addition to having the people to carry out projects, we must also have the funds to make them viable. That's where each of us comes in. We, our partners, and our beneficiaries are the sources for those funds. I hope each member will make our Foundation a charity of choice so we can continue to change lives and improve the world. Every two minutes, somewhere in the world, a woman dies from preventable causes related to pregnancy and childbirth. And babies whose mothers die within the first six weeks of their lives are far more likely to die themselves than babies whose mothers survive. As I've travelled around the world as president of Rotary, I've met families for whom these aren't simply tragic statistics. But I've also met people who are devoting themselves to helping mothers and children — and because of them, I'm hopeful. 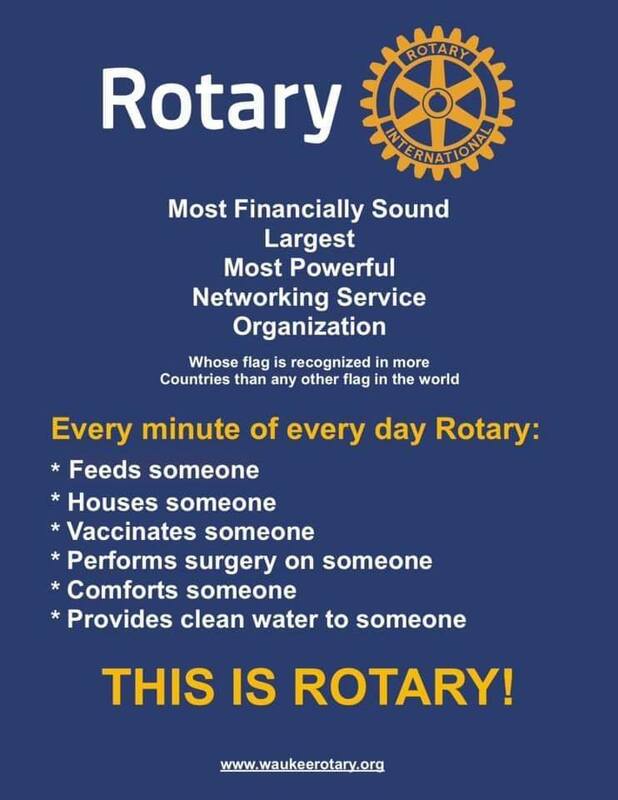 And because many of those people are Rotarians, I'm also proud. April is Maternal and Child Health Month in Rotary, so it's a perfect time to tell you about some things Rotarians are doing that will make you proud too. Because of our networks ... and our expertise ... we're able to serve in a manner that has no equal. And we're able to Be the Inspiration as we help those who need us most. 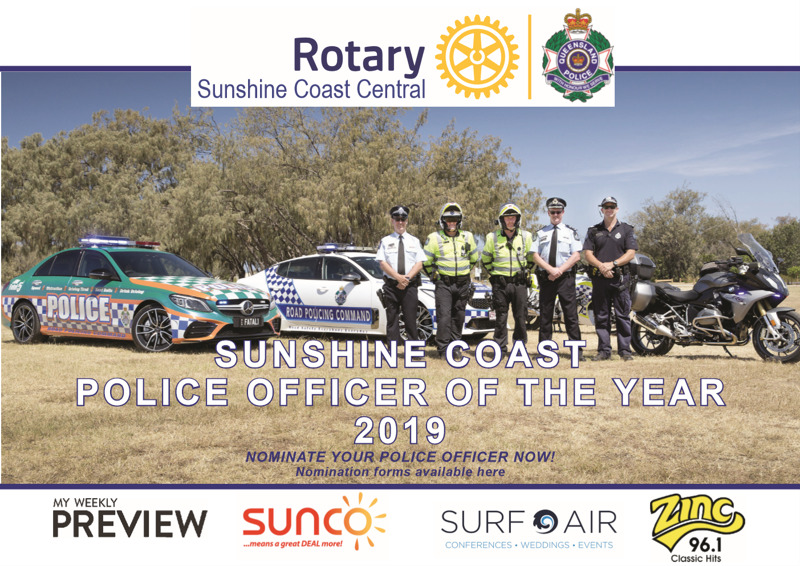 Rotary Sunshine Coast Central are currently seeking nominations for this award which acknowledges a police officers’ abilities and actions including bravery, community involvement, professionalism, understanding, compassion or simply making your day a little easier. Have you encouraged your children and grandchildren to enter? 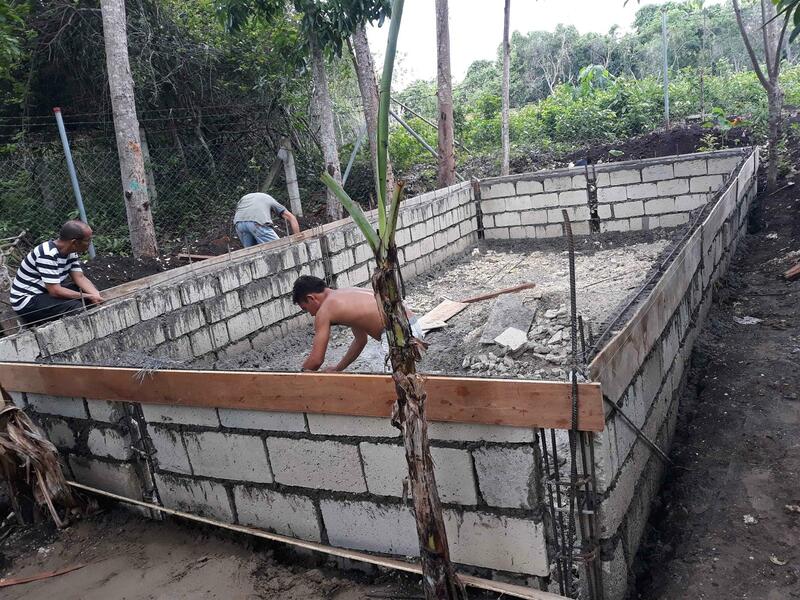 The construction of the medical clinic in Bohol is progressing very well and according to schedule. 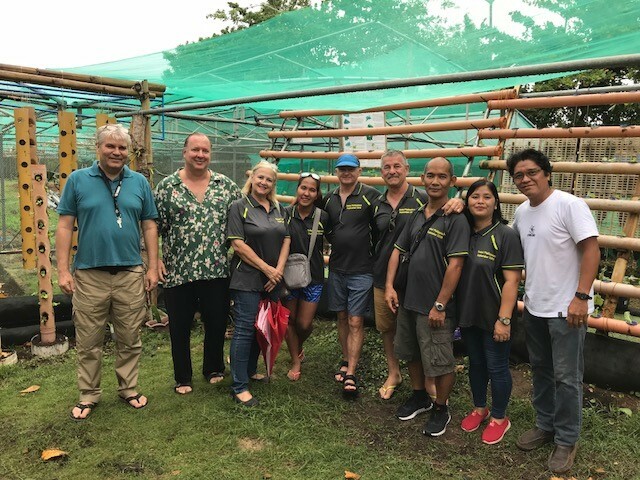 During our recent trip, Mark Ward met with our partner clinicians (Doc Mai Albarando Sara and Kuya Doc Noeh Ortega Fernandez) and potential charity partner (Brotherhood of Christian Businessmen & Professionals) who will provide the much needed clinical skills on a volunteer basis. He is also happy to announce that the facility will also be used to train future eye doctors as part of their degree! We currently have a number of volunteers from the Rotary Clubs of Gladstone (Queensland) and Balwyn (Victoria) who are working to complete the final stages of the building – e.g. painting, light fittings, etc. We’ve also been receiving a steady flow of donations to purchase medical supplies and equipment – which is really great. Our heartfelt gratitude to Rotary Club of Balwyn, Rotary Club of Gladstone Midday, HPI, Jason and Leanne Buchholz and other individual supporters for helping us reach this point! Although we still have a long way to go, we are already looking forward to providing basic health services to many disadvantaged children and families in Bohol! If you have heard something about Rotary & you aren’t sure if it’s fact of fiction, send us a message. We are looking forward to hearing from you. 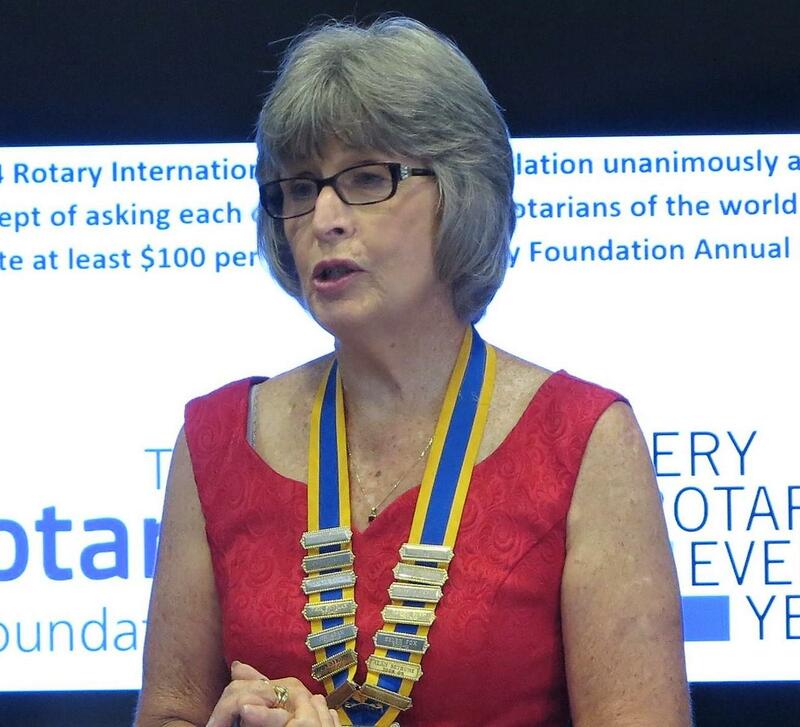 President Bernie reports from our Rotary District Conference being held in Brisbane this weekend. It sounds like a good news conference. Tony Lilou of the Rotary Club of Kokopo joined our delegates for this group photo. No doubt there were many reminescences of the cruise visit there in 2017. Bernie had the privilege of introducing President Heath Sanders from the Rotary Club of Murgon and Dane Kapernick. Heath spoke about the gift of a truck of hay and blocks of salt to help a local farmer out. Dane spoke about why he donated the hay, putting a big emphasis on education. Over 300 Rotarians, Rotaractors and family members were in attendance. Great energy in the room as delegates heard from inspirational speakers, met up with friends and made new ones. 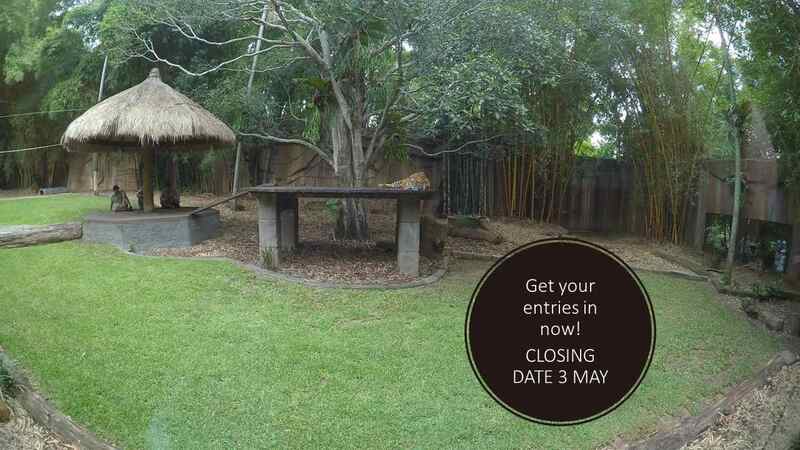 Time is running out - encourage your children and grandchildren to take their photos and enter. First and foremost - congratulations to the Gordon and his Golf Day Committee for a wonderful day. 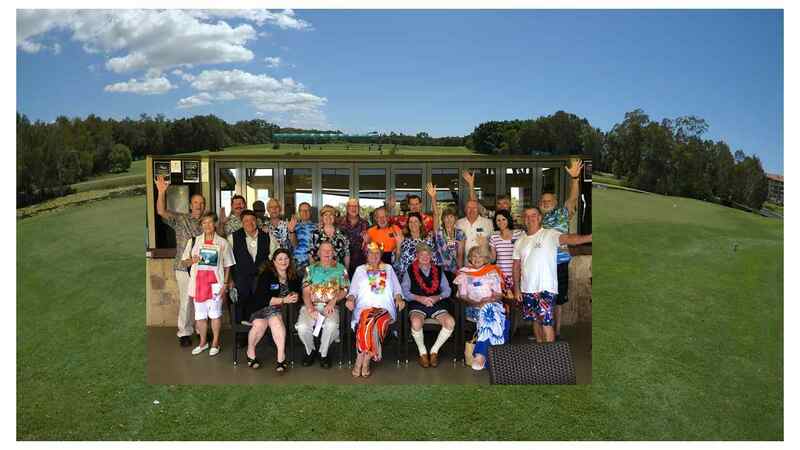 It was a happy and enjoyable day and many of the participants went all out to make the day an enjoyable one with their costumes and golf carts dressed for the occasion. All who attended, played and worked made the day very special. The weather behaved and all the players were in the clubhouse before the heavens opened up. Great work. Please take the time to look at the photos and video that Les has produced, it is excellent. Our deepest sympathy to the community of Christchurch on hearing the news of the shocking act of terrorism last Friday. When we are looking for Peace and harmony amongst all peoples worldwide for this to happen so close to home is devastating. Over 100 golfers participated in a great event last Friday - check out the video! A more detailed report is expected next week. Chris chaired the meeting and welcomed guests Naomi and Lorraine, Sally, Ian, Leigh (from the Rotary Club of Plimerton, NZ) and Irish. Population of Dengie Peninsular 20,000, Burnham on Crouch 7671. The club has about 40 members,. 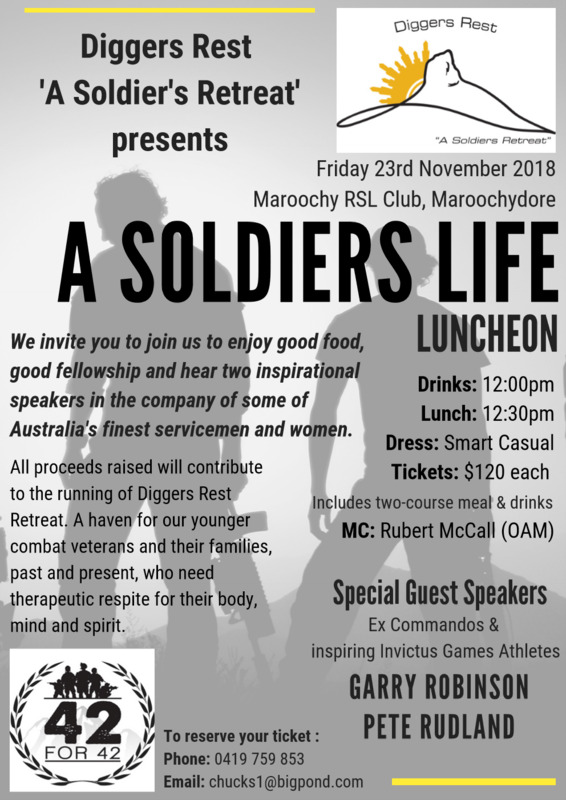 As well as raising funds for charity & supporting good causes in our community, the club has an extensive social programme & functions which are enjoyed by it's members, families, and friends. Actively engaged in Rotary Youth Exchange, Interact and RYLA (Rotary Youth Leadership Awards). The club sponsors a 10 mile fun run around Burnham on Crouch which attracts 300 runners. And annually it has a two minute shopping dash at a local supermarket which - won the last winner about $500 in goods. 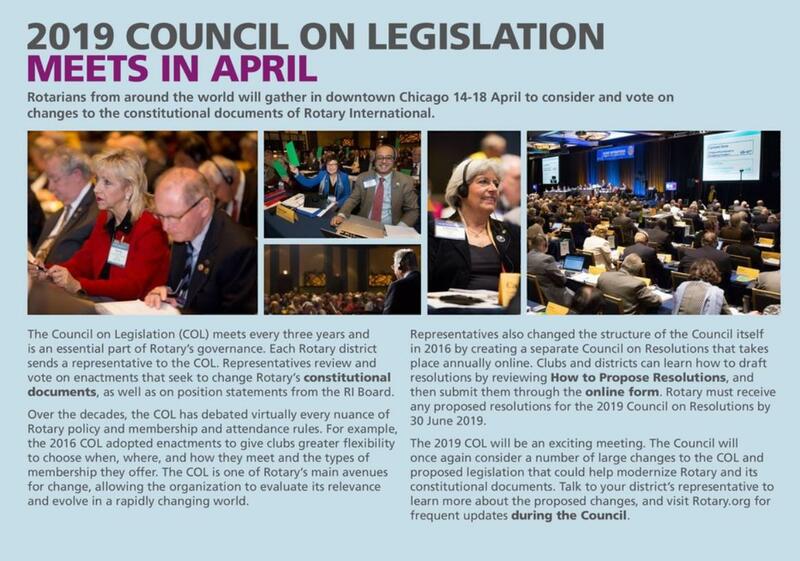 Rotary members from all over the world will gather in Chicago 14-18 April to consider changes to the Constitutional documents that guide Rotary International and its member clubs. The Council on Legislation (CoL) meets every three years and is an essential part of Rotary’s governance. The representatives — one from each Rotary district — review and vote on proposals that seek to change Rotary’s constitutional documents. 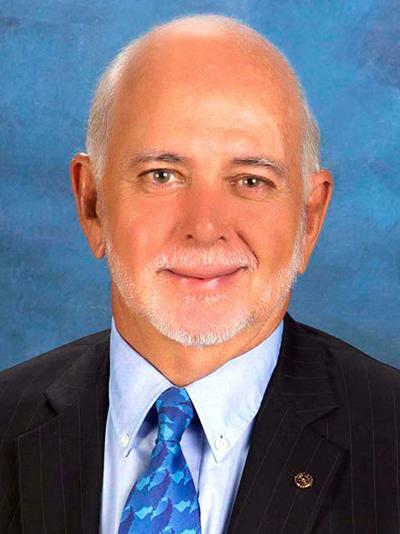 This year, the council will consider more than 100 proposals, including one new item and three recently amended motions from the Rotary International Board of Directors. Hopefully it will not take three years to reflect in our constitutional documents any changes that flow from the 2019 CoL.
Country: Djibouti has a population of 956985 in 2017, relatively safe country and has two Rotary clubs. Djibouti, on the Horn of Africa, is a mostly French and Arabic-speaking country of dry shrublands, volcanic formations and Gulf of Aden beaches. It's home to one of the saltiest bodies of water in the world, the low-lying Lake Assal, in the Danakil Desert. The nomadic Afar people have settlements along Lake Abbe, a body of saltwater featuring chimneylike mineral formations. On the occasion of the celebration of the international day of women's rights, the Rotary Club Djibouti Red Sea, has distributed kits of first necessity to women incarcerated in the prison of Gabode. These were composed of dresses, shawls, shampoos, soaps, sanitary towels and cologne. The Club organised this action for the third time and emotion is always so strong, on both sides, during the meeting and exchange. Officer Hibo who greeted us thanked us on behalf of the entire correctional institution for the action and asked us to multiply this kind of initiative. We are again looking for volunteers to help setup and assist in the running of another successful RYDA day preparing our young people for life on the roads. 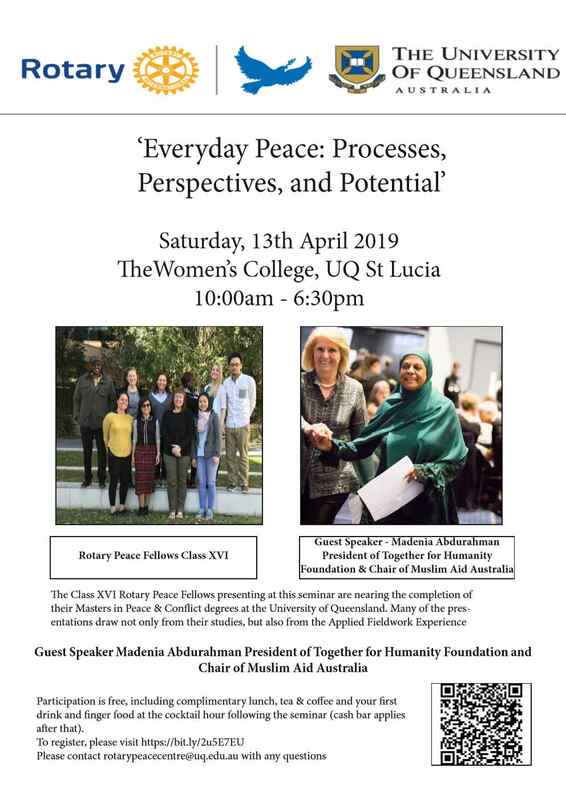 Separate invitation emails have been emailed on which you may register your attendance or apologise if you cannot help; you may also register direct at the below links. To be clear, we need you please to volunteer for all days that you are free to assist - especially on 27 March when we also have our regular BBQ at Bunnings. What is a Satellite Club? Satellite clubs began as a Rotary International Pilot Program three years ago. The Rotary Club of Boulder was the first to create a satellite club, and it was so successful that Rotary leadership agreed to allow other Rotary Clubs the same opportunity. Provisions for a Satellite club have been included in the 2016 constitution and bylaws for Rotary clubs, and have been included in the drafting of our new Constitution and Regulations - building in future flexibility for our club. A satellite club meets at an alternate time and location – typically chosen to appeal to young professionals who may not be able to take time during the work day for Rotary meetings. 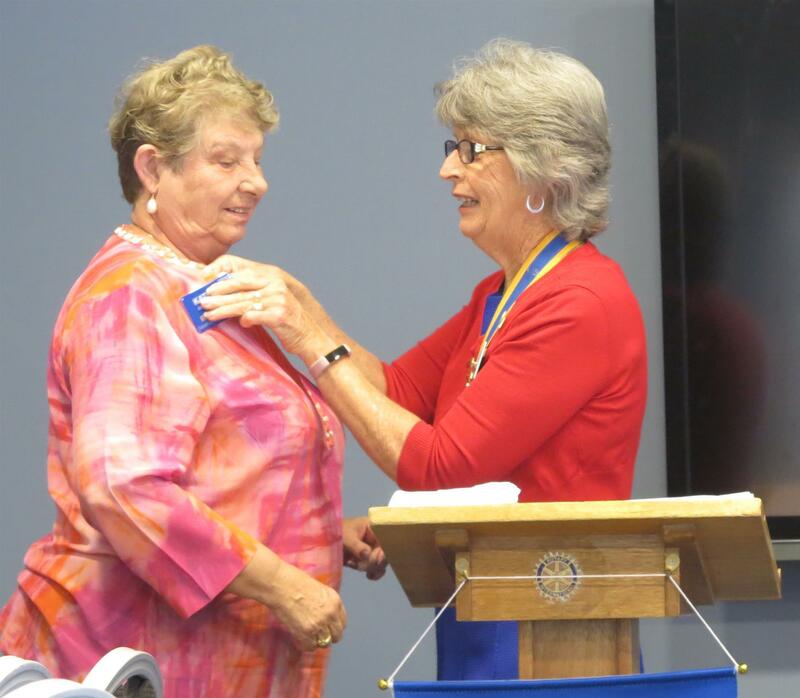 The satellite club members are full Rotarians, inducted into the sponsoring club. However, the alternate times and potentially lower dues allows more young professionals and others to join Rotary. Membership is not exclusively for young people. Members are welcome to attend either the sponsoring club or the satellite - anytime. Some clubs also hold a 'co-meeting' once a month during happy hour when all members of both groups are invited to mingle and meet. 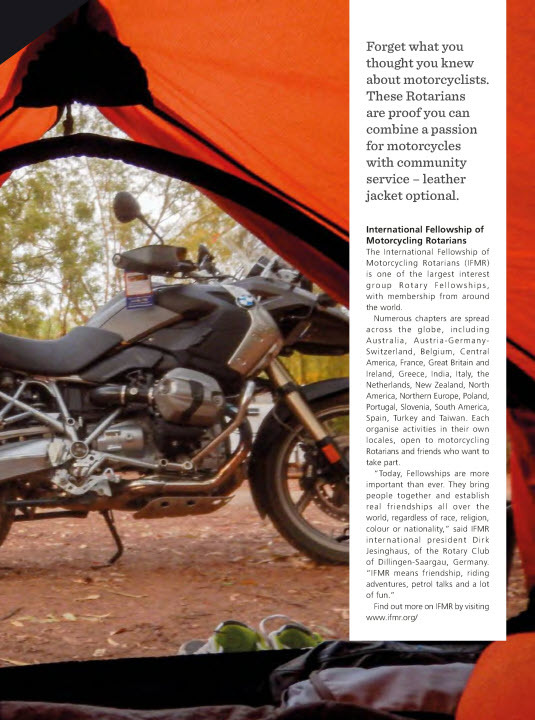 The satellite club may take on some of their own projects in addition to supporting the sponsoring club through committee membership, service, etc. Like most Rotary projects, the most important thing to set up a satellite like this is a champion who can spearhead the creation of the satellite. They will recruit others, decide on meeting times, and get the meetings going. Do you know someone who might be interested? If so, let Chris Rees know. Absolutely! 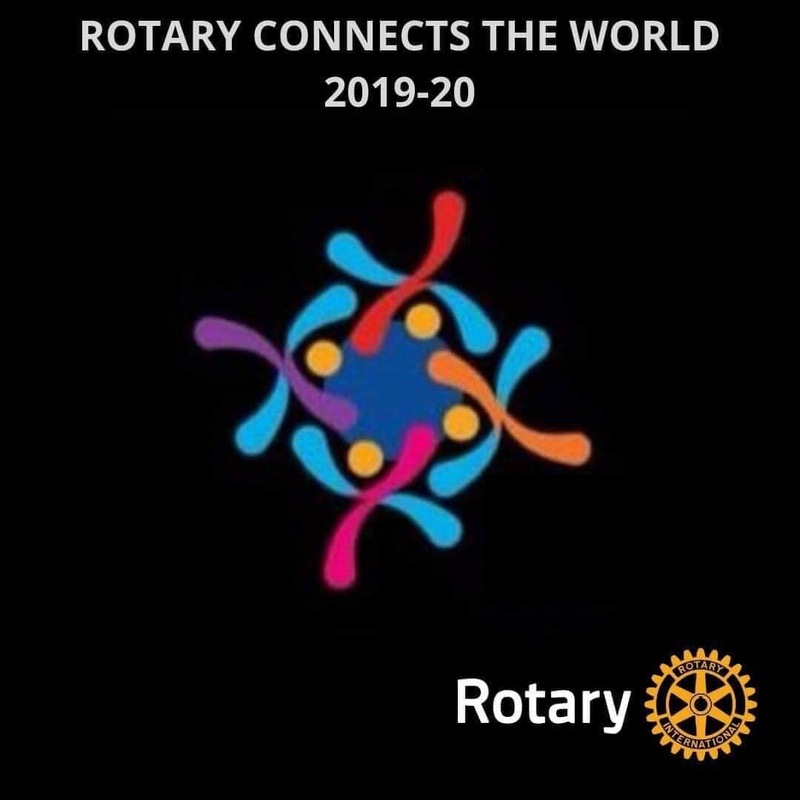 A satellite to a Rotary Club does not in any way alter or go against a club's charter or its statutory documents, it simply creates an opportunity for young professionals (and other potential members) with less flexible work schedules to be active members of the sponsoring club. 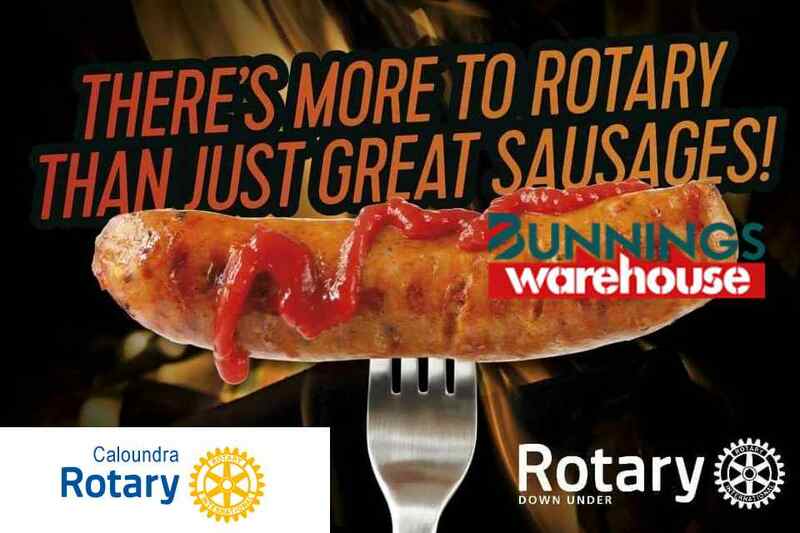 Our next BBQ is being held at Bunnings on Wednesday 27 March - we also have RYDA that day. Mark brought in some battery backup in case Oaks couldn't produce enough power. Turns out the case was a demo only, with the lithium batteries and inverter a bit too heavy to carry in. For more detail about the meeting click the 'read more' button. Caloundra Rotary - in conjunction with a Global Grant from The Rotary Foundation and other clubs & districts in Australia and India - is involved in a US$31,500 project to provide 40 bio toilets in 10 urban slums; originally 20 slums were to be targeted but the reduced number will provide greater effectiveness. Rotary International President Elect, Mark Maloney handed over the first of the 10 slums to receive the bio-toilets on 20 February. The project will be completed by the end of this month with all 10 slums being provided with safe, clean bio-toilets. 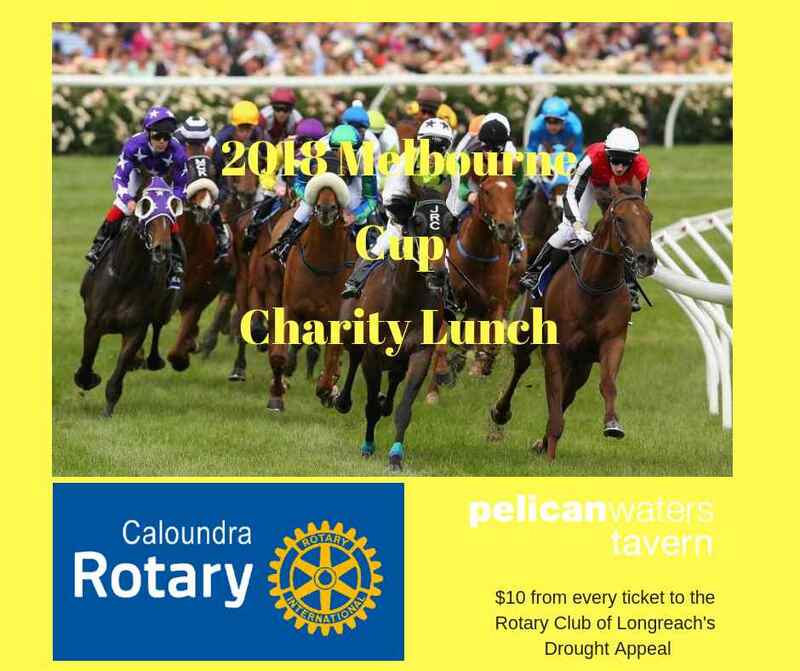 Thank you to the members of the Rotary Club of Caloundra for your support for this project. Without your request and support, we could not have achieved this. THANK YOU. Bhubaneswar is the capital of the Indian state of Odisha. It is the largest city in Odisha and is a centre of economic and religious importance in Eastern India. Bhubaneswar is often referred to as a "Temple City of India". But ..... there are 338 unauthorised slums in Bhubaneswar - many households do not have toilets and a few who have sanitary toilets have no drainage, water and maintenance facilities!! Probably first and foremost is the club's Annual Charity Golf Day on 15 March, which is looming on the horizon. 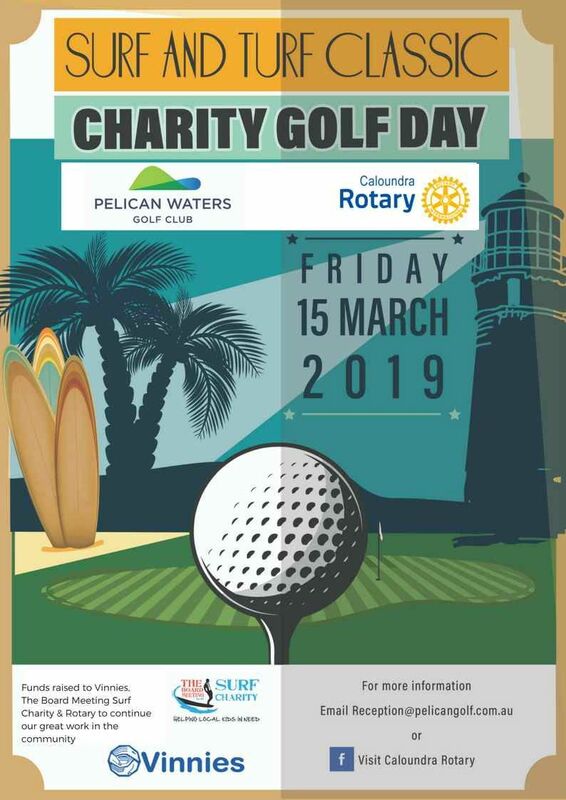 Our Golf Day Committee has worked very hard to make this day a really extra special fundraiser as this will be our last Golf day held at Pelican Waters. So please get behind this project and make it as big as we can. Raffle tickets and monies are to be handed in at this coming Tuesday’s meeting please. On 22 - 24 March we’ll join together at the Grand Chancellor, Brisbane to celebrate our annual conference. 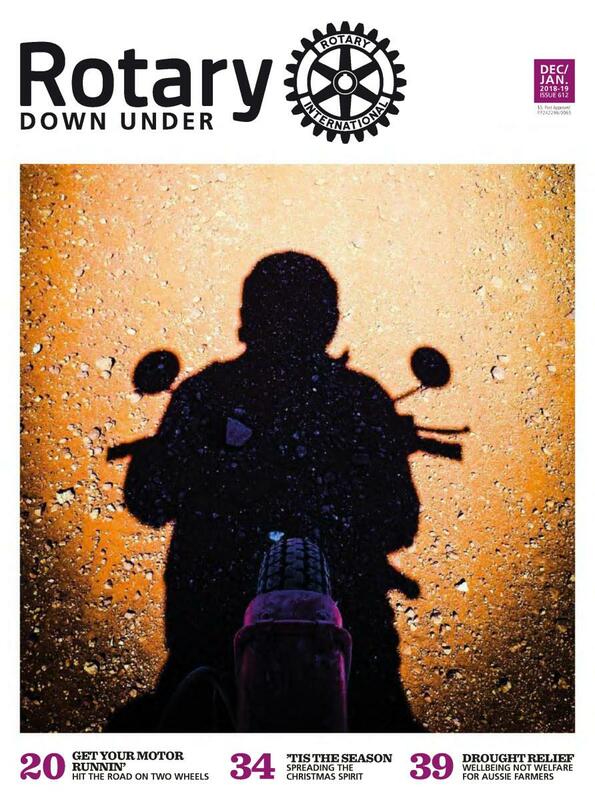 The Sunshine Coast Photographic Competition is open now and closes on 3 May. At the District Changeover, Governor Wendy related a story of two boys and the days they started wearing a pink shoelace. It was a true story and gave her the opportunity to paint the vision she has for our District 9600 clubs this year. We need to all be looking for those who are different, looking for those doing it tough and we need to decide how we, as active Rotarians in our communities and across the globe will take steps to show them we care, to show them that we are serious (albeit while we are in the midst of fun and fellowship) in our commitment to being the inspiration to improve their opportunities in life. Maybe we walk quietly beside them, maybe we give them the resources to alter their situation or maybe we actively roll up our sleeves and participate. Whenever we do, as individual Rotarians or as a club we need to remind ourselves that this is our PINK SHOELACE MOMENT and before it slips away we need to capture an image. Every one step can be an inspiration - looking at them together they have the capacity to let us see how transformational Rotary truly is !!!!!!!!!!!! By raising money for one of the following charities you will be in the running to be crowned STRAWBERRY KING OR QUEEN ! Although work remains before we fully end polio, we can be proud of the incredible progress we’ve made, working with our partners in the Global Polio Eradication Initiative. As we begin 2019, Rotary is advancing toward our top goal in five notable ways. 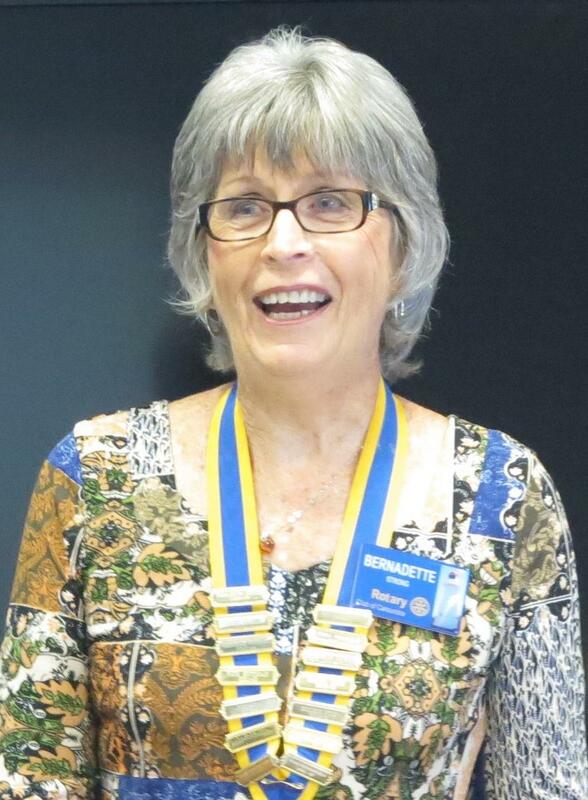 Anne was our chairperson and gave us a warm welcome to the "Best little club on the Sunshine Coast". Great meeting with guest speaker Dean Aitken, celebrant and author of "Good Grief" who believes that tough times don't last - resilient people do. Dean helps transform lives through sharing his life's journey. Worthy mention for the International Toast which recognised Rotary's 114th birthday, so PDG Alan appropriately toasted the very first Rotary Club operating as ROTARY/One. The redesigned Learning Centre offers a whole new learning experience. Did you take the virtual tour? The original office was located in the former Unity Building on Dearborn Street in downtown Chicago. 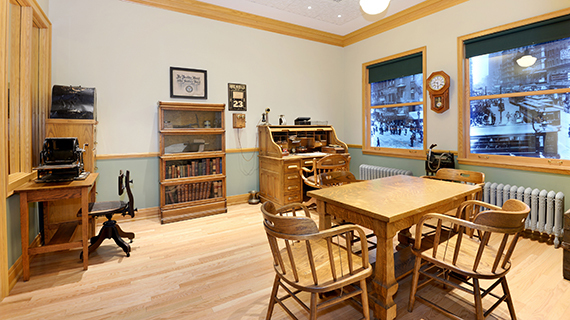 In 1980, local Rotary members rented it and gathered period furnishings and fixtures to re-create the look and feel of an early 20th century office. Later, they organized the Paul Harris 711 Club to continue supporting the room and the story it tells. When the Unity Building was set to be demolished in 1989, they dismantled the room and arranged to rebuild it later at Rotary world headquarters. The room was initially recreated on the 16th floor of One Rotary Center. We relocated it to the first floor as part of a remodeling in 2014, improving access for visitors who come to Evanston. We wanted to give our members around the world an opportunity to experience the room without traveling to Evanston so we created a virtual tour. Virtual visitors can guide themselves through the room and click on select items to learn about them and about Chicago during the era when Paul Harris moved to Chicago and started Rotary. The interactive tour isn’t just for people who can’t come to Evanston. It offers elements not available onsite, such as audio recordings of Paul Harris (hint: click on the phone). Armchair travel is encouraged! 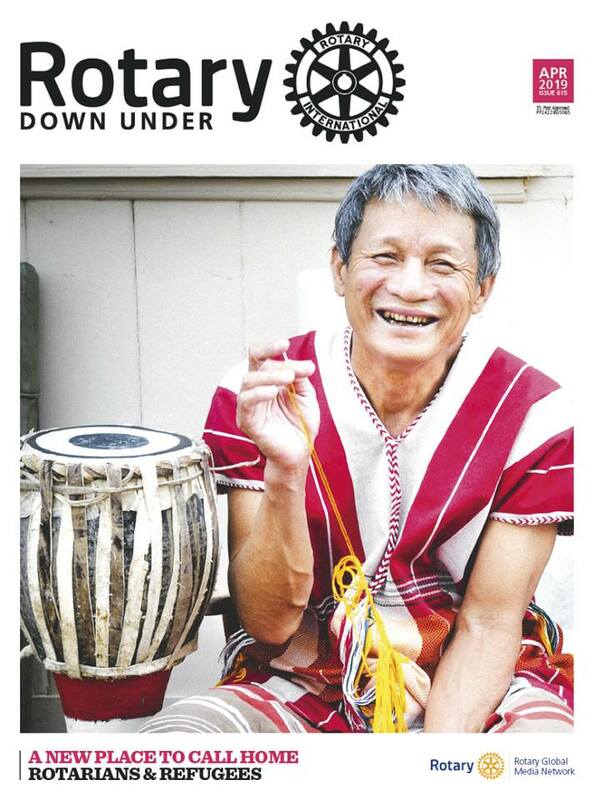 This year, 23 February, marks the 114th anniversary of Rotary. Read more about Room 711 and take the virtual tour. This is one of several spaces at Rotary headquarters that visitors can walk through to learn more about Rotary. Find out how you can schedule a tour. Image: Room 711 on the 1st floor of Rotary headquarters in Evanston, Illinois, USA. 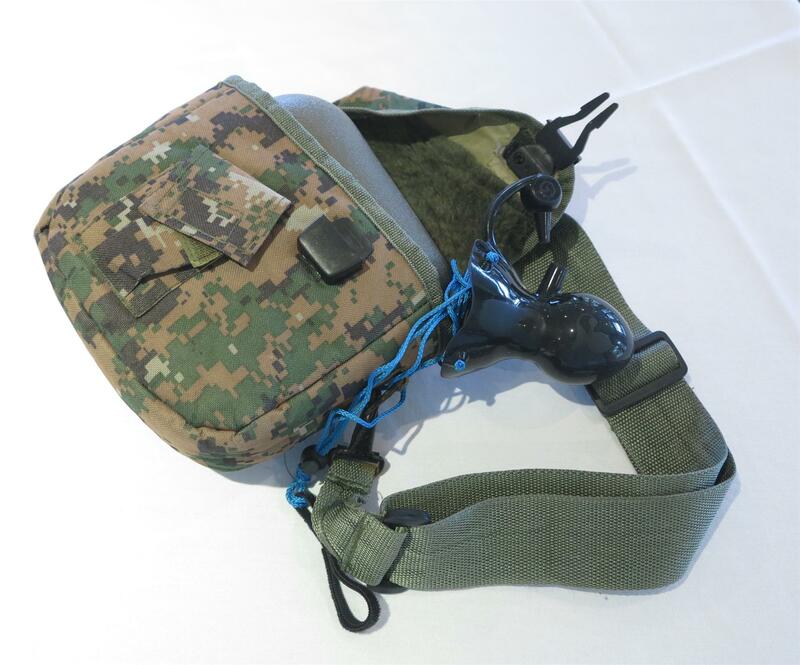 Innovation and flexibility. Those are two words you hear a lot today when we think about any organization adapting to a rapidly changing environment. 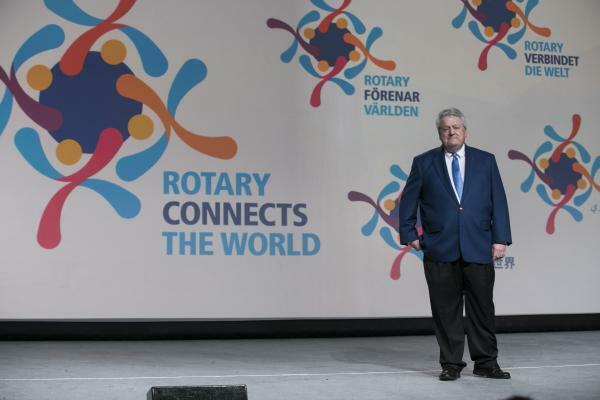 But what do those two words mean for Rotary? In short, they will define Rotary’s future, because they are fundamental pillars of our strategic plan for enhanced impact, reach, engagement and adaptability. If we are really serious about growing Rotary and attracting new members from all demographics, we must innovate. That innovation will need to take various forms. It begins, first, with making the idea of innovation in Rotary a mindset. It begins with developing a culture of positive change and adapting to the needs of our new realities and challenges. Second, innovation is also about transformative technologies. We can call this sustaining innovation – that is, constantly developing our suite of products to serve our existing members. We have implemented this concept of sustaining innovation through three channels of new technology: Rotary’s Learning Center, Rotary Club Central, and an enhanced online membership leads program. Now, all these tools are at your disposal, and many new ones are in the process of being developed. Their consistent use should be a key foundation of our future growth strategy. The third kind of innovation that we must aspire to generate at Rotary is called disruptive innovation. In the world of business, it refers to a product or service, often very simple in its first design. This product or service takes root at the bottom of a market, and then relentlessly grows in popularity, until it displaces established competitors. Think of how the traditional taxi cab business has been changed forever by ride sharing platforms such as Uber, which connects consumers who need rides with drivers willing to provide them. 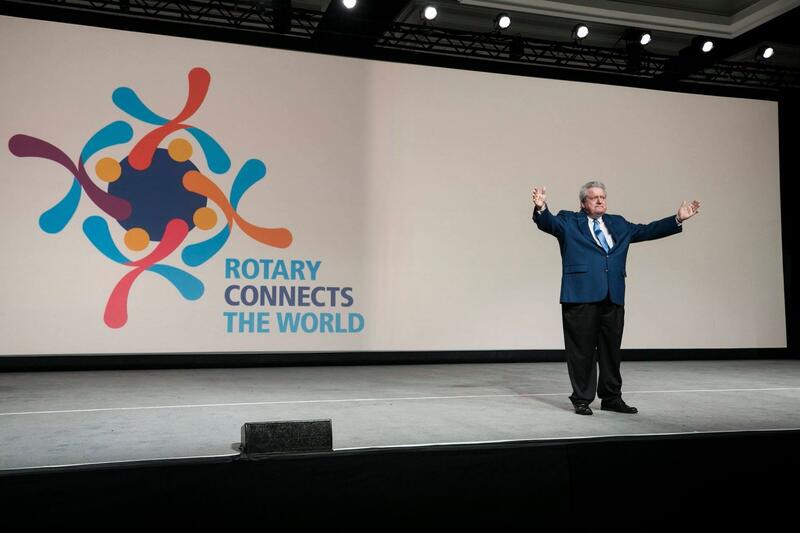 With a growing group of individuals looking for connection, friendship, and an opportunity to get involved in the world around them, Rotary is well positioned to be a disruptive innovator. Imagine for a moment what Rotary clubs could look like in the future. Clubs that could change their meeting schedule and format, can relax attendance requirements, and offer multiple membership types. Think of a club where you can invite Rotaractors to be members of your club while they are still in Rotaract. A club of the future, where measuring adherence to the rules is replaced with measuring progress against goals to improve the community and to grow the club. Well, you don’t have to imagine very far, because these clubs already exist. Next Rotary Generation Invercargill is a family-friendly club in New Zealand with fluid meeting times and venues. While attendance is encouraged, it is not compulsory. The Rotary Club of Aruba systematically engages with its local Rotaract and Interact Clubs to ensure a smooth and natural transition into the Rotary club. As a result, half of the club members are former Rotaractors. Then there are the so-called Passport clubs. Three years ago District 5180 in California began thinking about a club model that would be attractive to younger members who were not interested in attending weekly meetings or paying dues they could not afford. The district chartered what they called a Passport club with 20 members in Sacramento, California. The club meets only six times a year with an optional social event in the month between meetings. In addition to attending the six required meetings, every year passport members must either contribute $1,000 to the Rotary Foundation OR do at least 40 hours of community service with Rotary clubs or other non-profits in the district. This club has more than tripled its membership in three years. A long-term sustainable growth strategy just doesn’t appear out of thin air. It requires a commitment to club innovation and flexibility; a commitment to best serving the specific needs of our communities as they evolve, and to incorporate Rotaractors into Rotary. I challenge all of us to think out of the box, and to grow Rotary through new innovative club models and to try new approaches. I’m confident that we will embrace the opportunities ahead of us through innovation, flexibility and thoughtful change. I have only just realised that on 23 February, Rotary will be in its 114th year. It would be a great idea to maybe wear our Rotary shirts to our Tuesday meeting. 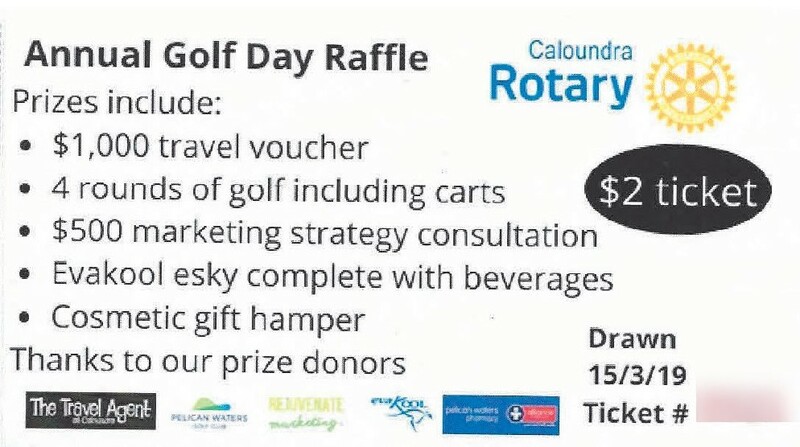 It may be a little late but we will be promoting the Club on a hole at our upcoming Golf day so we can class that as a Rotary Days event. 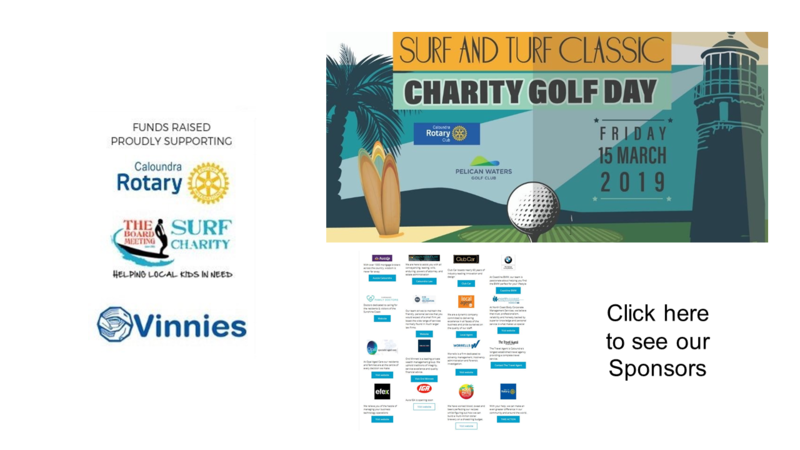 This will give the Club the chance to engage in the community, and hopefully build long-term, local partnerships, and share the significant impact that Rotary has both locally and also globally. I would like to take photos so that it can be shared online especially for our upcoming District Conference. “Our purpose is to mobilize Rotarians and provide global awareness and focused ACTION in the continuing struggle to preserve and protect endangered species. 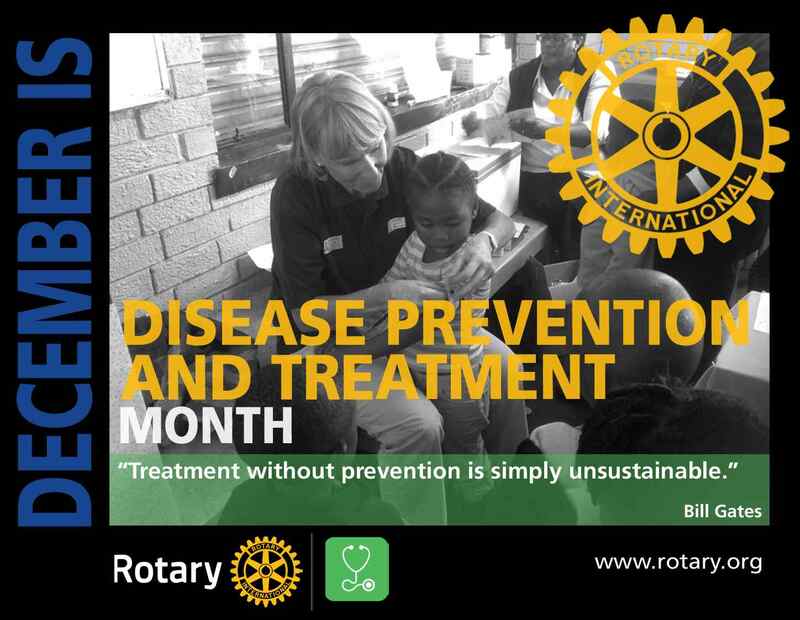 We will be supporting and promoting new and ongoing joint projects with Rotary and Rotaract clubs located in the areas of concern. Just letting you know we finished up with 112mm of rain across nine days with the cloud lifting and the sun coming out last Friday. Haven’t seen rain like that for years. The biggest fall was 65mm starting late afternoon last Tuesday and going through the night. Not drought breaking but it has boosted spirits because the outlook from the experts wasn’t and still isn’t that positive. We were on the edge of the system and until the 65mm arrived we were looking at a pretty meagre total. Still as always happens it doesn’t rain everywhere and a big part of our patch measured nil or nothing useful; mainly to the south-east and east and just to the north. Our enjoyment of the rain is tempered by the utter devastation and staggering stock losses on properties to the north and west of us. Some more rain might turn up for us and we have about two months for it to rain and grow enough feed to get stock through the year. The Tuesday we got the 65mm we had just finished batching up over 500 debit cards loaded with $999 ready to be sent to farmers in the seven shires in Rotary District 9570 (from) support under the Federal (Government's) Drought Communities Support Initiative. We should get another $500k of Federal Govt money at the end of the month. I volunteer with Western Qld Drought Committee and we had a study done to look at a whole host of things, and one of the findings was that outside money coming in to our region can have a multiplier effect up to seven times. We sent the Belvoir-Wodonga Movie Trailer back about a fortnight ago. The Burrumbuttock Hayrunners came to Quilpie so one of our members towed the trailer to Quilpie and it was kindly back loaded to Wodonga. We have our own trailer now. We will wait and see what happens with the wet and then plan our response. Every year we support each Show Society in the region with a donation towards the cost of running the show. Sponsorship is tight so we are sending cheques out a little earlier this year. Thanks for your ongoing support and fingers crossed for more rain. Damian subsequently advised that the club received $500,000 under the Rotary/NFF/Chanel 9 programme which was distributed before Xmas according to the recipient guidelines laid down under the programme. The government funding is also subject to recipient guidelines and accountability. Despite these valuable funds Damian advises that they still need some regular funds for activities that don’t qualify under the above mentioned programmes such as their movie trailer nights , community functions and youth programmes etc so if clubs have any funds left over in their budgets for the current year any donations to RC Longreach Activities Account CBA BSB 064706 a/no 00903648 would I am sure be greatly appreciated. The work that RC Longreach has done in the district over the last few years in the face of a major disaster is truly inspirational and I am sure will continue to be so. Rotary has set up an appeal to raise funds to assist people in recovery from unprecedented flooding across North Queensland. The appeal is primarily aimed at assisting those whose needs are not covered by insurance and government assistance. 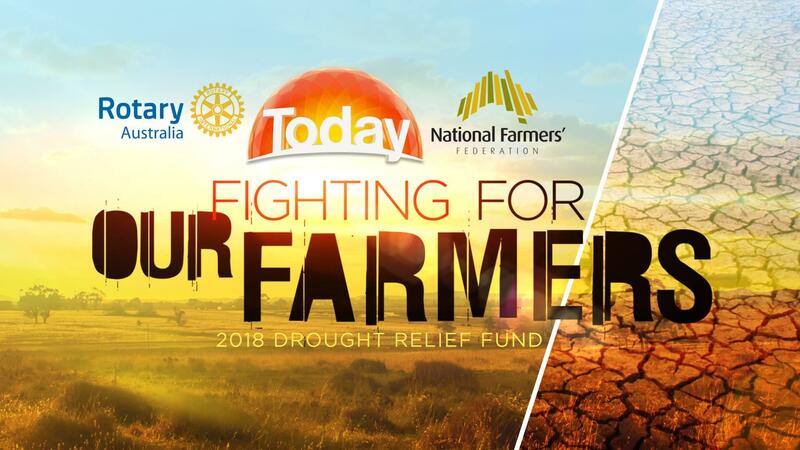 It will be managed by Rotary Australia World Community Service (RAWCS), who recently partnered with Channel 9 in a telethon raising over $10 million for Australians impacted by drought. 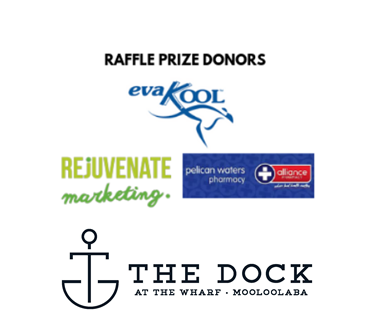 Tax deductible donations are welcomed from individuals or organisations. 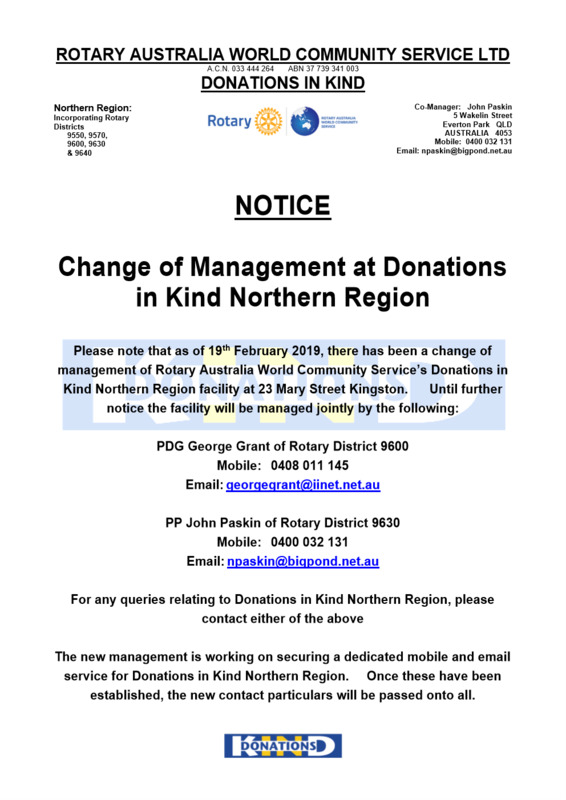 Funds will be distributed with local knowledge, input and compassion by Rotary clubs in Townsville and other organisations in North Queensland communities affected by this destructive weather event. “Rotarians are ‘People of Action’, always ready to assist their communities, especially in times of high need. I commend this appeal to those individuals, organisations and businesses looking for a way to assist the recovery of the communities affected,” said the region’s Rotary District Governor Greg Marlow. If you or someone you know could benefit from appeal funds, email Robert Tardiani at rtar48@hotmail.com or call 0408 874 204. 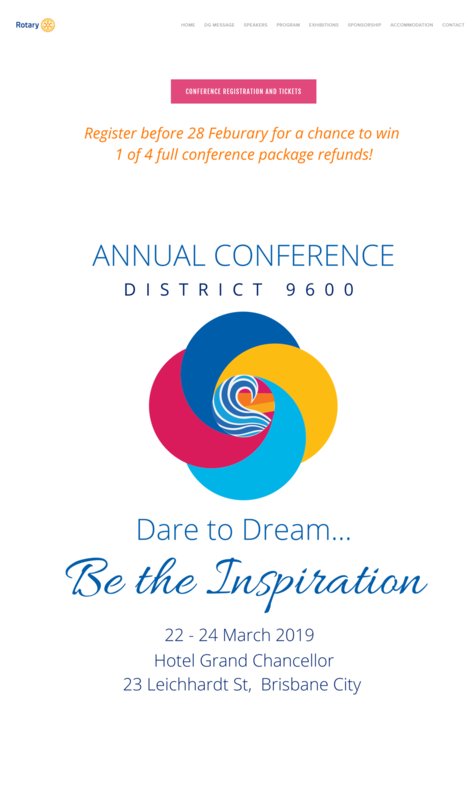 Nominations for District 9620 Governor 2021-22 close on 28 February 2019, just over two weeks time (view the invitation). 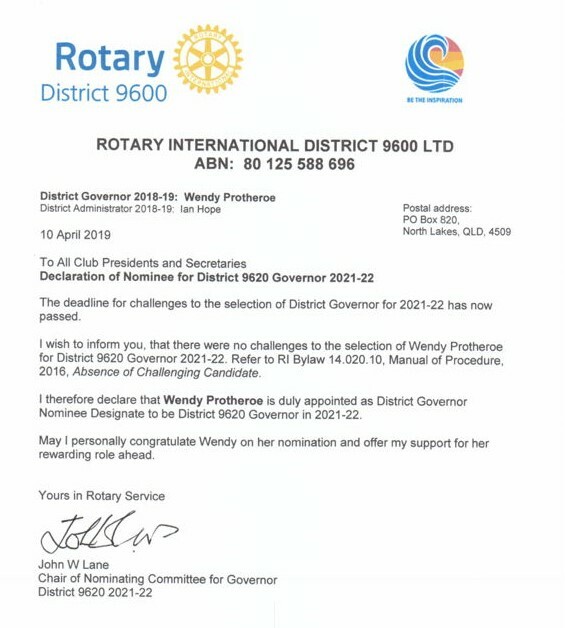 This is a rare opportunity for Rotarians to be the first District Governor of a new District, we might even say the Charter District Governor. The selected person will be involved in the development of the new District, with the full support of the team currently in place. As you may be aware we have had a team working on the procedures etc, required to ensure the smooth transition, and the first District Governor will be an essential part of that team. One of the things, we were working on, was the Rotary International requirement for the District Governor to visit all the clubs, in their District. We are pleased to confirm that at the International Assembly, in San Diego, in January, District Governors Elect were advised that they are no longer required to visit all Clubs. Please consider, we need someone with inspiration to take up the challenge to lead District 9620. Around the world, 25 April is declared as World Malaria Day. Here in Australia, because of Anzac Day, this day has been moved to 30 April. It is a time to reflect on the impact of malaria upon the world and the progress we are making in fighting and controlling it in our countries of focus, namely Papua New Guinea, the Solomon Islands and Timor Leste. A recent development is Rotarians Against Malaria (RAM) has facilitated discussions between Timor Leste and representatives from the malaria program in Indonesian West Timor (NTT Province) on cross border collaborative programs to achieve malaria free status for the whole island of Timor. Each year, Rotary awards up to 100 fully funded fellowships for dedicated leaders from around the world to study at one of our peace centres. 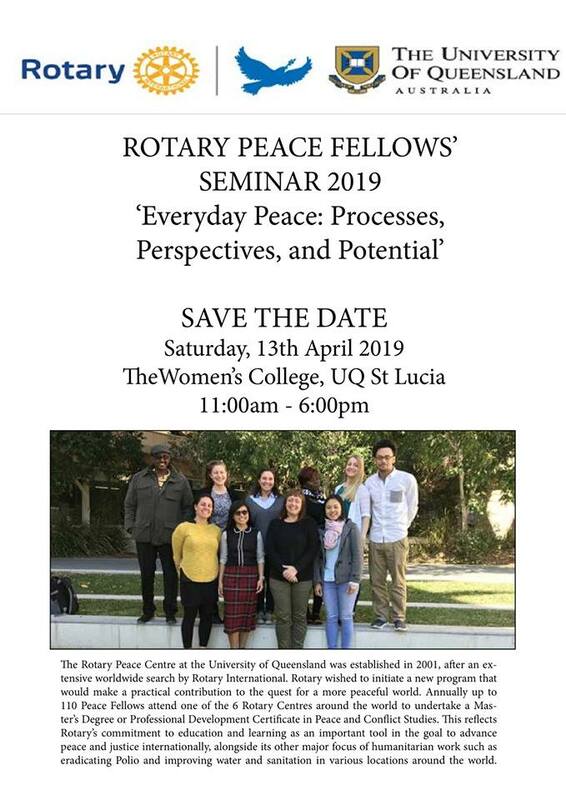 Through academic training, practice, and global networking opportunities, the Rotary Peace Centres program develops the fellows into experienced and effective catalysts for peace. The fellowships cover tuition and fees, room and board, round-trip transportation, and all internship and field-study expenses. In just over a decade, the Rotary Peace Centres have trained more than 1,200 fellows. Many of them now serve as leaders at international organizations or have started their own foundations. 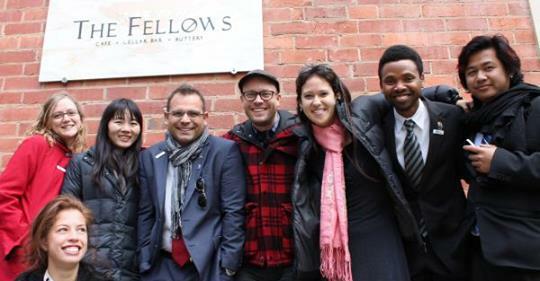 Applications for the 2020-21 Rotary Peace Fellowship program are now being accepted. The due date for candidates to submit applications to their district is 31 May. Cabo Verde consists of 10 volcanic islands and is 570 kilometres west of West Africa. 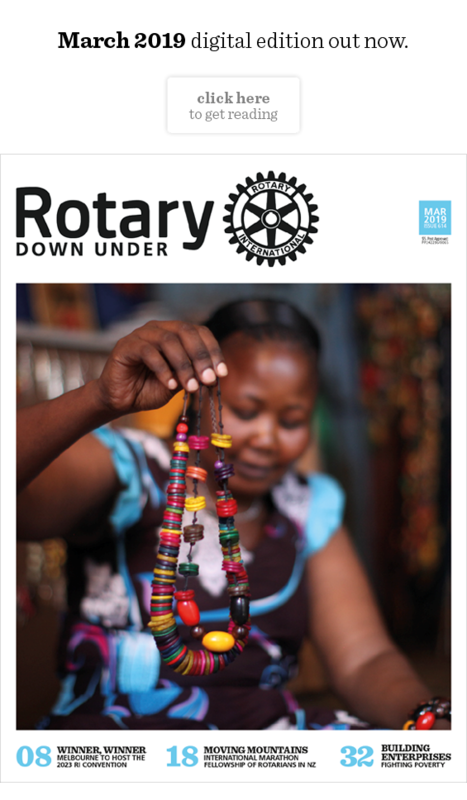 It’s quite significant that in a string of islands 570 kilometres from Africa there is a Rotary Club. Facebook photos indicate about 17 members. As I sit here at my Mother’s hospital bed contemplating on what to say, there are many things I would like to say but I do need to say a heartfelt thankyou to the Doctors, ICU and Staff of the Sunshine Coast University Private Hospital for identifying the seriousness of mum’s condition and taking all the steps to keep her alive. My apologies for not attending the meeting on Tuesday morning and I thank Chris for standing in for me. It was unfortunate that Jessica from the Leukaemia Foundation was unavailable due to illness. I hope that she will be available next Tuesday morning. 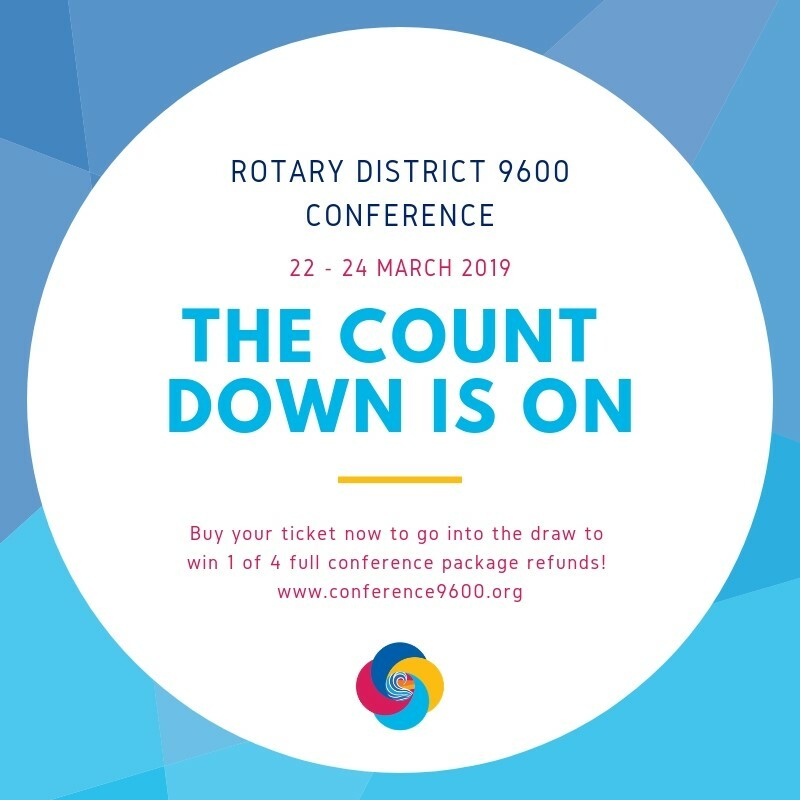 The 2019 District 9600 Rotary Conference is now available for registration. For all Conference information, and to register, head to www.conference9600.org. 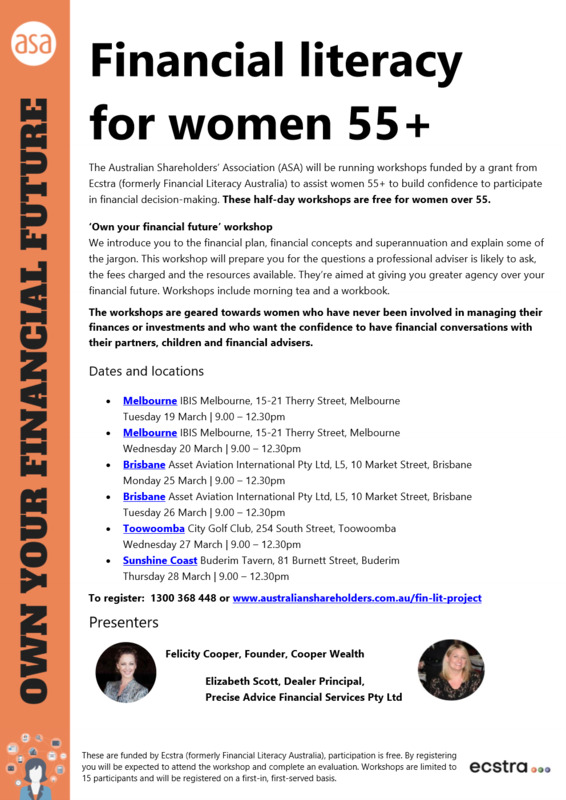 Register before 28 February and go into the draw to win 1 in 4 total conference refunds! Remember, it is FREE to register for the Conference (required); meals are extra! Disastrous flooding in North Queensland has left many families and individuals in need of assistance in their recovery. The appeal is designed to assist those families and individuals whose needs are not covered by insurance and Government assistance. 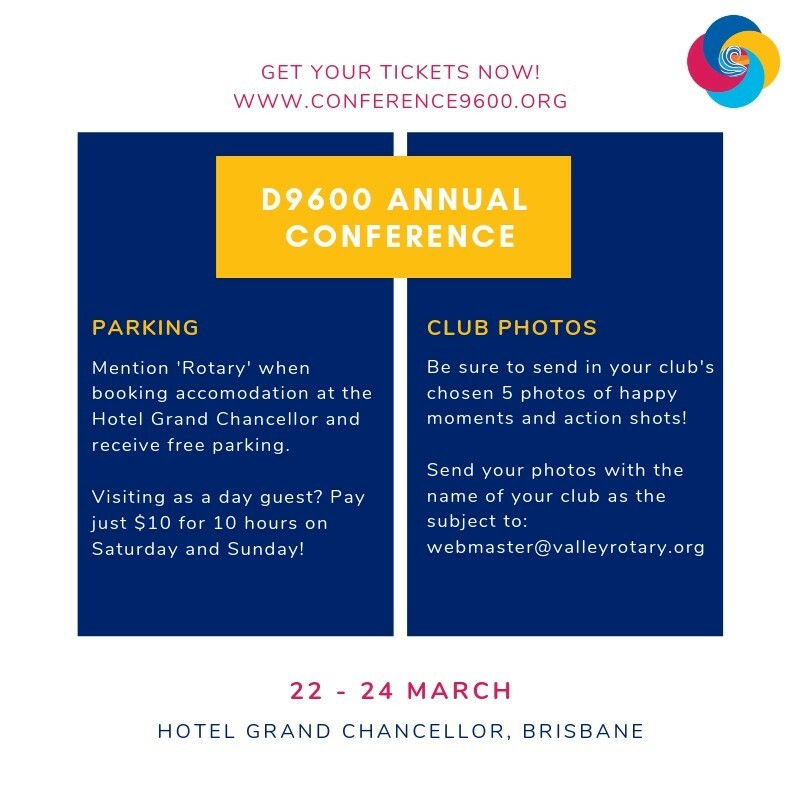 The D9550 North Queensland Flood Relief Appeal (RABS) is sponsored by the Rotary Club of Townsville South West (in Rotary District 9550) under the Rotary Australia Benevolent Society (Managed by Rotary Australia World Community Service). RABS has Deductible Gift Recipient (DGR) registration and has been listed as a Charitable Fund so it can accept tax deductible donations from individuals or organisations. 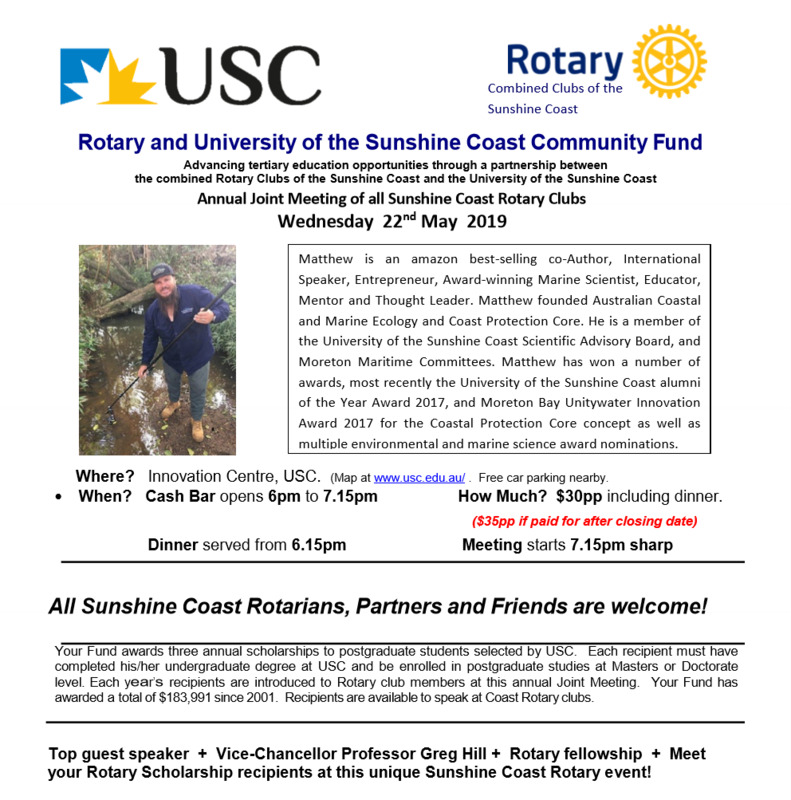 The next meeting of the Rotary and the University of the Sunshine Coast Community Fund will be on 15 February. This fund supports 3 - 4 USC graduates in their studies every year, and has been in operation since the start of USC, with many notable success stories. In June, the RI Board of Directors and The Rotary Foundation Trustees approved Rotary’s new strategic plan, which will take effect on 1 July. Although the plan will guide our activities at the corporate level, clubs and districts are encouraged to develop their own strategic plans and align them with Rotary’s framework. District governors-elect learned about the new plan at the International Assembly in January. The Regional Leaders Training Institute, governors-elect training seminar, and 2019 Rotary International Convention also will highlight the plan. 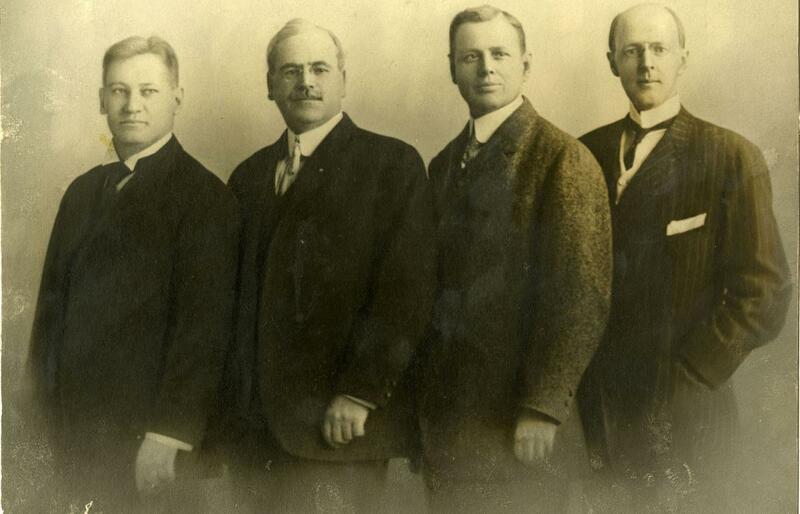 Meet the first four Rotarians here and get ready for Rotary’s anniversary in February. Shephards Arms Children's Home (SACH) & Agricultural Fish Farm, Bohol, Philippines. Rotary Club of Caloundra members Mark, Irish and Darryl told us all about their recent visit to the orphanage and fish farm. Mark commented: "what did impress me were the efforts to be self-sufficient through SACH's agricultural activities and I think that is highly worth supporting". 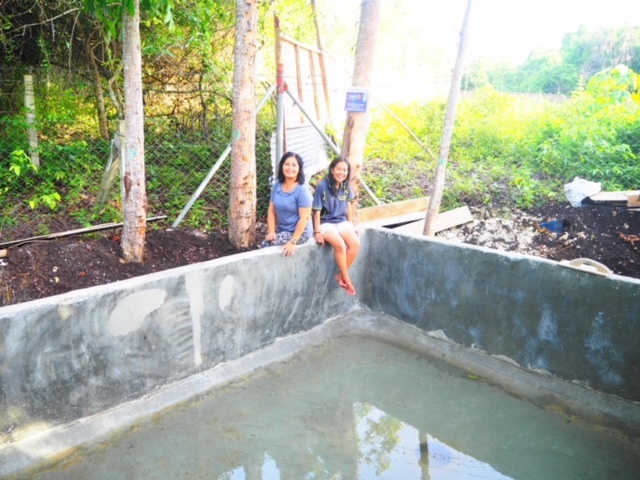 Reflecting the desire to be self-sufficient, SACH plans to grow fish from fingerlings in a purpose built fish farm to assist the children’s home become self-sufficient in providing a supply of food. A revenue stream from selling surplus fish is anticipated. Members are encouraged to check out the club's Facebook page, it is in Spanish but you can get some idea as to how other clubs operate. Not dissimilar to ours. The Club has sponsored an Interact Club which has a photo showing around 50 members. Another photo on their Facebook page indicated they have about 19 members. They have been involved in a project with Lions. Today is a good time to resolve to do everything in your power to promote Rotary’s public image - in a positive way - in the coming months. 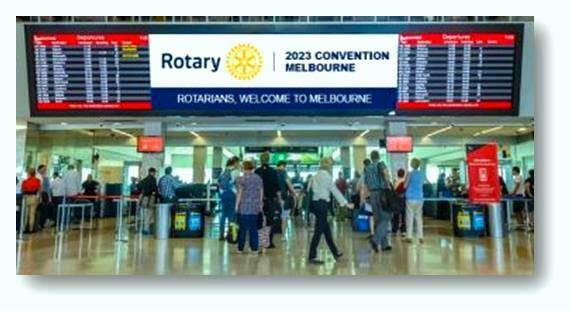 It is with great excitement that Rotary Club of Melbourne announces Melbourne as the host city for the 2023 Rotary International Convention, attracting over 20,000 delegates and the largest Conference secured this century for Victoria. Thirty years since Melbourne hosted the same international event. 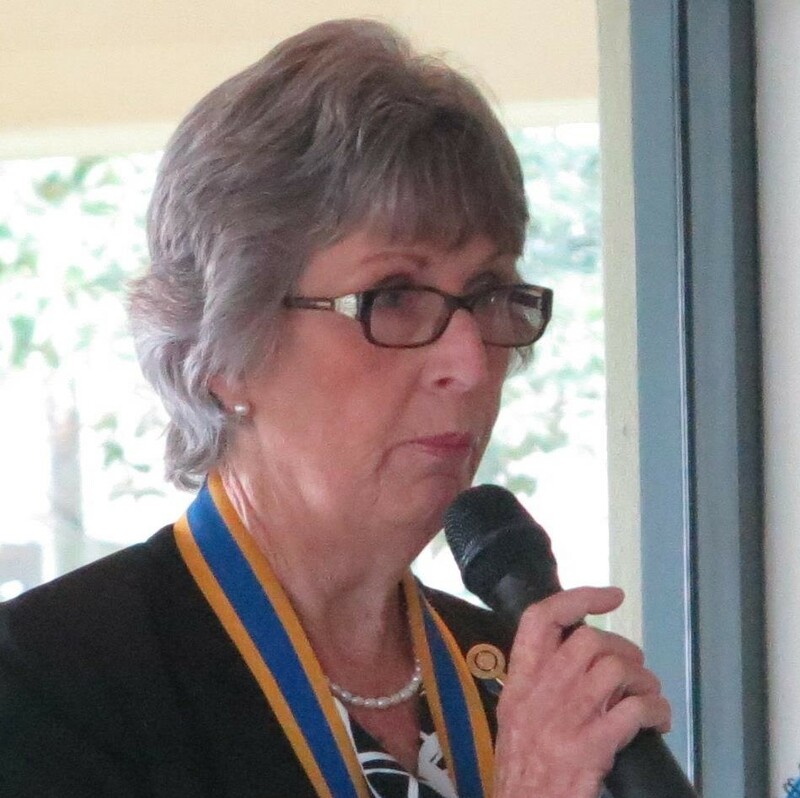 Gateway Care is a very worthwhile local community based organisation that the Rotary Club of Caloundra supports. Gateway Care has perhaps the largest “Food Centre” of it’s kind in South East Qld with more than 5,000 members on its database. Gateway provides an essential support to many low income families who enjoy the benefit of buying low cost groceries from the Food Centre. 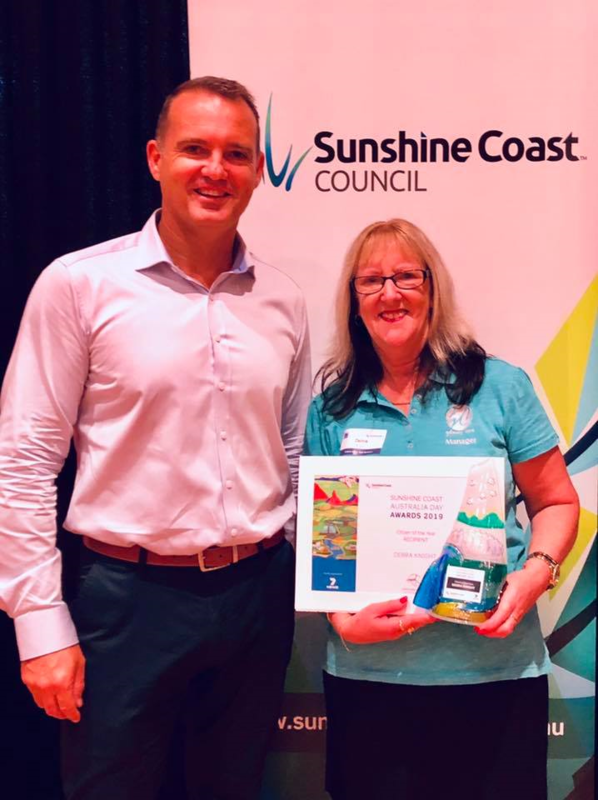 Alexandra Headland's very own David Woodrow's work in the community over many years and in various fields of National Service, Education, Emergency Services and Helicopter rescue has been acknowledged by Sunshine Coast Council. We all know of the tireless work David has been doing in recent years for the Helicopter rescue service, under various sponsorships going back over 20 years and raising several hundred thousand dollars for this essential service. Interesting to note that the helicopter service itself was started by Rotary at the Maroochydore club. Now it’s time to get out the diaries and come together to join as District 9600 at the District Conference on the week-end of 22 - 24 March at The Grand Chancellor in Brisbane. The program looks good, there’s a lot of content to be inspired about - stories from others, projects that have changed the lives of communities and what we ourselves have been doing. Rotarians refuse to accept conflict as a way of life. Rotary projects provide training that fosters understanding and provides communities with the skills to resolve conflicts. Through academic training, study, and practice the Rotary Peace Centres program develops leaders who become catalysts for peace and conflict prevention and resolution in their communities and around the globe. Graduates of the program are reintegrating refugees in Sudan, creating jobs for disadvantaged women in India, and supporting reconstruction in devastated regions of the world. 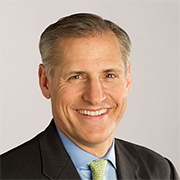 “The first emphasis is to grow Rotary — to grow our service, to grow the impact of our projects, but most importantly, to grow our membership so that we can achieve more,” Maloney said. Has 20 Paul Harris fellows. Under member’s contribution is listed every member and the amount they have contributed which seems to include Paul Harris Fellowship. Activities include : Tree plantation at a school, Submersible pump and tank somewhere, Vitamin A capsule distribution, Sewing machine distribution, wheel chair and bread and sugar parcels. Shelters for Disaster Zones - Providing low-cost shelter systems for emergency response including multi-purpose, fold-up and flat pack systems. 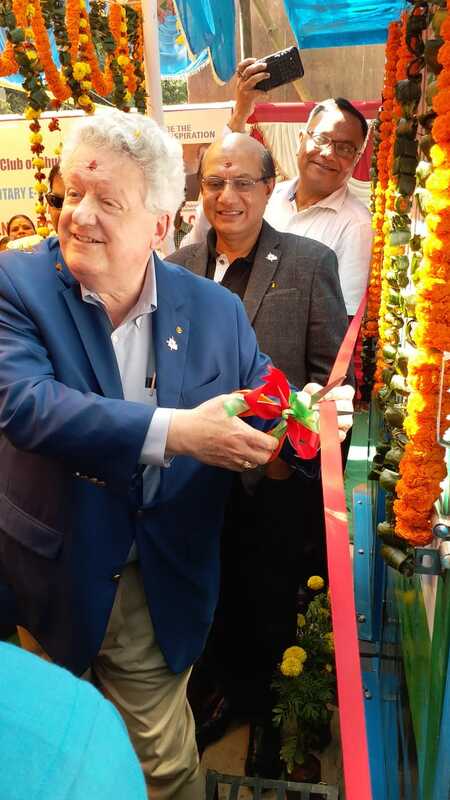 The first part of the project will be inaugurated during the visit of Rotary International President Elect Mark Maloney on 19 February to Rotary International District 3262. It is anticipated that this project will be completed within the 2018-19 Rotary year. The project team is working on how to proceed with the other slums that have now been excluded. There has also been a change in the training organisation. For more details of the latest changes, logon to the website, then click here. 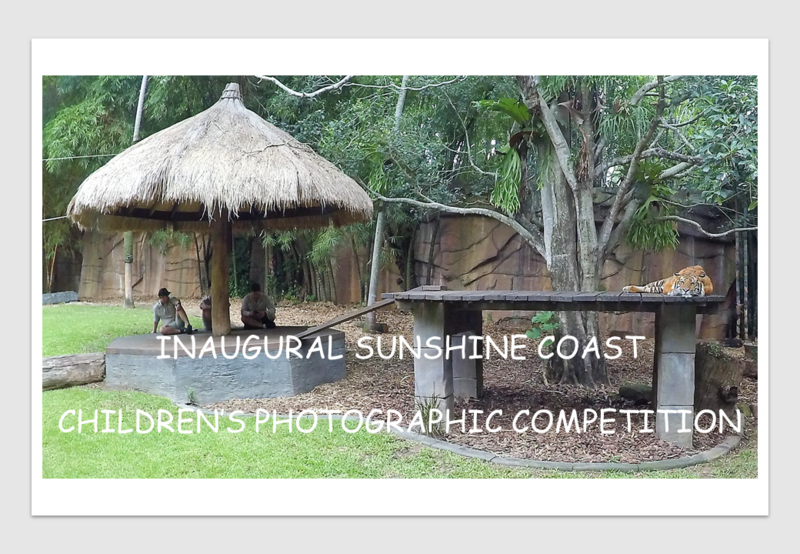 The Sunshine Coast Photographic Competition is open to primary and secondary school children living on the Sunshine Coast. 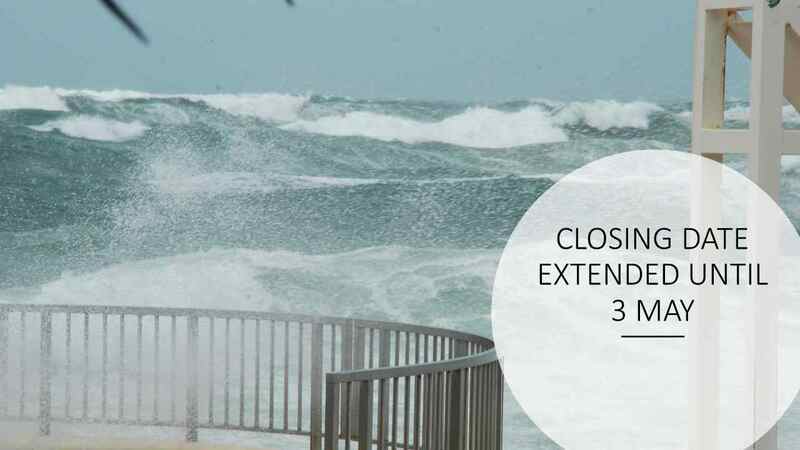 The closing date is now 3 May 2019 (midnight AEST). Register before 28th February and go into the draw to win 1 in 4 total conference refunds! In my travels over the past year, I've visited many strong, vibrant clubs and districts that are transforming their communities. When I attend their meetings, I can feel the energy. When I meet their members, I can see they are people of action. And when I look at their communities, I can recognize the impact of their work. I've also visited communities with Rotary clubs that were hardly more than social clubs. It shouldn't ever be that way. Fortunately, there's a simple approach that I believe can help revitalize any club. If your club is transformational and well-organized, everything else will follow. Members will be engaged, and new members will be eager to join you. Fundraising will be easier: People love to give when they see how their money is making a difference and when they know the organization is accountable. Your club will be vibrant, relevant, and alive — and it will Be the Inspiration to those within its ranks as well as to the community it serves. From their website - Bamboo Projects is a registered charity which uses outdoor therapies to help people with mental illness, suicidal ideation and physical disabilities and anyone who is socially, emotionally and relationally isolated. We have been running community activities since 2015, using fishing and hiking activities to build connection, establish relationship, walk life with people who are struggling and offer realistic strategies and ideas to manage their mental health and interpersonal relationships more successfully. 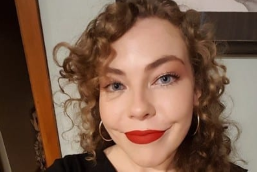 "It is my aspiration to fully invest myself into rural and remote communities in the future and especially to help the state of the farming communities health and wellbeing through nursing, specialised care and rehabilitation. I want to be a district nurse in my own rural community – to return and help the community that gave me the opportunity to be a registered nurse." Day by day, year by year, Rotary members around the world are making a difference, transforming their communities, their nations, their world — and themselves. 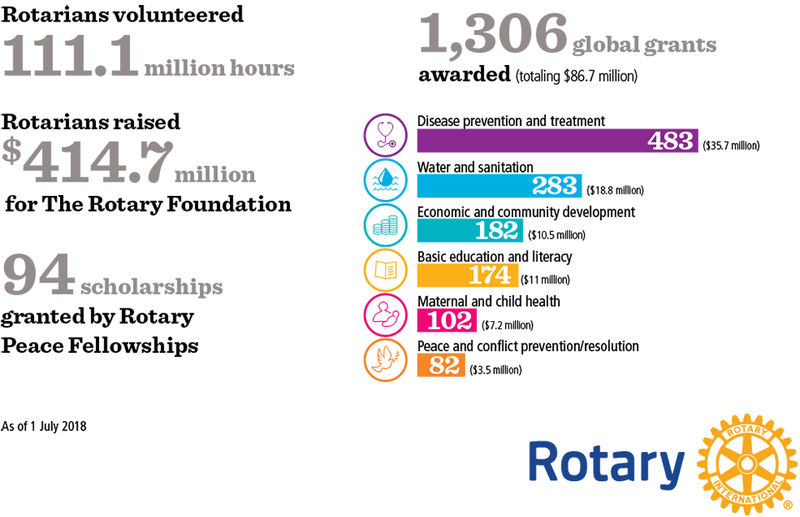 Rotary’s 1.2 million members serve communities around the world, each with unique concerns and needs. Rotarians have continually adapted and improved the way they respond to those needs, taking on a broad range of service projects. 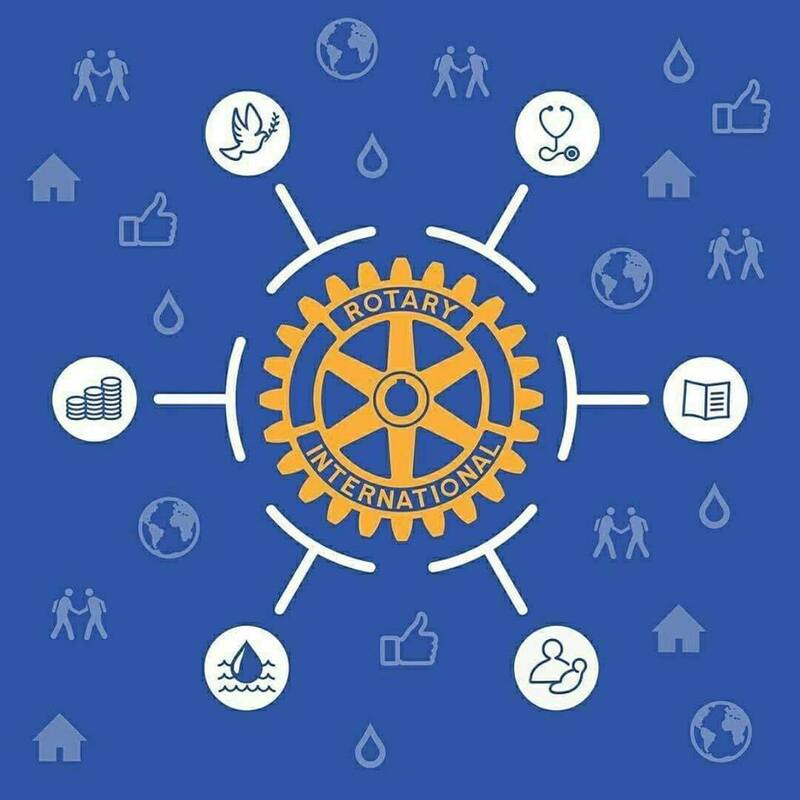 Rotary International and The Rotary Foundation recognise that focusing service in these areas of focus can provide direction to Rotarians interested in developing service projects, improve Rotarians’ capacity to address needs and show the world that Rotary is a global leader in humanitarian service. The needs spanning Rotary’s six areas of focus are vast, but with your help we can accomplish it. Currimundi Family Doctors won the Early Bird prize of $500 in value of products from Dan Murphy's. Our first meeting for the year was a casual Vocational Visit to the Caloundra Lighthouses organised by Daryl. The meeting was chaired by member Roger Todd who also happens to be honorary architect for the Friends of the Caloundra Lighthouses. Roger's involvement with the lighthouses goes back to the 1990s when the modern Signal Station had been decommissioned and the old 1896 lighthouse was at Golden Beach after being moved there in 1970 after the new lighthouse, signal station and radar installation had been first built. Roger thanked the Friends and members who attended and helped with guided tours, John and Donnalea, John Bradley, Julia, Sandy, John and Janice Groves, and River. It was President Bernie's birthday, and she was given a card signed by the members. If we propose a toast to ONE Club each meeting say 45 meetings per year, that would take us around 777 .7 years. Five clubs per meeting would only take us 155 years. So instead, if the toast is proposed each week to one club from each country, that will only take us four+ years. Having found out that it takes about two hours to locate a club and get details, no wonder Alan Still called it a da;, I may try to work our way through the alphabet by country. But this just goes to show how massive Rotary International is, and we are part of it. So tell your business associates, clients, friends, police officers, nurses just what sort of an organization we are part of. And tell them of the wonderful things we do worldwide on which Mark will be educating us in his Rotary Today segment. So today, toast the organization we are proudly a part of. Read about Rotary's accomplishments during 2017-18 in the annual report. The report includes highlights from the year, service projects that are having a positive, long-term impact, and stories from donors on why they contribute to The Rotary Foundation. A very Happy New Year to you my fellow Rotarians and to your families. I hope that you are all blessed with good health and hope that with your help we as a Club can achieve some good things within our Community and worldwide in 2019. 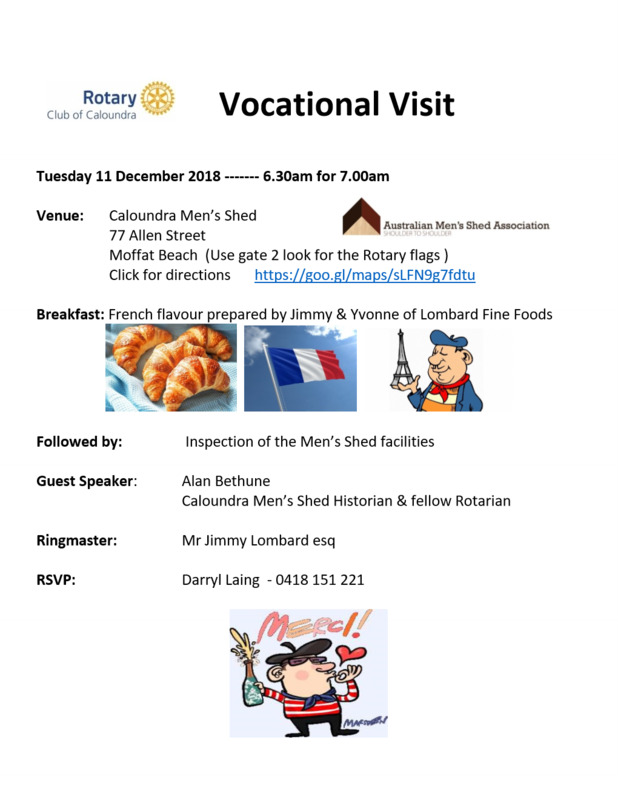 Just a couple of reminders for you all, beginning with our first meeting on 8 January: it will be at the Caloundra Lighthouses as our first Vocational visit for the year. What a wonderful start. It has been awhile since our last visit and Roger will be able to update us on what is happening for 2019 for the Lighthouses. Looking forward to seeing you all there. 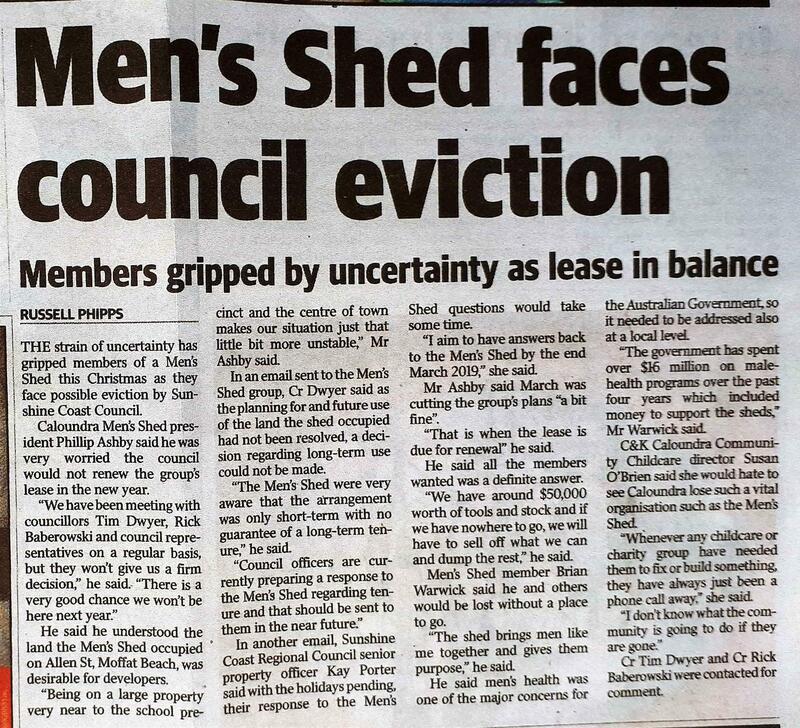 On Monday 14 January our first Board meeting for the year will be held at McGrath Real Estate at 3.30pm. Then it will be back to Oaks for our regular meetings on 15 January. Judy we hope that your Mum is recovering well and we wish her all the best. I am looking forward to seeing you all again and catching up on what has been happening over the past weeks. Vocational service can be hard to define, but it is easy to describe: It is simply the point where our Rotary lives and our professional lives intersect. When we put our Rotary ideals to work through our work, that is vocational service. When I returned to the Bahamas after many years working in health care administration abroad, I realized that my country badly needed a modern health care facility. The resources we had at the time were out of date and inadequate, and people who were unable to travel abroad for care often did not receive the care they needed. Without the experience I had gained in the United States, I could have done nothing to change the status quo. But since I did have that experience, I was in a unique position to have an impact. I knew I could turn my professional path to good and make a career out of improving Bahamian health care. A very Happy New Year to our readers! May 2019 bring to us all peace and well being. 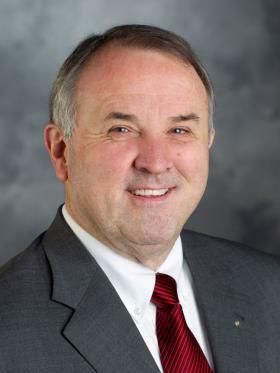 The introductory statement and three of the four tenets of the Object of Rotary relate to Vocational Service, underlining its importance to the philosophy and culture of Rotary. To encourage and foster high ethical standards in business and professions, to recognise the worthiness of all useful occupations, to dignify the Rotarian's occupation as an opportunity to serve society. To apply the ideal of service in personal, business and community life. To advance international understanding and goodwill, and peace through a world fellowship of businessmen and professional men and women united in the ideal of service. we’d like to happen in the year ahead. 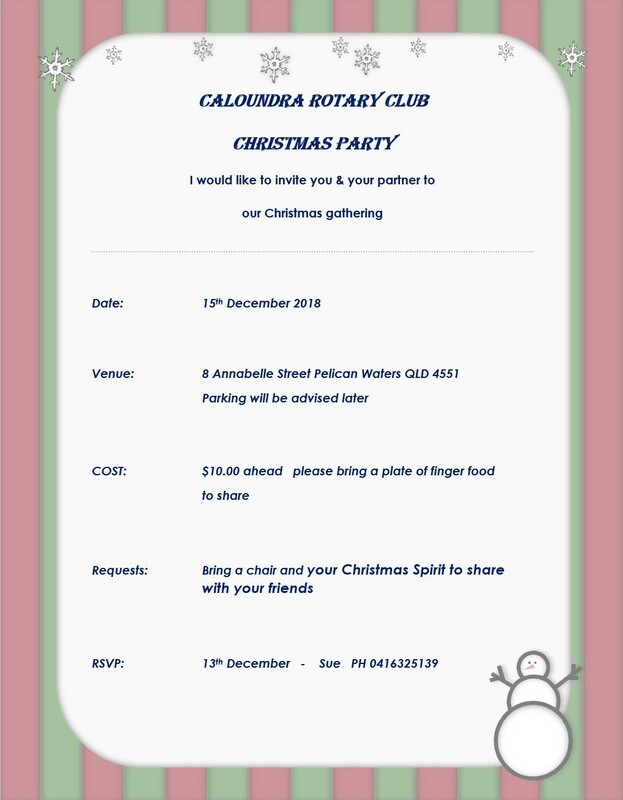 On behalf of Ron and myself and my family, I would like to wish you the members of the Rotary Club of Caloundra and your families a very safe, peaceful and happy Christmas. Thank you to each and every one of you for your support during these first six months of my Presidency. If not for you, I may not have kept going. This Club makes us all part of a family, an extended family. The Rotary family. James’ Christmas talk on Tuesday morning was about Hope and it made me look at Hope in a different light. It can mean so many things. I HOPE that each and every one of you will have Hope in your lives for the coming year 2019, whatever it means to you. It was so good to see so many of you attend our last Breakfast for the year and have a laugh at our secret Santa antics. It was all in good fun. We will return on 8 January to a Vocational Visit at the old Caloundra Lighthouses. 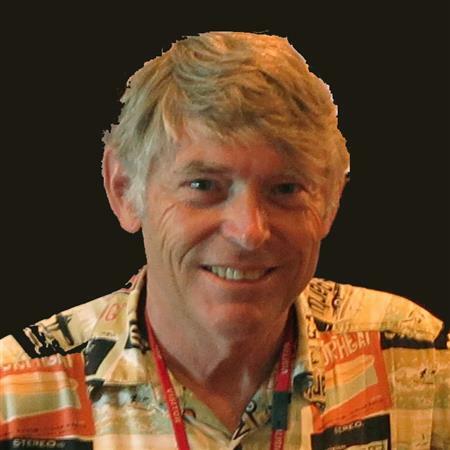 We were saddened at the loss of Lynne Roberts in November, to his family and also to many of our members, but his legacy will live on through the STEMM program. Thank you to our Rotary Youth Exchange student Chloé Méar for bringing youth back into our club and we hope that we will have the pleasure of your company frequently during your time in Australia. I am looking forward to 2019 and going ahead with the proposed projects that are in the pipeline and of course your support in achieving these. Happy Christmas and have a wonderful New Year. 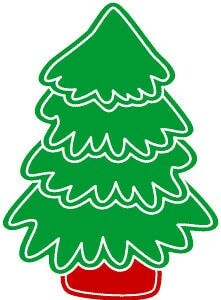 A very Happy Christmas to all our members & friends! Chris chaired the meeting, and Mark did three minutes on The Rotary Foundation, and the gift of giving. Bernie delivered the President's report, and James gave the Christmas address : "We can all be messengers of hope"
This was followed by "the great Christmas present steal" where lucky ticket holders could take their turn picking presents. 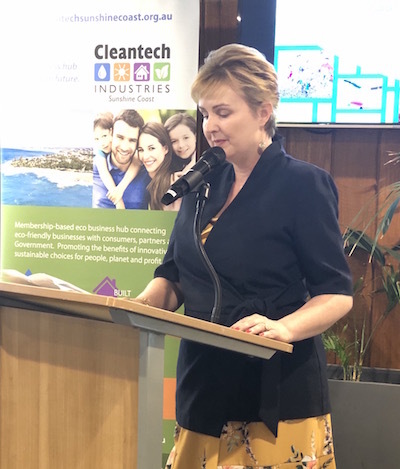 Megyn counts it as a huge honour to be voted in as the Cleantech Industries Sunshine Coast President and Secretary for 2019. I wondered a couple of years ago how I can make a difference to the environment and this is what's happened (so far). The election of Officers for next year, under President 2019-20 Chris Rees, was conducted at the club's AGM on 4 December. The members elected are set out below; there are some vacancies, so if you are interested, please contact Chris. Last Thursday evening I attended the Currimundi Special School Concert. What a delightful night. The enthusiasm that the children put into their acts was amazing and the efforts and support of the teachers and families made the night truly special. I felt so honored to have been invited to this wonderful occasion and happy that I was able to accept. These coming weeks we as a club have been invited to attend end of year celebrations for the Schools that the Club has given bursaries to. Julianna Neal and I attended the Pacific Lutheran College end of year celebration on Tuesday evening. The evening was marked with reverence and celebration. Our Exchange Student Chloe Mear was presented with a Certificate. I will be attending Currimundi Special School on Friday afternoon to attend their end of year Assembly. Thank you to those members who have attended and presented bursaries to our schools. There are a couple of empty spaces and Judy has asked if anyone is free to help out by presenting a Bursary could they please let her know as soon as possible. Tuesday the 11th December is our Vocational visit to the Men’s Shed – I do hope you all have a great visit. 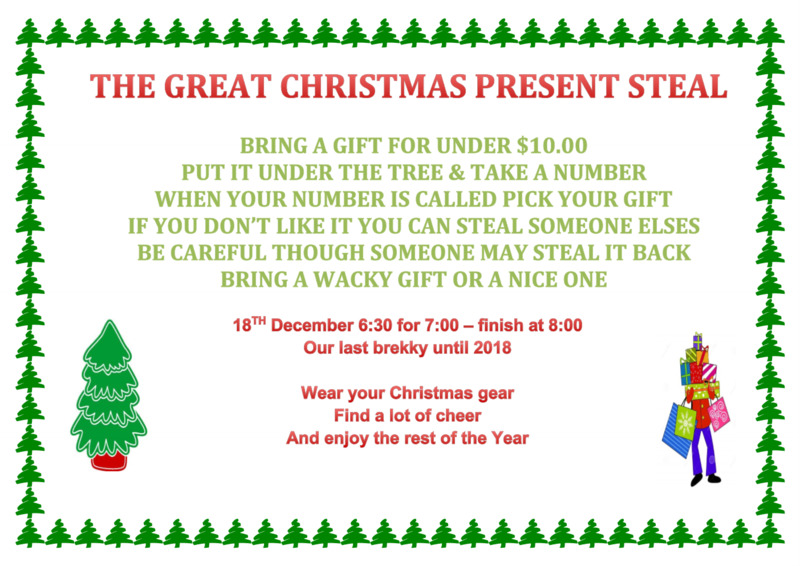 Thursday the 13th December is a Sausage Sizzle at Star Discount Chemist Golden Beach – please let Judy know if you can give her a helping hand – time is from 9am to 3pm. It will help us to get our name out there and let the Community know what we have done and what we can do. 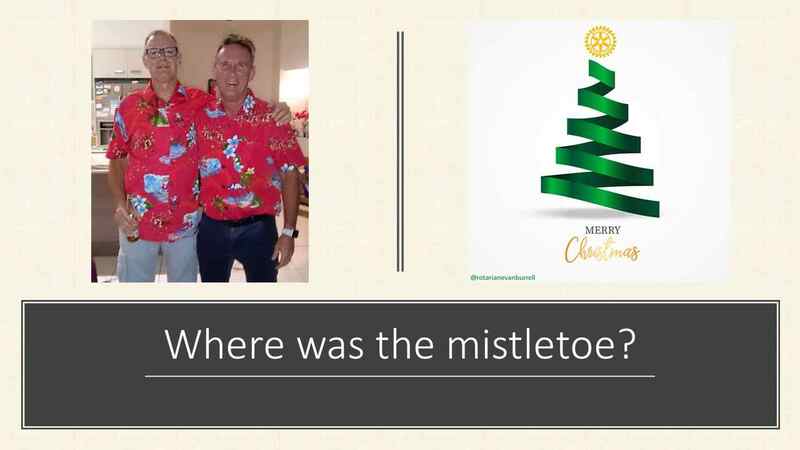 Saturday the 15th December – Club Christmas Get together at Sue’s home – don’t forget to RSVP. We all joined Rotary for a reason be it that we are all Community minded and we do Projects to make the Community a better place. We have made longlife friends and have a wonderful fellowship – Lets have the best Rotary Club in the District and work towards a better world. Whenever we seek support to use Rotary funds for the purpose of service we have to undertake all of the governance steps required. We have to be transparent in the way that we identify needs, support local communities, manage the funds and ensure that they are used to deliver what we have asked for. Our stewardship helps maintain the reputation of the integrity of Rotary. Well Gerry has finally retired from Bunnings BBQ duties! His last hurrah was on a blisteringly hot Wednesday - heat which kept sales down and volunteer spirits high. Gerry's role has been so huge that three members are taking over from him - Judy, James & Merv! Our next regular BBQ at Bunnings is on 23 January; a special weekend BBQ for all those still working will be held on Saturday 9 February, followed by the regular slot on Wednesday 27 February. A special BBQ will be provided for Star Pharmacy on Thursday 13 December - see Bernie or Judy for details. Thank you Gerry, well done! Our health is everything. Yet 400 million people in the world can’t afford or don’t have access to basic health care. Rotary believes good health care is everyone’s right. 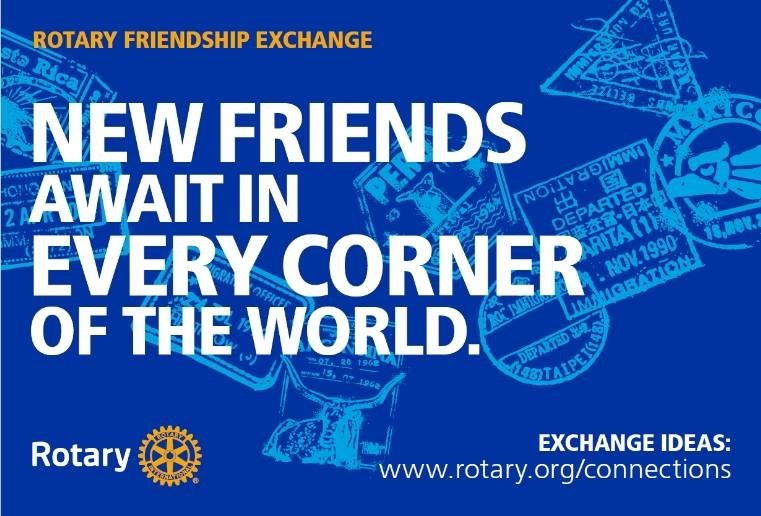 Meet new friends and exchange ideas with fellow members at the 2019 Rotary Convention. Whether you are Rotary or Apple, your brand is critical. It incorporates who you are, what you believe in, and what value you provide for your stakeholders. If you get it right, you will distinguish yourselves from your competitors, provide a great work-place for your people, and leave you well placed for the future – whatever that brings. Sasha Blackwood will be going on to study Veterinary Science. 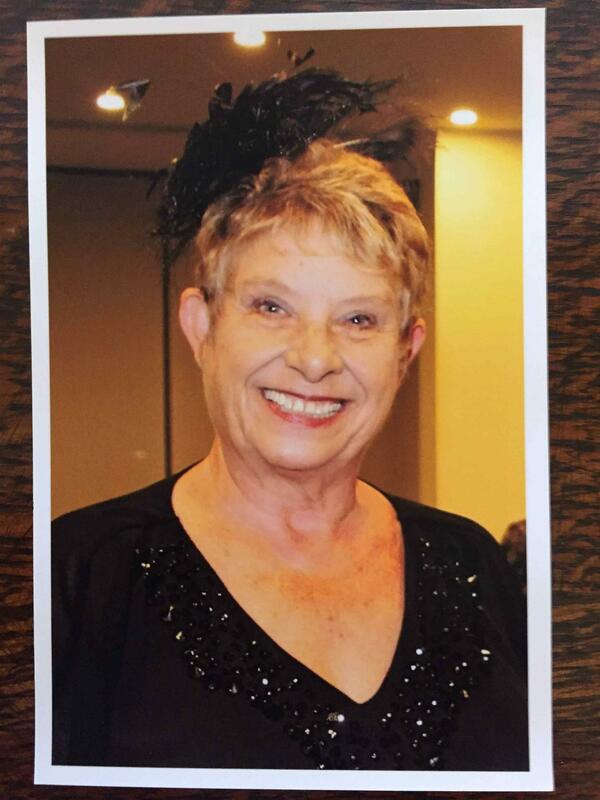 On Tuesday 20 November, the family, friends, the Rotary Club of Caloundra and the Community farewelled one of our longstanding members Lyn Roberts PHF. For 25years he has done his bit for the Caloundra Community. He was a wonderful family man, great friend and mentor to many. We will miss his dry humour and matter of fact demeanour. During his time with Caloundra he was very involved with the Golf days and he made sure there was no cheating, he was a stickler for reporting the score sheets in a proper manner. 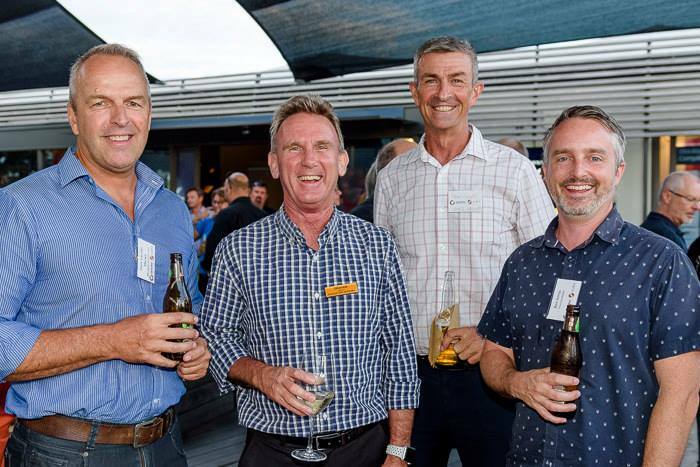 His Celebration of Life at Gregson & Weight Caloundra was a fitting send-off to his life. Farewell Lynne we will miss you. Lexley, Michael, Suellen, Jacqui and your families, please accept our deepest condolences. Our meeting on 20 November began with a minute's silence to honour our late member, Lyn Roberts. Ian Belcher chaired proceedings and welcomed guest speaker Tony, Graeme Bowden & Ian Holden. Ian is a semi retired bookkeeper with computer/internet skills. He and his wife recently settled in Pelican Waters. Ian currently works two days a week on-line for a Veterinary Clinic in Albury/Wodonga where he has been employed for 10 years. We were then treated to a very quick but outstanding presentation by Ana featuring her life, family, vocation and interests. 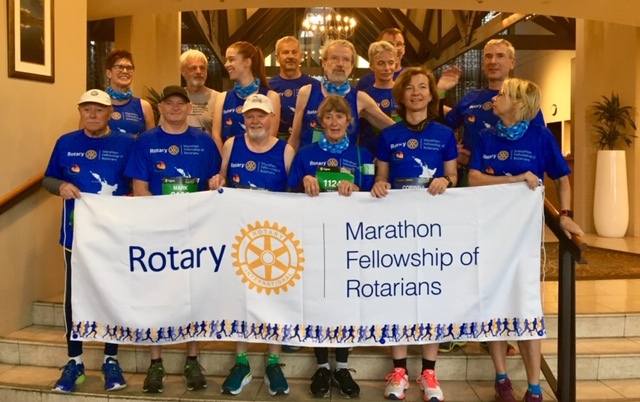 Mark (with his fellow members of IMFR - International Marathon Fellowship of Rotarians) participated in the Queenstown marathon yesterday. He said there was beautiful weather and an unbelievable scenic course around the lake. Afterwards, the IMFR AGM and awards dinner had lots of local Rotary participation - even the DG from Dunedin welcomed them. Next year's run is in Iceland as the incoming president is from Scandinavia. It is with great regret and deep sadness that we record the loss on Thursday morning of our dearest friend and fellow member, Lynne (Lyn) Roberts. Our deepest sympathy is extended to Lex and her wonderful family. Lyn's Life Celebration was held on Tuesday 20 November with many members present. 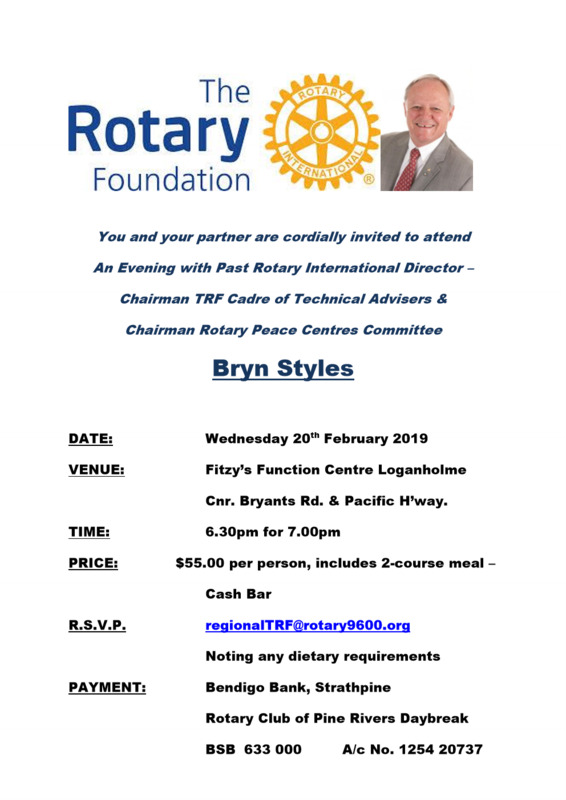 Lyn became a Rotarian on 1 March 1988 when he joined the Rotary Club of Bribie Island. He served that club as President 18 March 1988 to 30 June 1989, and as Secretary for 1990-91. 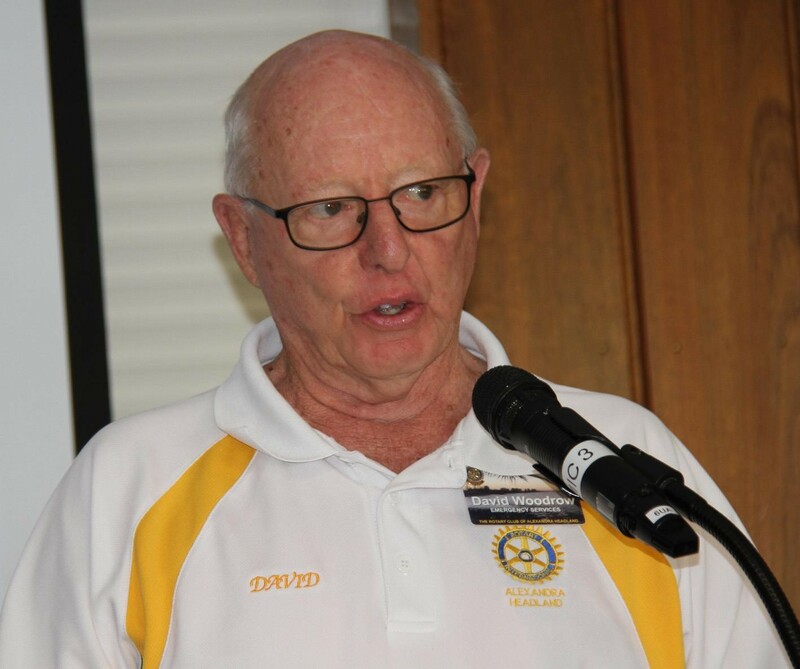 He joined the Rotary Club of Caloundra on 1 November 1993 and was Community Services Director in 1995-96. The major fundraising that year was the Charity Golf Day. About $6,000 was donated to the Palliative Care unit of the Caloundra Hospital. Lyn inherited the task of receiving the golf cards of players on the golf day. After analysis he would announce the various winners. Because he did this job so well, he retained that role for many years. Lyn was a member of the club's first team to work in the Solomon Islands in 2005. He worked on improvements to the outpatients department of the Gizo hospital. He was a multiple Paul Harris Fellow, having been recognised firstly in 1993 and later with a sapphire pin. Lyn pictured with Lexley, President Bernie, and daughter Jacqui at our meeting on 30 October when Lyn's long membership in Rotary was recognised with a certificate and the bestowing of an annual Scholarship for the STEMM program founded by Jacqui. The Scholarship will be presented to the STEMM student who has achieved well and will help to further her studies. At our AGM on 4 December, an important part of the agenda is the Election of Officers for next year, under President 2019-20 Chris Rees. The officers to be elected are set out below. Please consider which position you would like to volunteer for and contact Chris, Bernie or Sue as soon as possible. Just a reminder to all members to renew their Centurion membership, or become a new member - use the attached form. 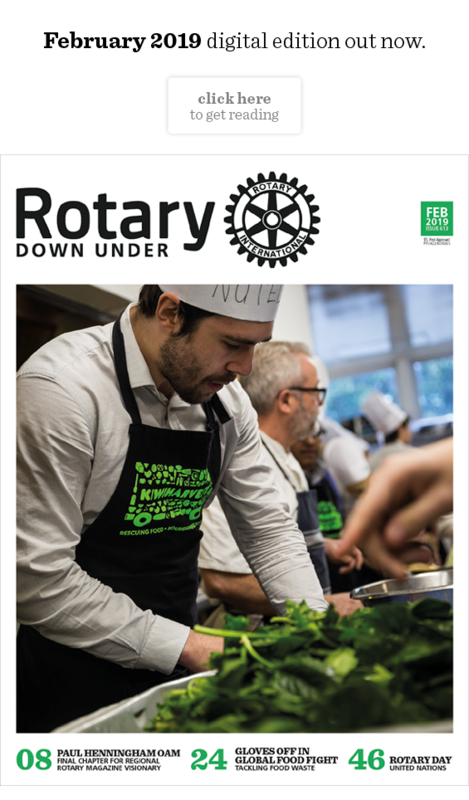 As you may know, the Centurion program is the Australian way for Rotarians to make personal contributions to the Foundation – which is, of course, our charity. 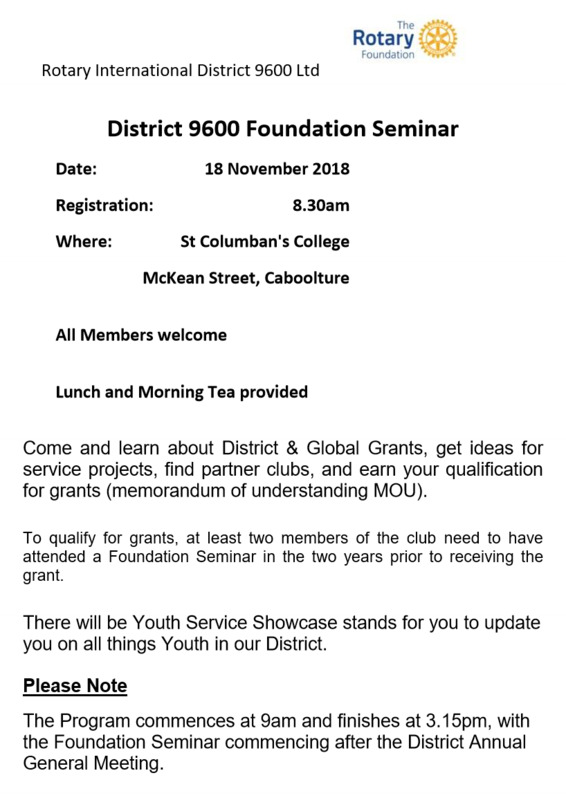 Don’t forget that the $100 Centurion contributions accumulate towards a personal Paul Harris Fellowship and 50% eventually (three years' time) reappears to support club and District activities via District Designated Funds. 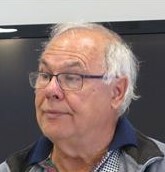 President Bernie presided at our meeting on 13 November. She welcomed our guest speaker and Rotary Youth Exchange Student, Chloé Méar along with Mark and Irish freshly returned from the Philippines. Mark gave thank you letters to all who contributed to the gift parcels that he took to the SACH Orphanage in Bohol as part of our project there. See details of the project here. A full presentation will be made by Mark & Darryl at the earliest opportunity. 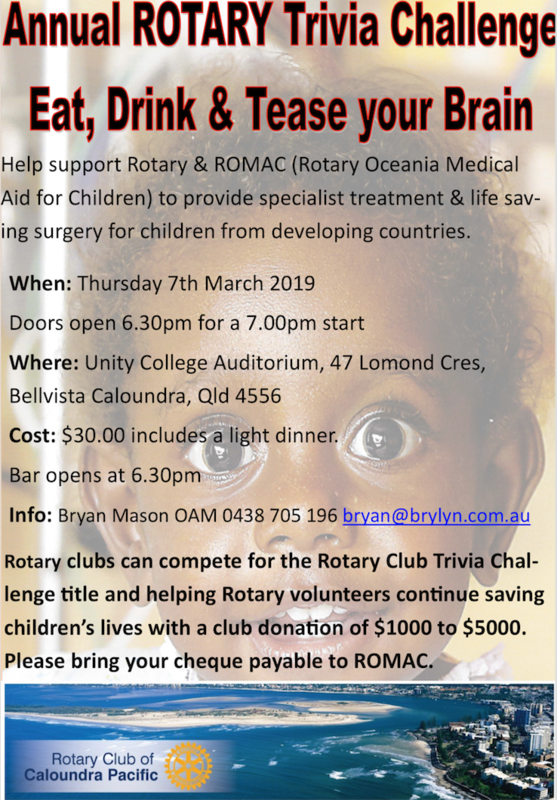 It is that time of the year again and your support for the ROMAC Trivia Challenge that will be held at Unity College (same as last year) on Thursday 7 March. Last year was a great success for ROMAC and a better result this time is planned. A target of 400 attendees has been set for this event. 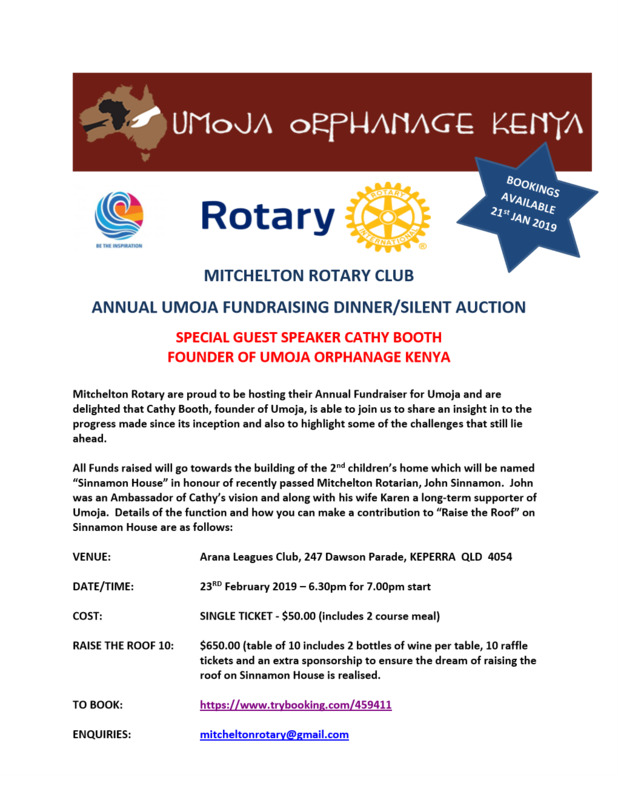 Tables of eight are available and friends outside of Rotary Clubs are welcome. 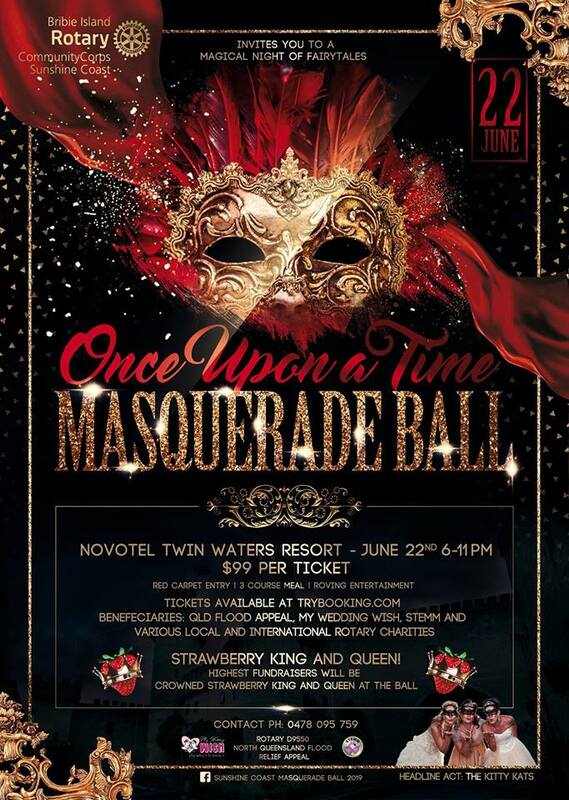 This is a fun event and at the same time is a major fundraiser for ROMAC so that it can carry on with the Life Saving and/or Dignity Restoring Surgery for children mainly in the Oceania Region that cannot access this in their own country. An Entry Form will be available in early December with instructions on completing it. A Team Captain (Deb?) will complete this form. In the meantime, plan to attend and save the date (7 March 2019). My heartfelt thanks to the wonderful band of volunteers Noel and Olive Begley, Alan Bethune, Anne Boland, Ann Rattle, Pam Snyman, Judy Clark, Merv and Anne Paddison, Gerry Swan, Les Walsh, Megyn Carpenter, Ana Carolina and our stand in Charmaine Wheatley who diligently sat outside Golden Beach Newsagent and Westpac in Bulcock Street selling Trifecta tickets for the Melbourne Cup. A wonderful effort, as they sold all that they had by Monday morning. To top it off the winner was Graeme Bowden from the BookShop at Caloundra. 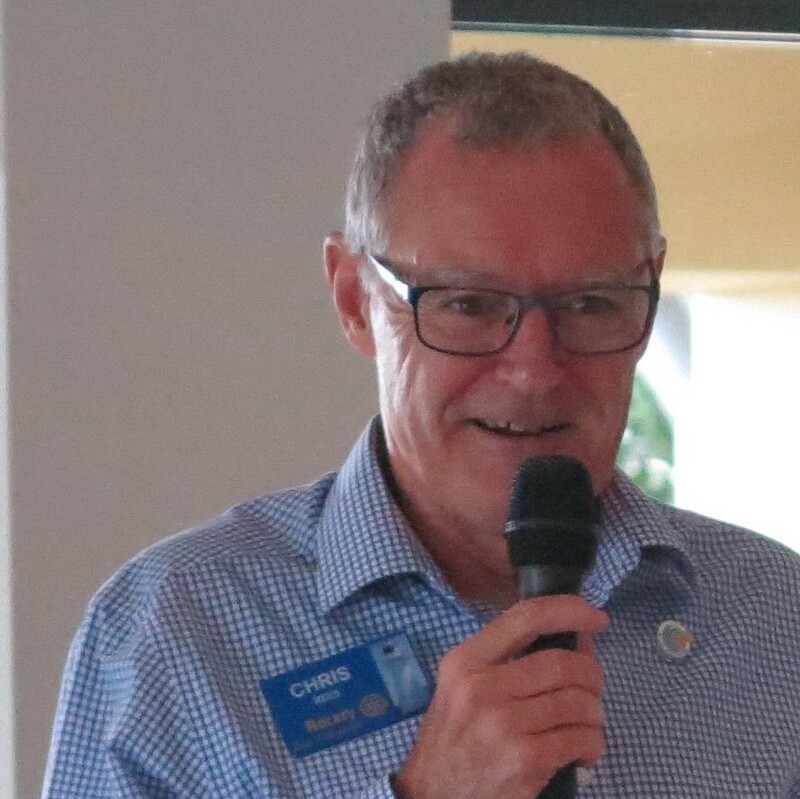 Graeme has always supported us in our fundraising ventures even though he is a member of the Rotary Club of Caloundra Pacific. Congratulations Graeme. I am hoping that Graeme will be able to attend our breakfast on Tuesday morning so that I can present him with his prize. 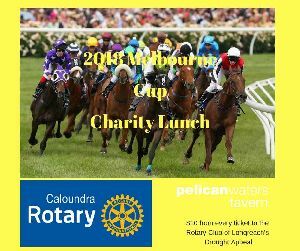 Graeme Bowden of the BookShop at Caloundra and a member of the Rotary Club of Caloundra Pacific is the lucky winner of our Melbourne Cup Trifecta Sweepstake. A great investment return. Many thanks to all our volunteer ticket sellers and members for having fun supporting this worthwhile fundraiser. While in Papua New Guinea recently DGE Darryl and I spent lots of time talking with families, villagers, the polio teams and young polio victims. We first met with UNICEF and WHO on the Saturday afternoon when we arrived and we discussed the need for the teams to wear safety vests as they are travelling throughout the country encouraging all children under 15 years of age to have their vaccinations. Bob Aiken had been the first to alert us to the problem as it was raised by UNICEF. We knew our District could not meet the need but we were in touch with Carol and Amy from Polio Plus in Evanston. And together we all talked and negotiated to find a way to deliver the vests. Amy was amazing and this morning we received the fantastic news that The Foundation Trustee Chair had signed – and the grant was approved. Maleny Singers next production of Mozart’s famous comic opera The Marriage of Figaro is an hilarious and musically glorious romp in which the actual marriage plays second fiddle to several wicked intrigues. 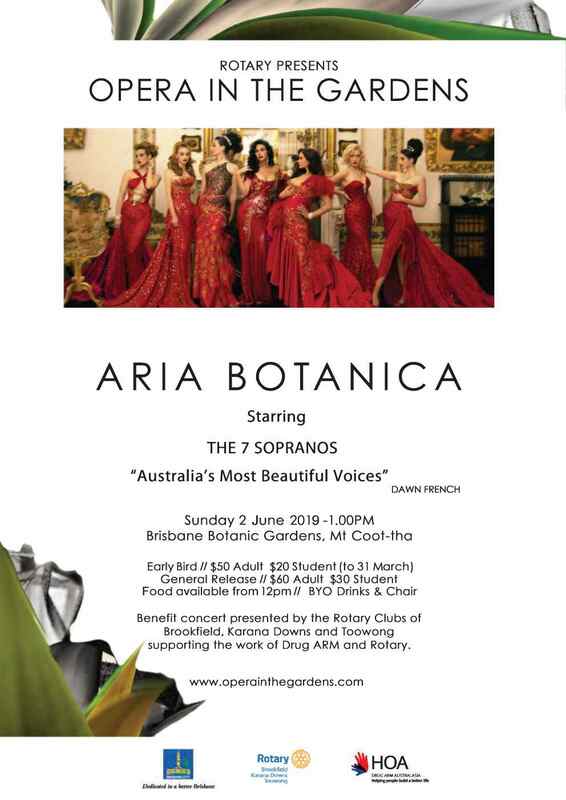 It has a very funny and involved plot encompassing love and liaisons, tricks and disguises, lust and laughter and, along with sublime music, splendid singers and chorus, is certain to be both entertaining and rewarding. All this, plus an orchestra of 24 under the baton of Margaret Taylor a former principal singer of The English National Opera who also directs the opera. This opera is not likely to be attempted again in the hinterland for many years. 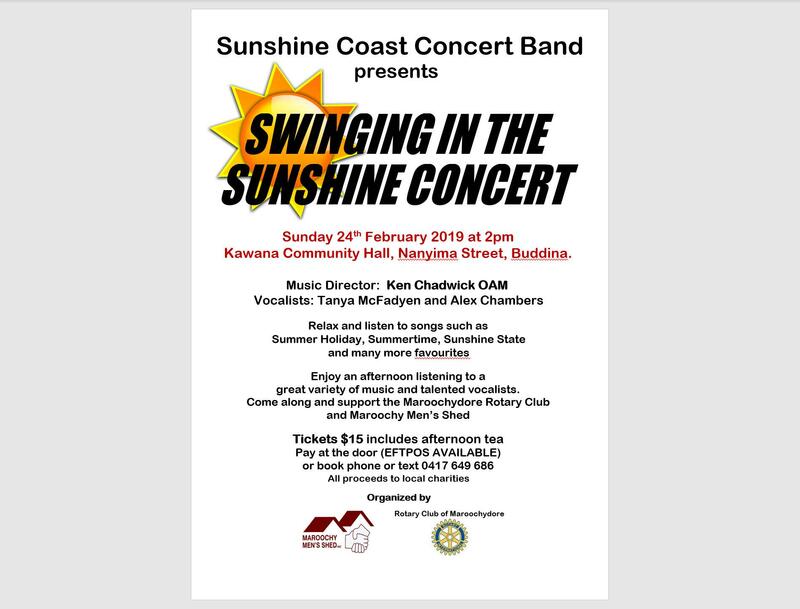 A wonderful chance to have fun and also to support, through Maleny Rotary, two great charities – Blackall Range Care and the Life Flight Foundation. Tickets now available but book early as there are only three performances at The Maleny Community Centre in Maple Street on November 9, 10 and 11 at 7pm, 4pm and 2pm respectively – Just 5 days before the only evening performance! 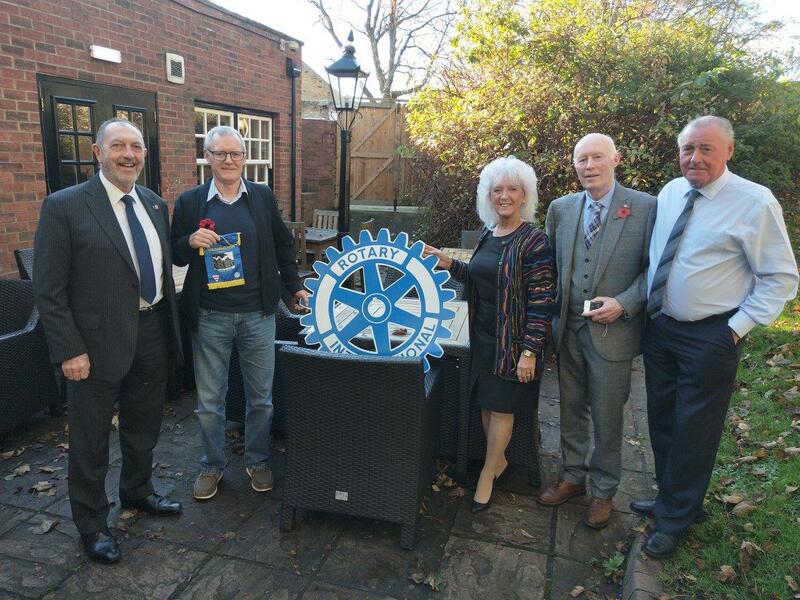 Lunchtime meeting with the Rotary Club of Washington, Tyne and Wear. Wonderful North East hospitality and a chance to hear of the good work they are doing in the community. Thank you to Alan who chaired the meeting. President Bernie welcomed visitors: Ross Waugh was visiting from the Rotary Club of North Sydney which is celebrating 90 years this year; Charmaine Wheatley who is a member of the Rotary E-Club of South Africa One who helped organise the Ocean Crusaders Paddle for Polio at Currimundi Lake. 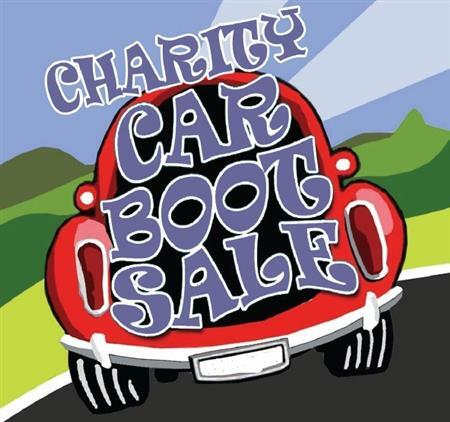 Thanks to Rob, Judy, Anna, Graham and Deb for supporting Charmaine at this event. Bernie said there were about 11 visitors at Opal to see Norm and he was thrilled to see everyone. She encouraged members to join the roster to sell Melbourne Cup raffle tickets and also to come along to the Melbourne Cup lunch next week. There is no breakfast next week due to the lunch. 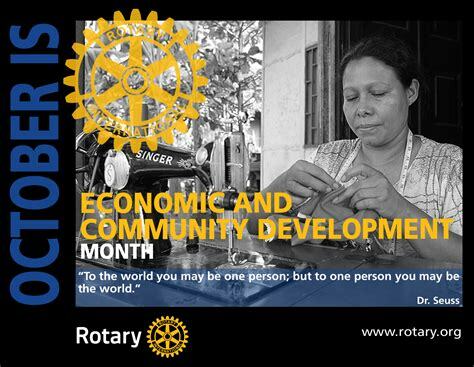 Every year we celebrate November as Rotary Foundation Month. How fortunate we are to have a world-class Foundation that allows us to do so much good in the world. We should all take pride in the fact that something good happens every second of every day because of Rotarians and our Rotary Foundation. One early June, more than 30 years ago, I had a business trip scheduled to Las Vegas. 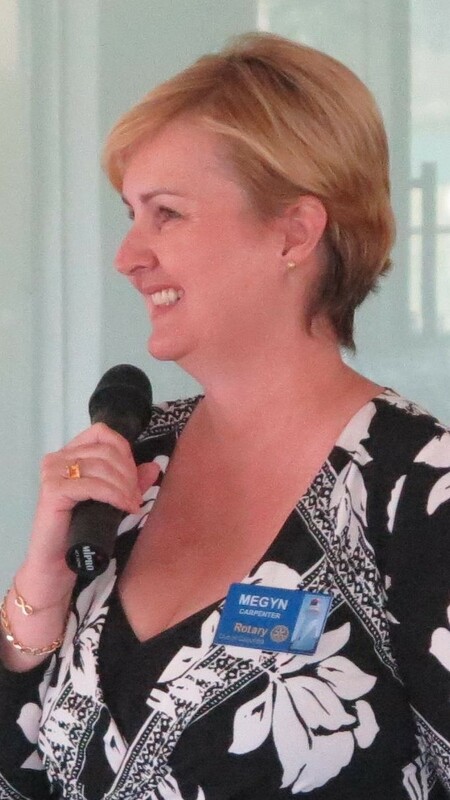 I had been a Rotarian for about six years, and I thought of myself as an active member: I attended every meeting, I’d served as club secretary, I knew everyone in my club. But for me, Rotary was very much a community organization. It connected me to Nassau and perhaps even to the Bahamas — but no farther. We are so close. 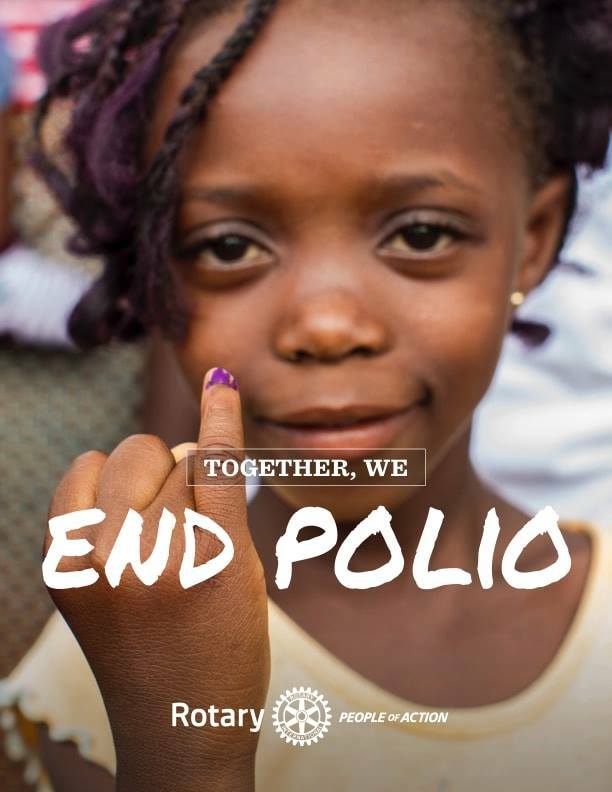 We’ve got a 99.9 percent reduction in polio. But we’re not there, yet,” says John Sever, a vice chair of Rotary’s International PolioPlus Committee, who has been part of the eradication effort since the beginning. “Rotarians and others have to keep working. People will naturally say, ‘Well, it seems to be basically gone, so let’s move on to other things,’ but the fact is, it isn’t gone, and if we move on and don’t complete the job, we set ourselves up for having the disease come right back. Our family and our impact continue to grow each year through our commitment to and support of our Rotary Foundation. Working together creates a synergy that allows one person to truly make a difference. And when we all work together and commit ourselves to a cause, there is no limit to what we can accomplish. In that process we are bound together and become an even more close-knit family. So at this special time of year, as you reflect on your family and the good things in your life, think about your Rotary legacy. Now is the time to make your lasting commitment so that the important work of our Foundation will continue in perpetuity. It's traditional that the first Rotarian magazine of the Rotary year carries a profile of the incoming RI president and his or her family. I've always read those profiles with interest, never giving much thought to the possibility that one day, I might be the one bringing a writer from the magazine to my Rotary club meeting! I have never liked a lot of attention, and the idea of having my picture on the magazine cover made me a bit uncomfortable. But when I saw the photo the editors chose, I smiled. Because the star of that picture definitely isn't me, or even my wife, Esther. It's the flock of flamingos, none of which could care less about Rotary, all strutting past us in the same direction. All of them — except one. It seems that these past weeks are literally flying by and over the next few weeks the Club will be involved in a few fundraising ventures. 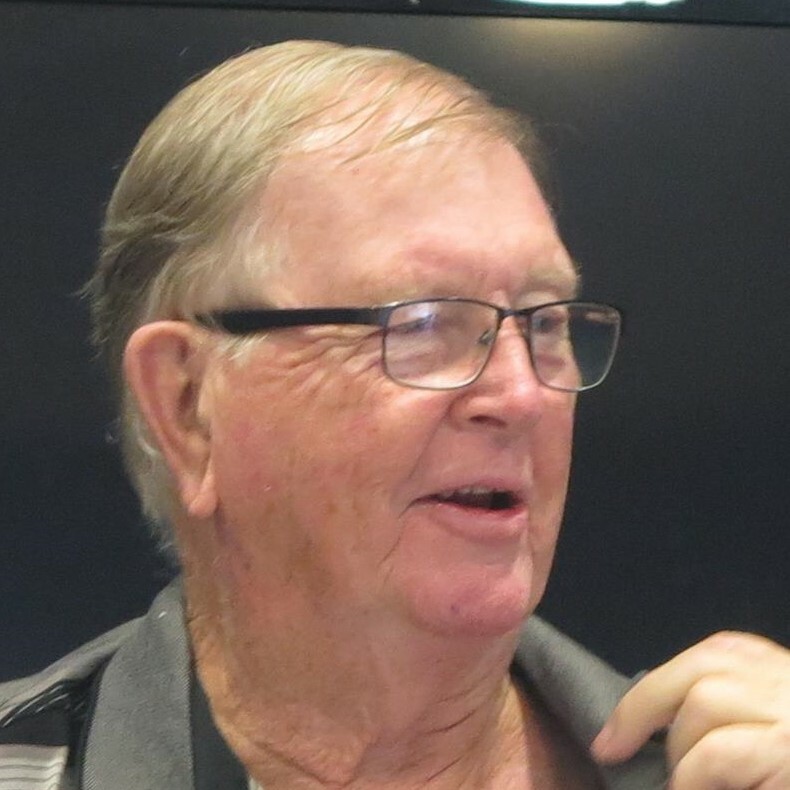 On Thursday 25 October some of our members will be visiting Norm Bourguignon at Opal Retirement at Kawana for afternoon tea and to present him with an Honorary Certificate for his years of Service to our Club. 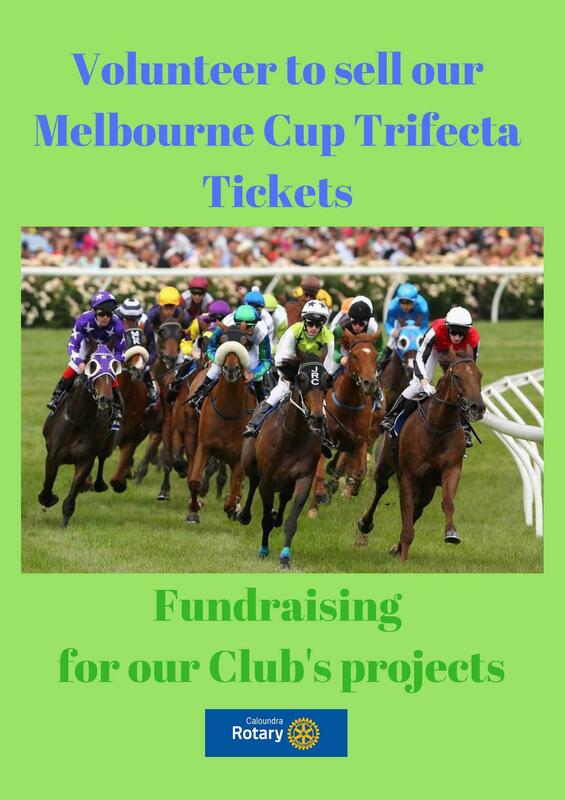 Then some of us will be congregating at Gordon’s home to staple up the Melbourne Cup Trifecta tickets which we will be selling from next week until Melbourne Cup Eve. We will also be asking each and every member to take home a pack to sell to friends and family. This makes it a lot easier and a little less for those volunteers to sell in Caloundra and Golden Beach. So please take as many as you can on Tuesday morning at our meeting. The Rotary Foundation transforms your gifts into service projects that change lives both close to home and around the world. During the past 100 years, the Foundation has spent $3 billion on life-changing, sustainable projects. Why should we donate to The Rotary Foundation? Your donations makes a difference to those who need our help most. 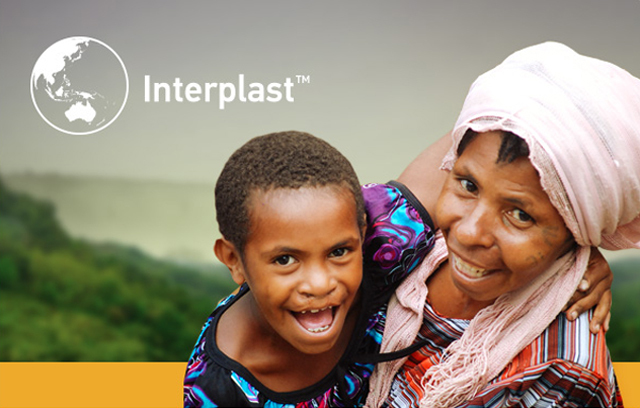 More than 90 percent of donations go directly to supporting our service projects around the world. This old African proverb provides a good basis for measuring the high levels of success of Burnside High School’s STEMM program. 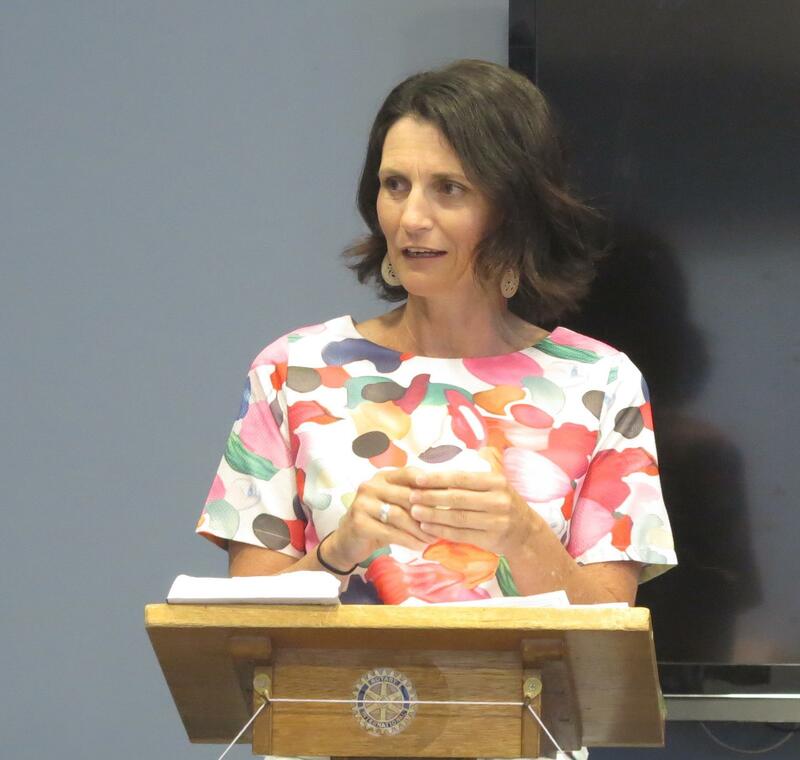 The Supporting Teenagers with Education, Mothering and Mentoring (STEMM) program is the first of its kind in Queensland. Development of a unique, stand-alone curriculum enables pregnant girls and young mothers to be supported in achieving their educational goals. Instead of attending mainstream classes, the STEMM curriculum provides a program tailored around their educational, social, physical and emotional needs in a non-judgmental environment. The program currently has 40 girls participating in this unique educational avenue. 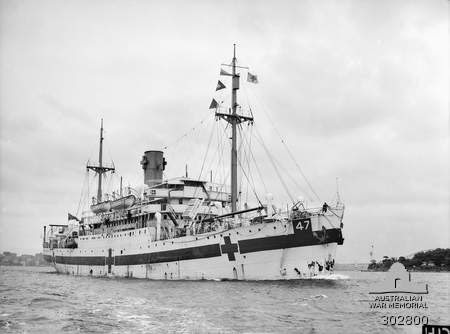 On this day 12 October 1954 …. The US president was Dwight D. Eisenhower (Republican). 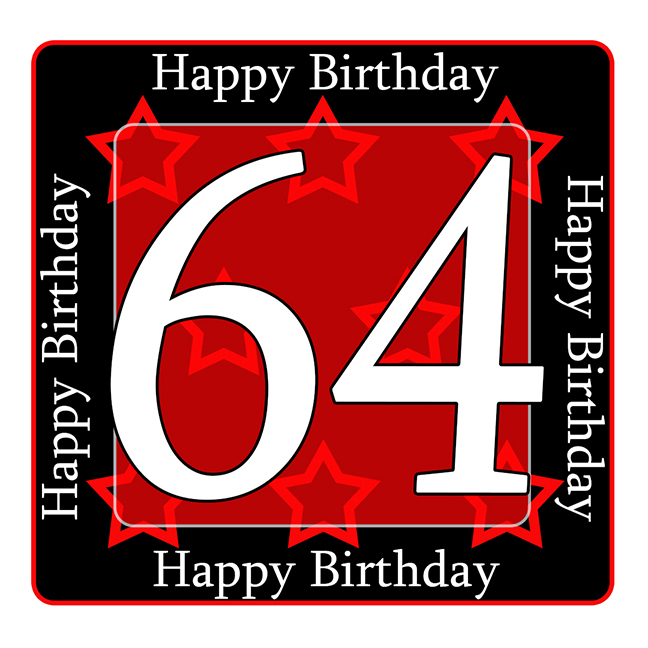 Famous people born on this day include Tom Blomberg and Linval Thompson. 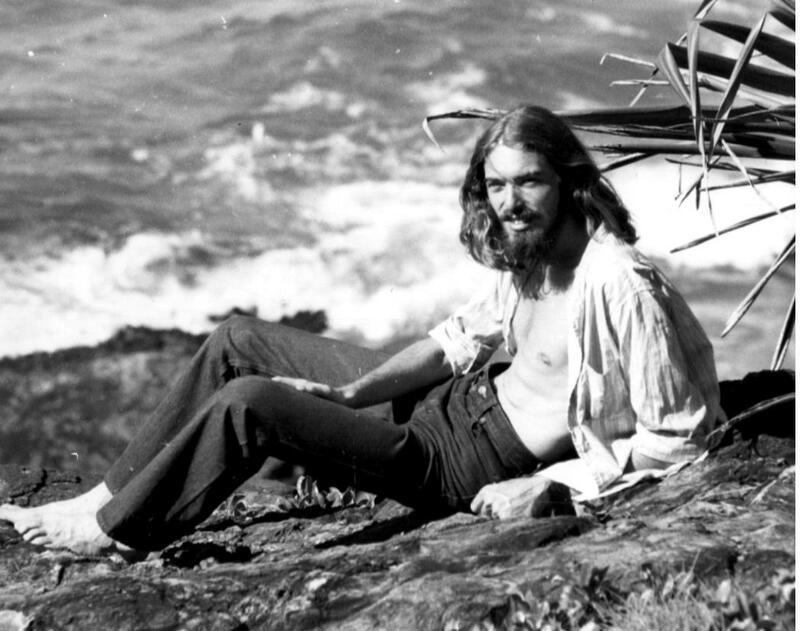 In UK Hold My Hand by Don Cornell was in the top 5 hits. Lease of Life, directed by Charles Frend, was one of the most viewed movies released in 1954 while Not as a Stranger by Morton Thompson was one of the best selling books. On TV people were watching Toi et moi. 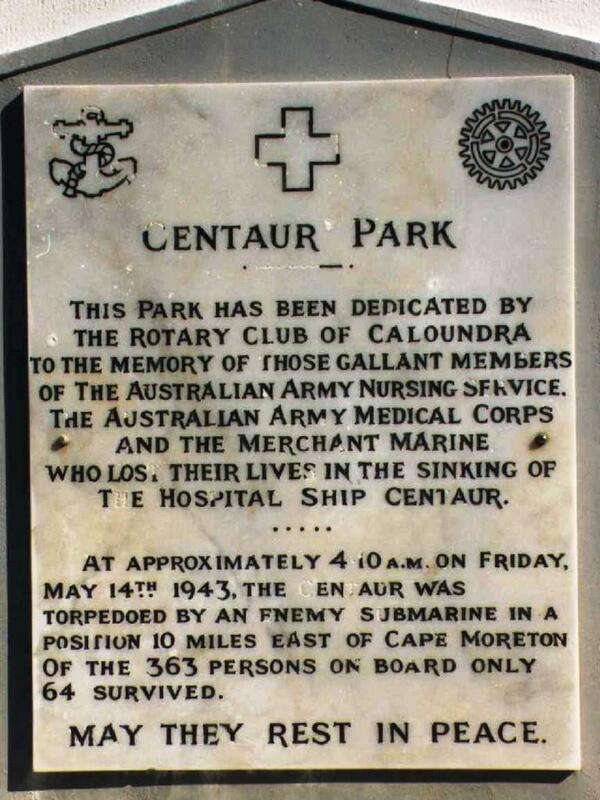 The Provisional Rotary Club of Caloundra held its initial meeting at Caloundra House on 2 September 1954. The club was officially chartered on 12 October 1954, sponsored by the Rotary Club of Nambour with 21 Charter Members. Charter President, Ben Bennett ensured the club's early stability and later continuing success. 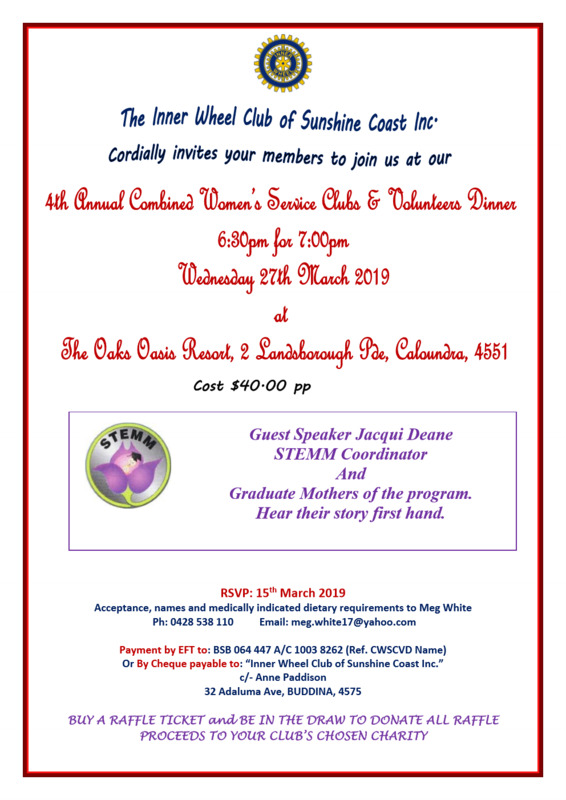 The first Ladies' Night was held on 25 November 1954 but it was not until 1999 that the club opened its doors to women members, and in 2002 the club installed its first female President. 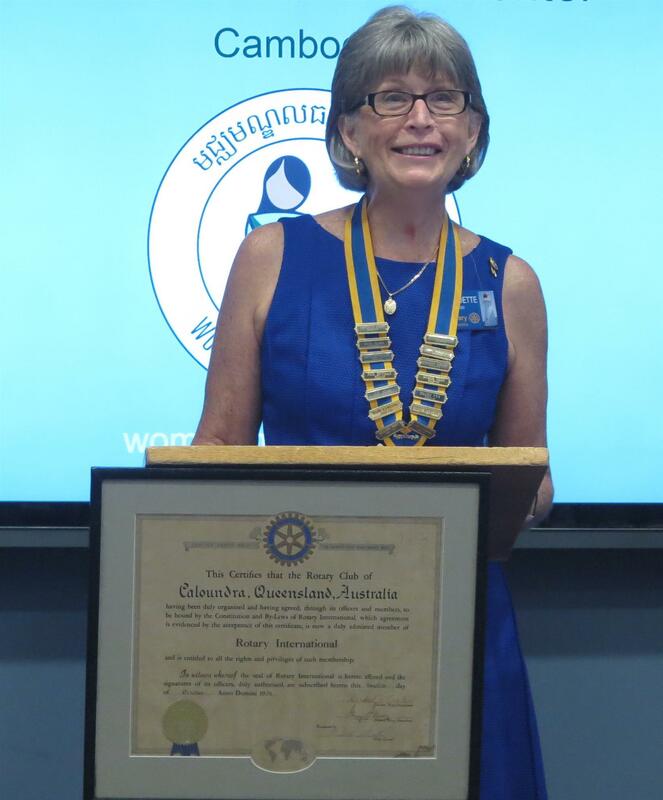 The formation of the club was celebrated at its Charter Night on 19 March 1955 in Caloundra's Glideaway Hall - an a[ppropriate start for an enthusiastic and lusty infant Rotary Club. The first new members were inducted on 9 June 1955. The club now has around 40 members (40% of whom are female). For an account of the club's early history, follow this link. What Committee am I on? 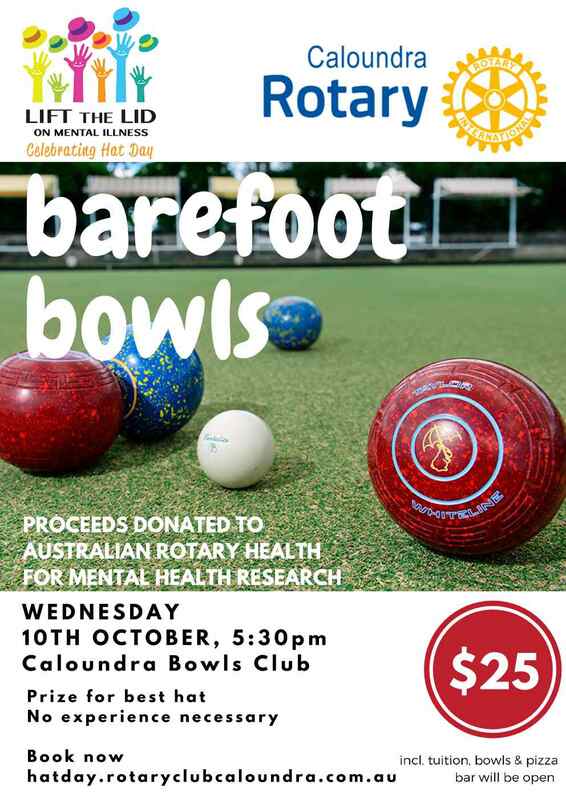 Unfortunately due to the unsettled weather we have been having over the past few days it was decided to postpone our Hat Day Barefoot Bowls night to a later date. 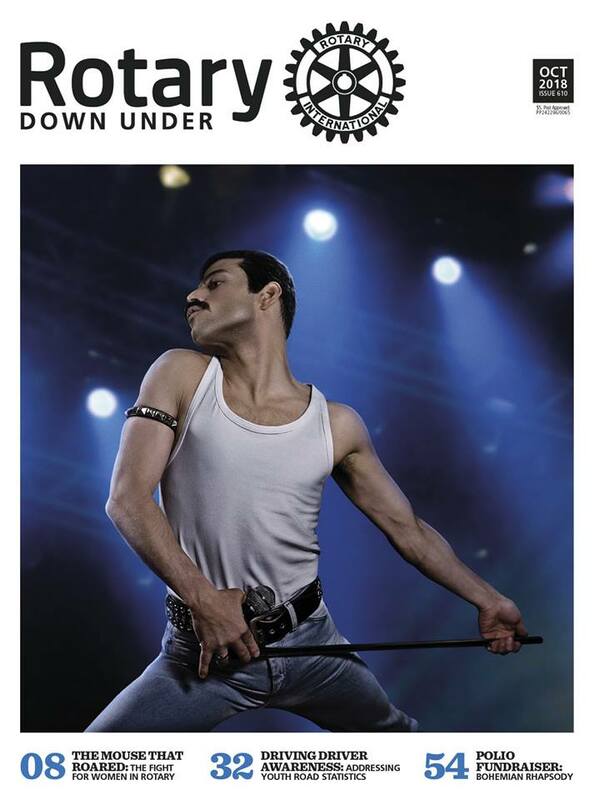 The funds raised will go towards Australian Rotary Health's Lift the Lid on Mental Illness campaign. Mental Illness has become of part of many individuals and families lives all around the world. There are many ways it can affect people and treatment is not always effective. Sometimes it only takes something very minor to trigger a person and send them spinning out of control into an angry rage or into the depths of despair feeling that there is no hope. Spare a thought for them and if you know of someone that is suffering or you think that they need help please let them know that you are there for them. Even if it you are only a sounding block to listen to them over a cup of coffee. It can make the world of difference. Keep your calendars open for our next try at going barefoot bowling and don’t forget to wear your most outrageous hat. I hope that you all have an excellent and happy week. Tickets to see Shrek the Musical at 1.00pm and 6.30pm, Saturday 3 November go on sale from The Events Centre online box office, this Friday. More info can be found at www.theeventscentre.com.au/whats-on/how-to-book or phone 5491 4240. 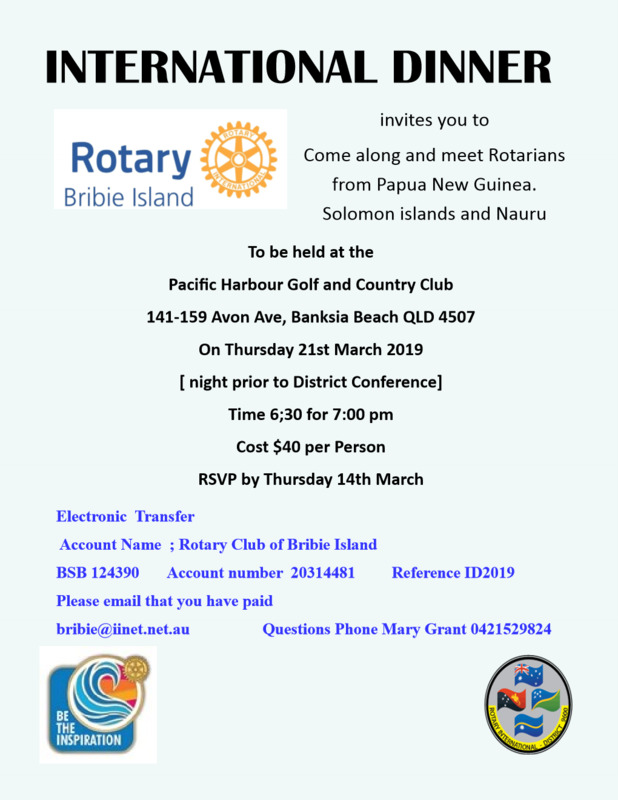 President Bernie took the Chair for our regular Open Forum and Alan proposed a Toast to the Rotary Club of Broome in Rotary District 9455. Rachael was invited to tell us of her vocation which she described as 'a work in progress'. Kath was pleased to officially receive her membership badge following her induction the previous week. Given the unpredictable weather forecast and the last few nights of wild storms, we have made the decision for safety sake to cancel tonight’s event. Stay tuned for a rescheduled date. 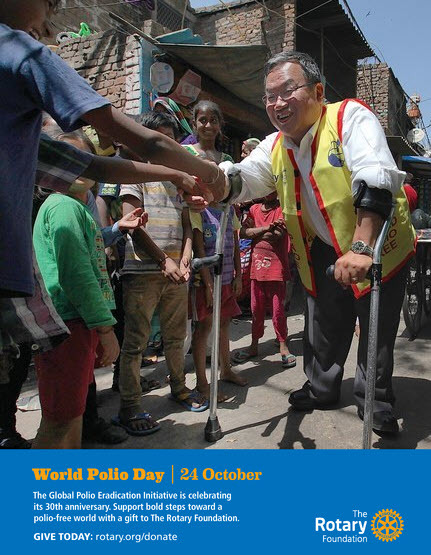 What are you doing to raise awareness of #WorldPolioDay on October 24? Caloundra for Hat Town Australia 2018? 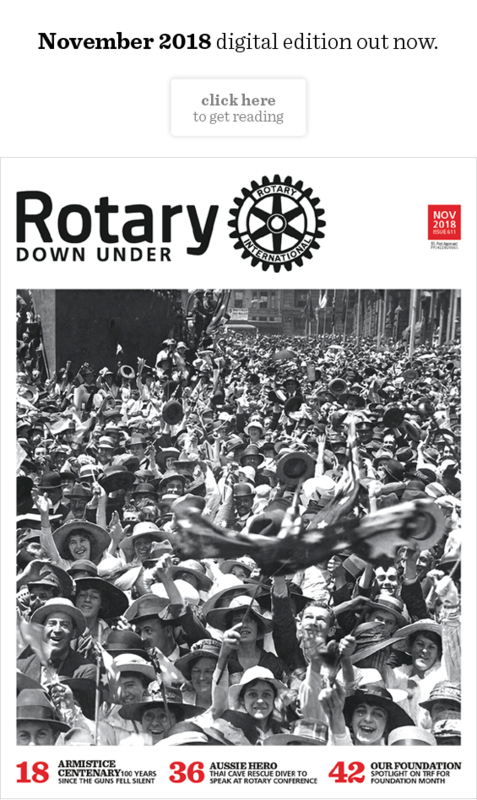 For the first time in 2018, Australian Rotary Health will be looking for the Hat Town of Australia! 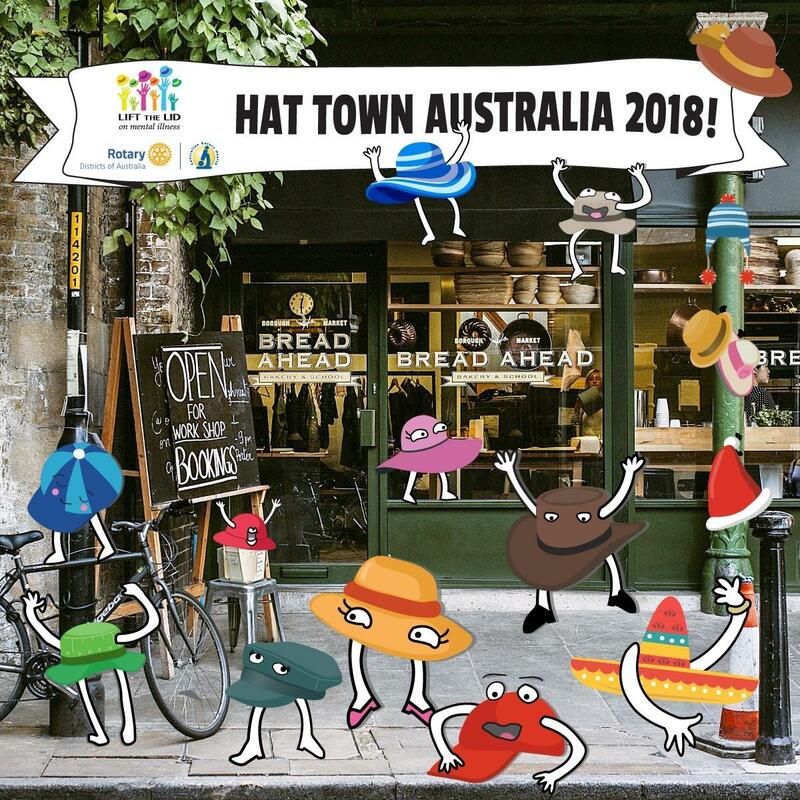 Simply decorate your town with hats, snap a few photos and send them to: news@arh.org.au for a chance to claim the title. Entries close 1 November 2018. "I was born in Rochdale Lancashire England, living on a fire station were Dad was a Fire Officer. Although it may seem strange to some the Fire Station was a great playground, we climbed the 100 foot tower, crawled through the underground passages (used for breathing apparatus training) all of which we were of course banned from entering. On leaving school I first trained as a hairdresser, then became a nurse. Eventually I married Ian, had a daughter Amanda and settled down in suburbia, that is until one day reading the newspaper I spotted Ian’s job description in a recruitment advert. Ian at the time was looking to move, he applied and got the position which meant moving to Hong Kong where we stayed until the 1997 Handover to China. Living in Hong Kong was a fantastic experience totally different to suburbia in England, the pace was fast both living and working. School holidays, a rain-free day, a trusty band of volunteers and a team effort produced a magnificent outcome for our club's projects! But Gerry wants an assurance that the BBQ effort is not retiring with him, so let President Bernie or Gerry know if you can help Judy - 'cause it takes at least two to tango! You can even comment on this article. Supporting studies for career-minded professionals related to economic and community development. Born in Hayes, Middlesex an industrial town to the west of London in 1951, Chris was relocated to Cheltenham in Gloucestershire as a six-year old when the family moved to accommodate his father’s job. Engineering being in the family, it was only natural that at 16 he started work as a Mechanical Engineering apprentice gaining experience manufacturing parts for Commercial Aircraft Undercarriages and fuel system components for the RAF Harrier jump jet. Not content to stay on the factory floor, Chris was given his chance designing heat exchangers and later roller bearings. He also had spells as a Project Engineer at Ina Bearing Company’s plant in South Wales and later as Bearing Line Supervisor. It was in South Wales that he formed Llanelli Athletic Club with a good friend Paul Oram. Have you caught up with Chloe's doings? Ahh, School holidays are upon us and for four nights we had the pleasure of the company of two of our Granddaughters from Bundaberg. It has been a couple of months since their last visit and we have noticed such a difference in them in that time. Holly the eldest has just turned 15 and of course is a typical teenager concerned about what to wear, makeup, her mobile phone and sleeping. Her first question though when she arrived on Saturday was are you going to Rotary on Tuesday morning. May I come with you? I was delighted that she wanted to come to our meeting. Since the tender age of two she has been aware of Rotary and has known and loved all of the exchange students we have hosted. There is even talk of her wanting to be involved in the Rotary Youth Exchange program. Holly was most impressed with the talk given by Stuart on the SPA-TAP program and has asked for more information to be sent to her as the College she attends in Bundaberg raise funds for many projects and she thinks that this would be ideal. Because of Holly’s enthusiasm in wanting to attend our Rotary meeting 11year old April wanted to come as well. April loved it and thought the breakfast was great. She loves her food. So I was blessed with our two granddaughters attending our meeting and enjoying being in the company of an older generation. 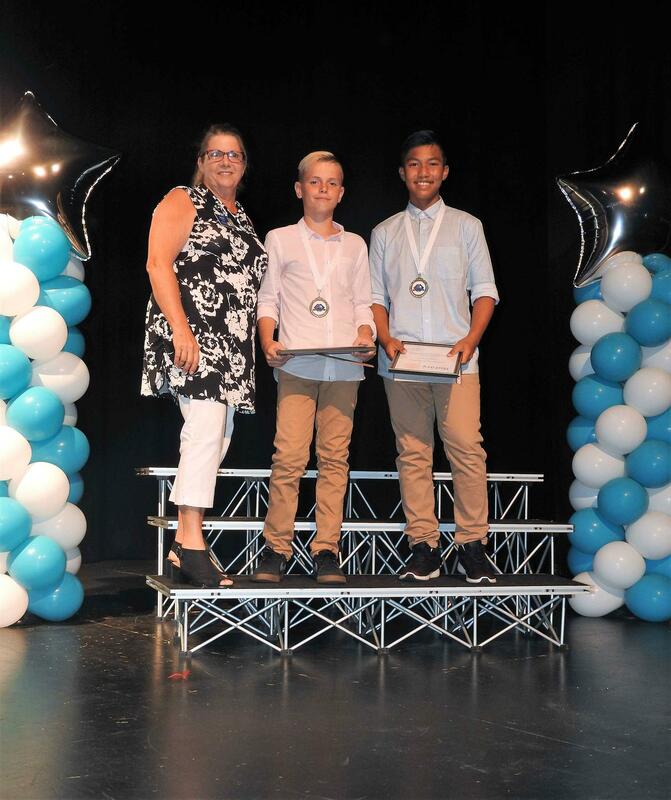 They both would like to be involved in community work so I will contact the clubs in Bundaberg and ask them if they have any EarylAct or Interact Programs in the area. While staying with us the girls were so interactive and caring with their Great-grandmother Maureen and they spent a lot of time asking her about what she did when she was young and telling her about their activities in and out of school. Rotary not only involves community but also families and I see this as I watch my grandchildren grow and mature in the Spirit of Rotary. I hope you have another delightful week. 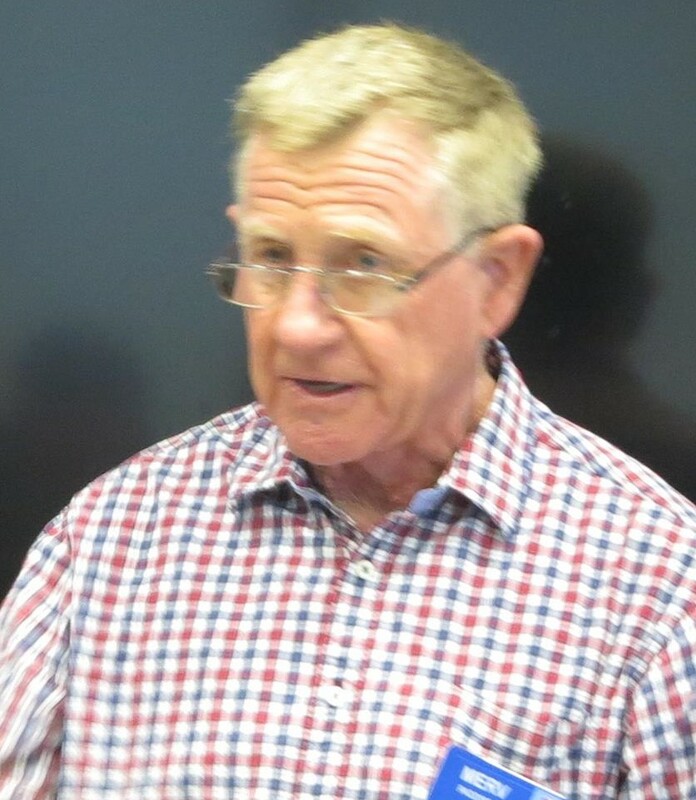 Roger took charge of our meeting and welcomed our Guest Speakers as well as Honorary Member Jan, Kath (hopefully being inducted next Tuesday morning), Michele (RC Five Dock, Sydney) and two of President Bernie's grand-daughters Holly & April. He then introduced himself and his vocation as an Architect giving some background on his calling and telling us about igloos. What does a RAWCS Project mean? Often Rotary Clubs are not aware of grass roots international projects that have started from nothing to gain strength through persistence and dedication. Especially RAWCS projects (Rotary Australia World Community Service Projects) which give you the security of knowing that the money you donate goes exactly where it should. Well Umoja Orphanage Kenya is a project of RAWCS. See where we began and where we are now seven years later, having now been open for two years. As you can see we have continued to move forward, sometimes ever so slowly, but always forward. We are not allowed to mention your age now or then, but reaching this milestone is one of the qualifications to obtain a licence to drive a car unsupervised in Queensland, Australia! Enjoy your day on the Gold Coast. However, there is a slight error in this week’s Reel. Now I know the answer, my notes do resemble the correct last name but then I did not have my eyes on when I scribbled the name down! Today, one of our six areas of focus is promoting peace. Every Rotary service project, whether funded with a district grant or a global grant, has an impact on peace. It could be a peace project, a water and sanitation project, a basic education and literacy project, an economic and community development project, or a project in one of our human health-related areas – maternal and child health or disease prevention and treatment. It really doesn't matter. The ultimate outcome makes a positive contribution to our world by improving the quality of life for those affected, and that improvement is an element of peace. Every Thursday morning, I receive an email from the World Health Organization with an update on the status of polio eradication. 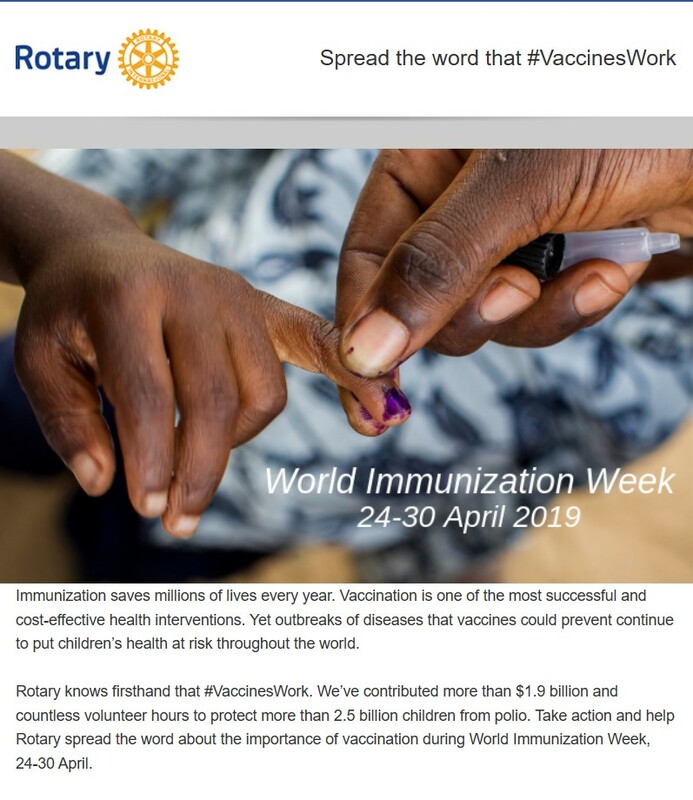 It contains a wealth of information, country by country: where and how immunization campaigns are being conducted, how many millions of children are being vaccinated, and where environmental surveillance has found evidence of circulating virus. But every week, when that email appears in my inbox, my heart seems to stop for just a moment until I read the first few lines – and learn whether a child was paralysed by wild poliovirus that week. Born 1946 in Tomar in a post-war depressed Portugal. Father migrated to Mozambique in 1947 looking for work. 1948 my mother and I followed. 1954 moved to Nyasaland, now Malawi. Educated at Portuguese school. 1958 went to St Andrew’s school in Blantyre, aged 12 and not speaking a word of English. 1963 family moved to Northern Rhodesia (Zambia). Joined Cooper Brothers (auditors) as articled clerk. First day of work was in a six seater plane to Lobito Bay, Angola as one of a team of auditors. Work trips to Portugal, England, Congo, Rhodesia, Mozambique & Malawi followed. Completed accounting qualifications as ACCA and ACMA after working and studies in UK. 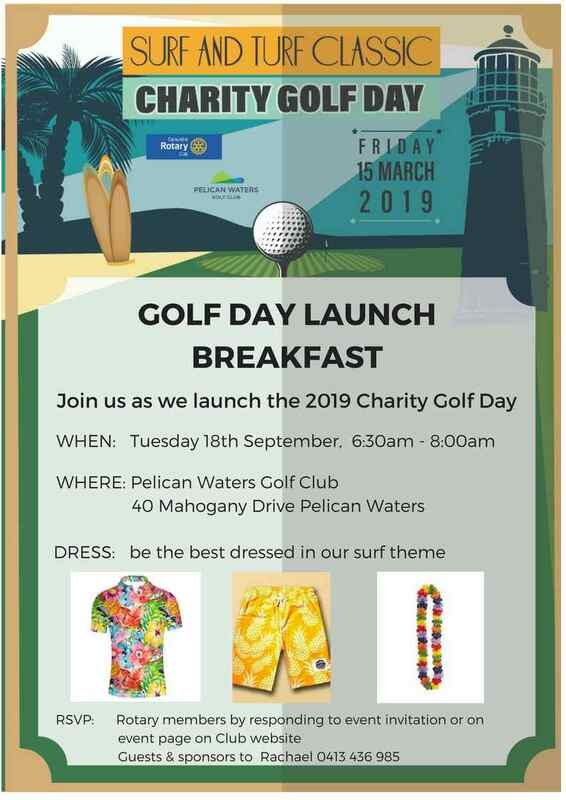 A lively crowd joined us at the outstanding Pelican Waters Golf Club to launch our Surf and Turf Classic Charity Golf Day for 2019 on Friday 15 March. 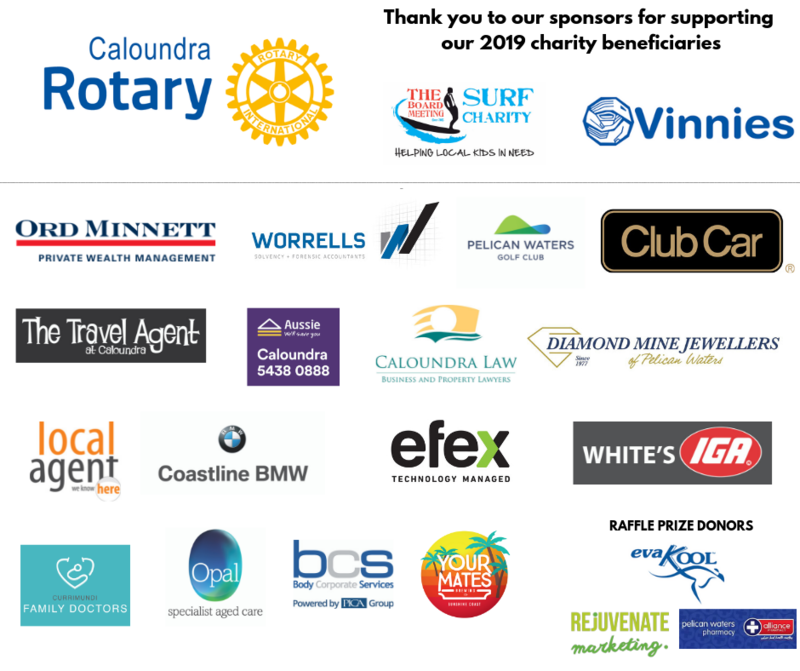 We are proud to be supporting the vital work in our community through Vinnies, The Board Meeting Surf Charity and of course other projects supported by Caloundra Rotary! Many of our members this morning dressed in the surf and turf theme! 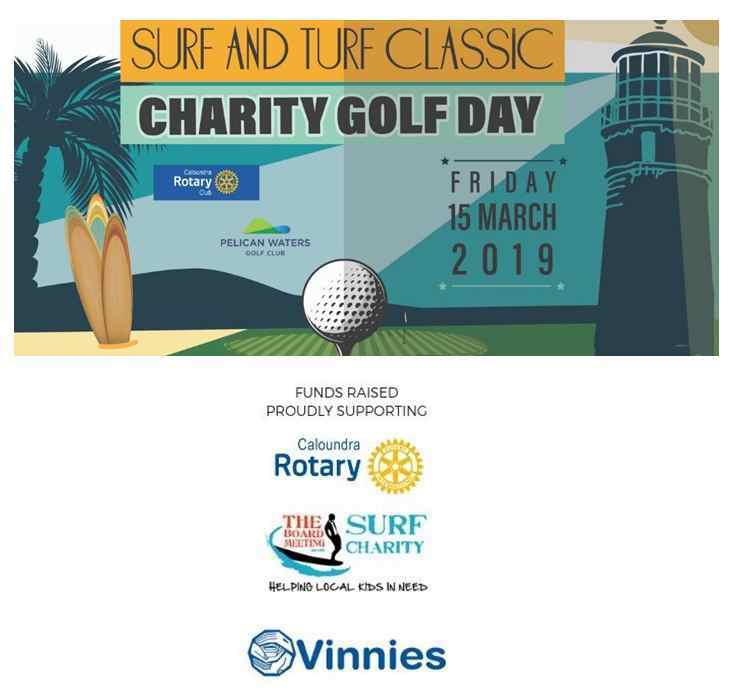 Deb Taylor chaired the meeting and welcomed Mark Skinner from The Board Meeting Surf Charity, David Lang as well as Geoff Hopkins and Paul Warren - President & Secretary of the Mooloolaba Rotary Club visiting to check out our golf day preparations. Trevor is the Principal of Caloundra Law Business and Property Lawyers. He chose not to follow in the footsteps of his father and grandfather who were both Railway workers. Instead Trevor pursued a career in law. He qualified in 1981 after completing five years of training with a commercial law firm in Gympie. 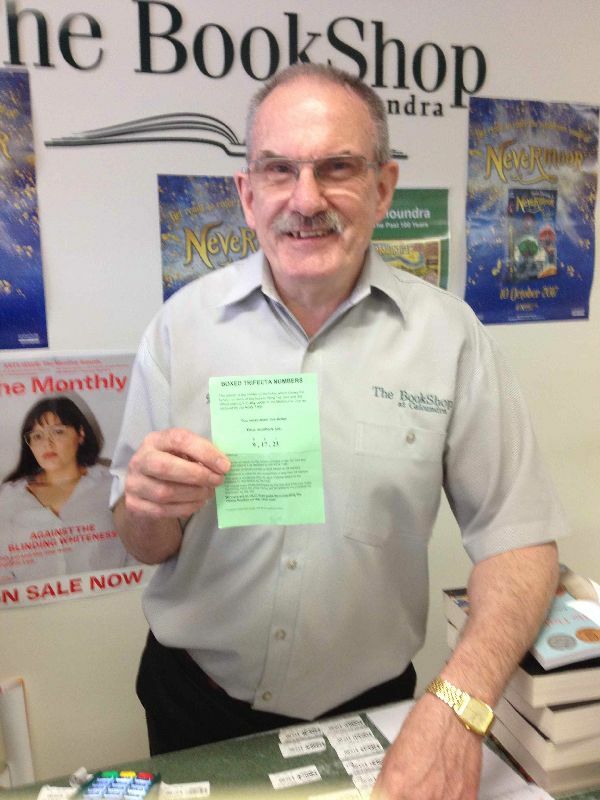 Trevor has been living and working on the Sunshine Coast for the last 33 years. He married a local girl (Gina) in 1985 and together they have two children, neither of whom have any interest in law. What does ROTARY mean to me as an individual? Being a Rotarian has shown me more awareness of how much you can be involved with the Community. It can be a small amount or it can be fulltime depending on your availability depending on your family and your work commitment. It doesn’t matter how much but what you are able to do. I have come in contact with some amazing people and made long term worldwide friendships since I have been involved with Rotary. Fellowship, friendship and making a mark in the Community through Rotary has been an inspiring experience. 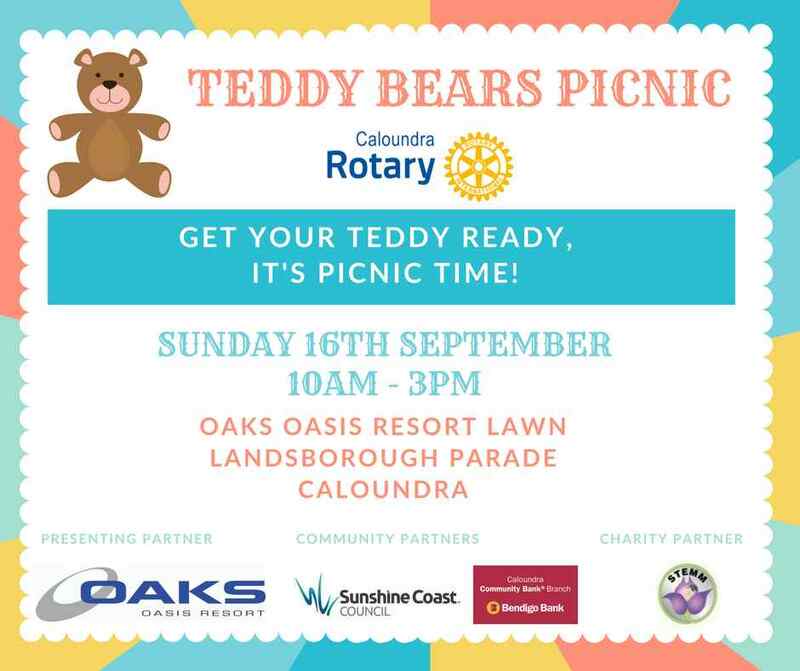 Don’t forget our Teddy Bears Picnic on Sunday at Oaks Oasis Resort and any amount of help will be appreciated. Our Charity Partner is STEMM and they need all the help they can get. "Huge thanks to you all for the overwhelming response for the Teddy Bears Picnic this Sunday – your help is very much appreciated. "Please find attached a site plan and roster for the day. Take a moment to check that your role and time slot has been recorded correctly and let me know if any changes need to be made, some of you kindly registered via ClubRunner but hadn’t selected a time slot so a good guess has been made, flexibility is completely possible. "The site plan clearly isn’t to scale, a guide only so you have an idea of the direction you will be heading. If you can plan to arrive a few minutes early as there may be a challenge with parking, all going well! Entrance is via the double gates on Landsborough Parade, just head towards the water park end of the resort and I’m sure you will find us! "Please sign on as a volunteer in the Rotary tent on arrival so you are covered from an OH & S point of view. "Given we don’t know how many guests we are expecting and when they will arrive, there may be unexpected bottlenecks at times, our plan is to keep an eye out for one another and direct volunteers where they are needed as best we can. "The promotion of the event this week has been well received by child care centres, schools and the media which is encouraging. 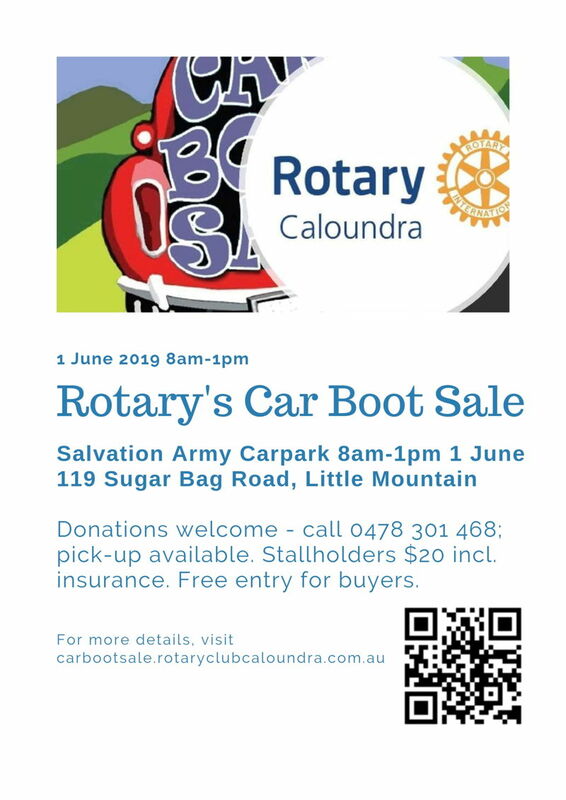 "Thank you again for your support, feel free to make contact to clarify any queries you have, otherwise see you Sunday with your Rotary shirts and smiles on!" President Bernie took the chair for the latest of our Open Forum meetings where members have the chance to involve themselves in club matters from breakfast venues to fundraising activities. But first, Bernie welcomed Kath Aspinall again who we are pleased to announce will be joining us as a member next week. Kath will bring a lot of life experience to the group especially from her time at Inner Wheel and we all look forward to working with her. The Open Forum format allows members to talk about subjects that are close to their hearts and Anna gave a short speech about how she would like to stay with the club despite the distance she has to travel to meetings. She is looking now at opportunities for house sitting in the Caloundra area as the unit she has been staying in when she visits us will no longer be available. She clearly considers our club as an extension to her family. All our Tuesday morning meetings in September will be held at Pelican Waters Golf Club. One of the local Rotarians opened their home to the kids - swimming games, lots and lots of food - even chocolate. ... awesome! The sounds of genuine laughter and excitement was an honour for Darry to be part of. The previous day Mark & Darryl attended the Shepherds Arm Orphanage to distribute the gifts from our Rotary Club of Caloundra. Darryl says it was probably one of the most humbling experiences of his life - 24 kids over the moon with appreciation for what we all take for granted: a tooth brush, shampoo, soap, some small stationery items and new underwear. The smiles and laughter from each child as they opened their gifts will stay with him forever. He even took the time to Facetime his similarly aged grandkids so as they may share the experience. Both Jett and Zahli spoke with the kids and soon everyone was talking back and forth the giggling was magical to watch and listen to. Merv Paddison was born in Toowoomba in 1946. After completing his primary and secondary education there, Merv went to Teachers College at Kelvin Grove in Brisbane in 1964. 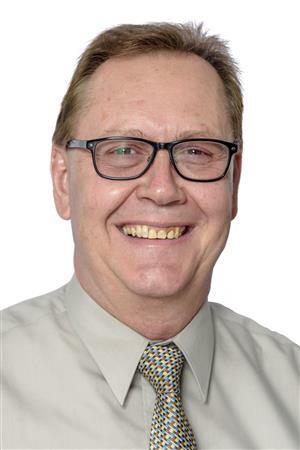 His teaching career began at Rangeville State School in Toowoomba. By July 1967, he was appointed to a one teacher school at Watson Crossing State School, 27 miles south east of Texas. Several transfers followed over the years until Merv was appointed to Golden Beach State School as Principal in 1985. He remained there until 1999 and retired in 2000. 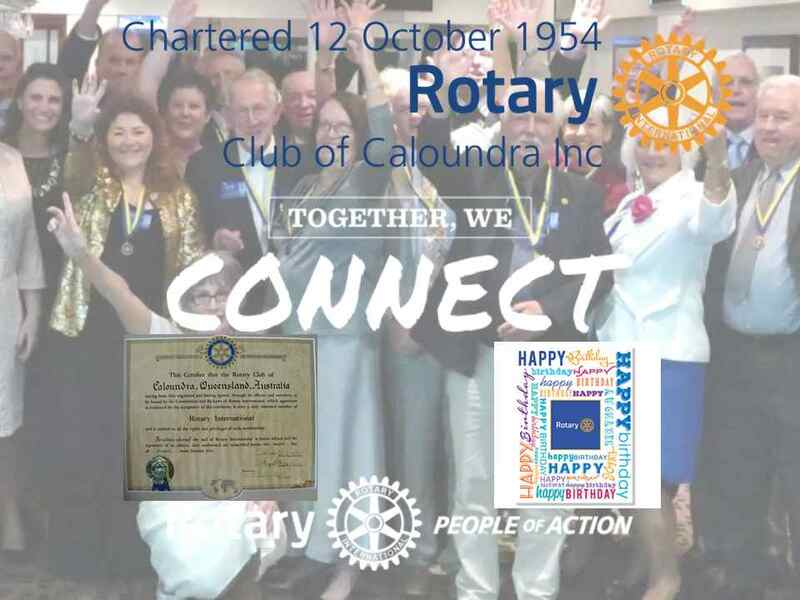 While at Golden Beach, Merv was invited to join Rotary and was inducted into the Rotary Club of Caloundra on 23 May 1987. His wife, Anne, was a special guest at that memorable meeting. Because of his teaching background, Merv soon became Youth Service Director. 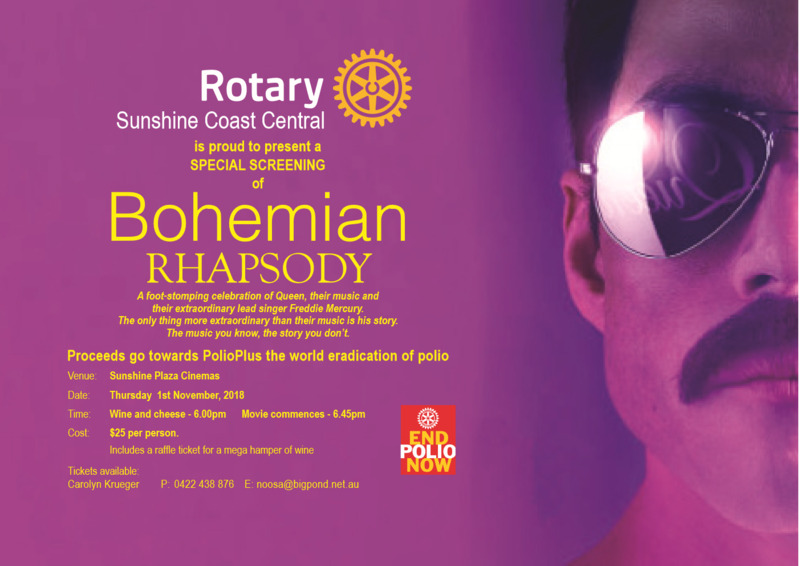 He was President of the Rotary Club of Caloundra for the 1993-94 year. It was during his term as president that the club voted to invite women into this club. However, the first woman was not inducted until 2000 when the club changed to a breakfast club. 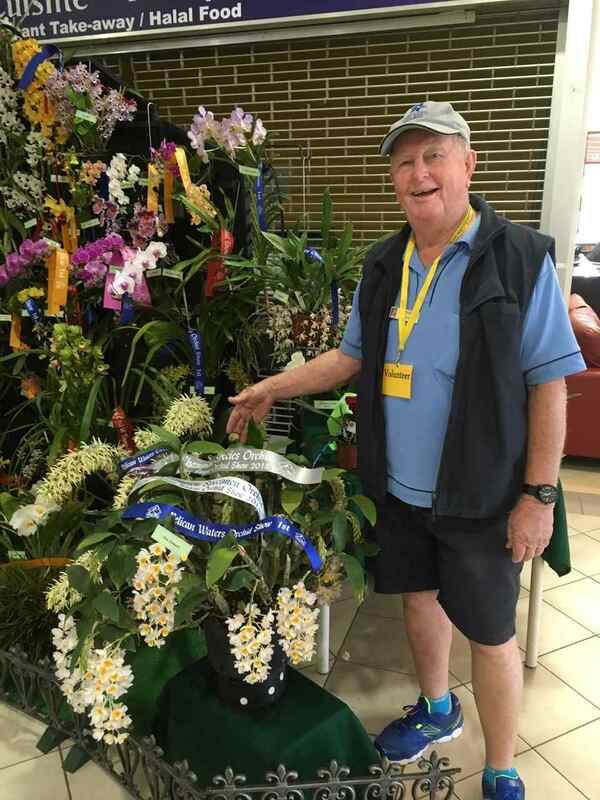 Gerry certainly knows what he’s doing in regard to orchids! He has won a Grand Champion of Species and a Champion of Species and a First Prize. Mark Ward and Darryl Laing are overseeing this project on behalf of the club for about a week during the construction period 3-16 September. On the morning of the second day, Darryl reports that all is going to plan - all the purchasing was completed yesterday after a full day shopping in a very congested town - definitely third world. Purchases being delivered to the orphanage this morning after breakfast and a walk on the beach. Let the project start! This week's meeting is our regular 'Open Forum' to discuss matters arising from the Board meeting the previous afternoon, as well as other matters of interest to our members. Straight back from her European jaunt, Megyn was thrust into the chair of our meeting which was to hear from eight of our retired members about 'Is Retirement what I thought it would be?'. But first Alan proposed an International Toast to the Rotary Club of Berne, Switzerland which is in Rotary District 1990. The crisis being faced by our farmers in Queensland and New South Wales, in this expansive drought, has focussed our minds on how we, in Australia, need to look after each other and to look for innovative ways to manage our rugged land. The Board determined that District 9600 needed to show our support for those at the coalface, working to give service to help Aussies through the tough times ahead. As a Board, we have allocated, on your behalf, $10,000 each to three of the RAWCS Drought Relief Programs …. Ann Rattle has offered to make Teddy Bears to sell at our upcoming Teddy Bears' Picnic. All I am asking is that every member donate a hand towel so that Ann can do her thing and make these cute Teddy Bears. If you can help, please bring it along to next week's meeting. It doesn't matter what colour. 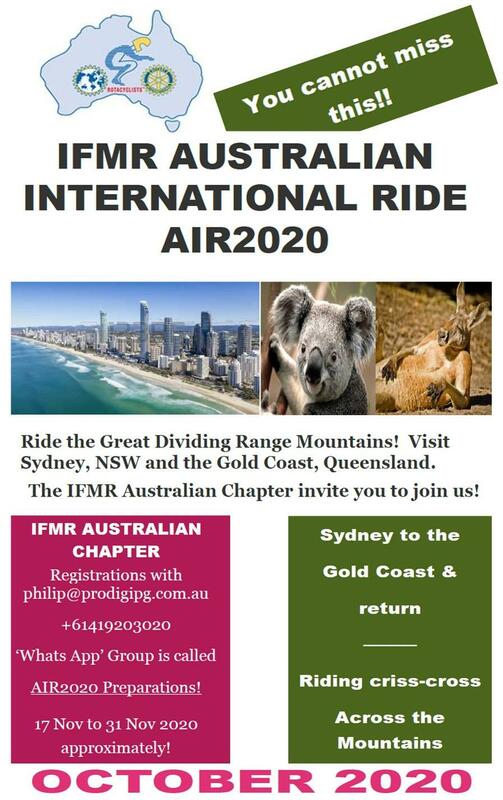 Lots of fun things to see and do, gold coin entry, food to enjoy and memories to be made. Be sure to bring along your favourite teddy as you could win a fabulous prize. Loads of fun to enjoy!